Had to share this one. My buddy Rich walked into what MAY be a heck of a deal. 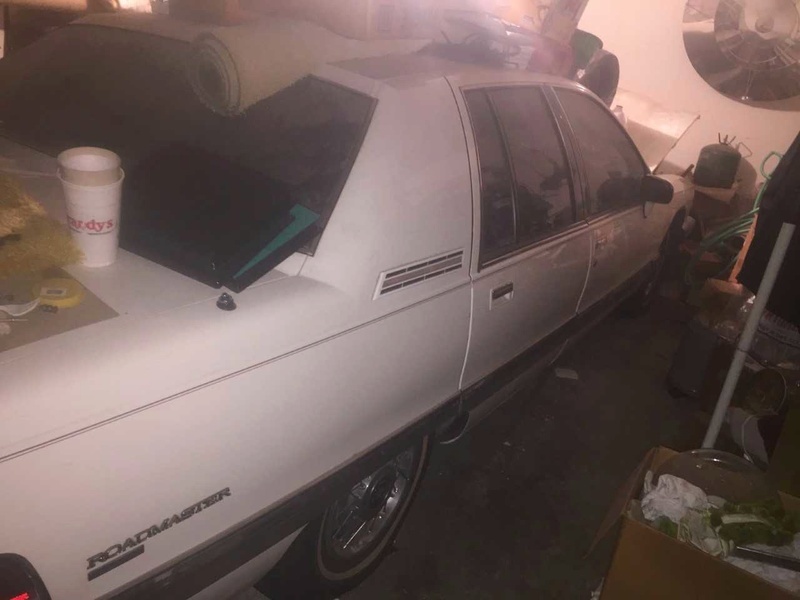 A friend of his mentioned that his mother-in-law has passed, and her car was still in a garage up in Dallas, and has been sitting there for around two years, untouched. 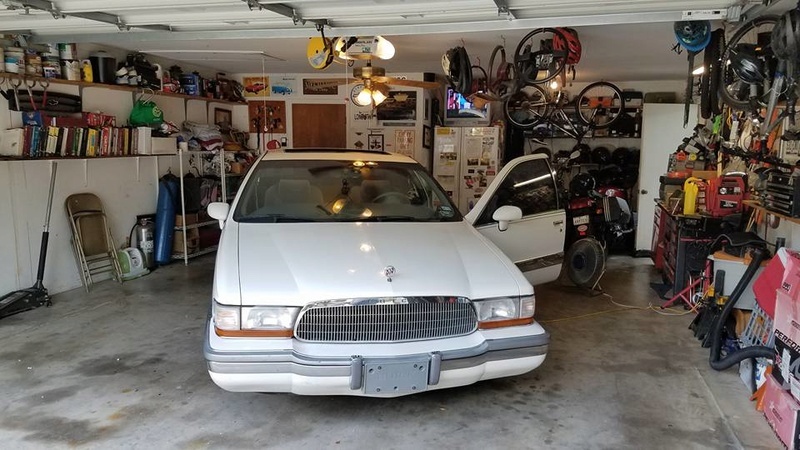 Rich, being a car-guy, asked what it was.. (Rich is who I sold my '89 Custom Cruiser wagon, and my '96 Roady wagon...which thankfully I was later able to get back from him. 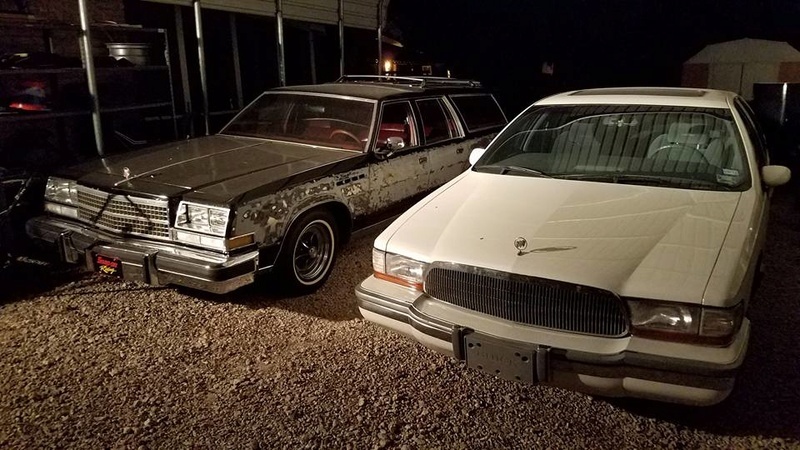 He also bought my black '93 S-10 pickup, the brown '79 Electra Limited, and I bought the '88 Cutlass T-top from him...and he gave my son Eddie that '78 Electra wagon project...we do this, REAL car nuts! Ha!). 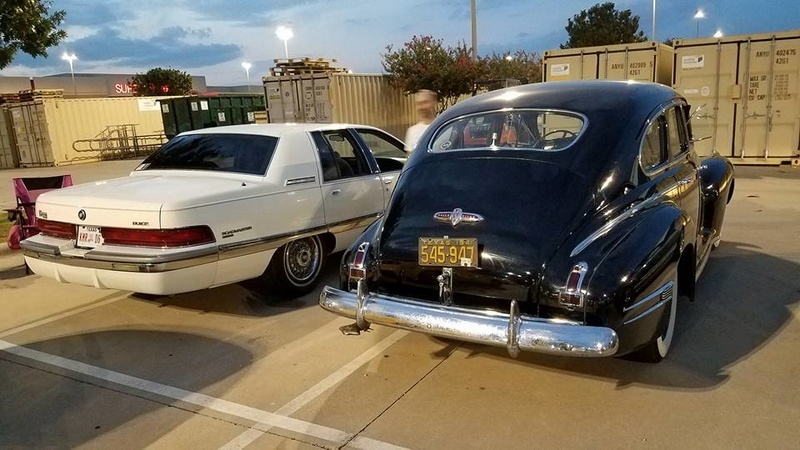 ANYWAY his friend in Dallas said the car was a big Buick, and later, a Roadmaster, which of course perked his ears up. He was somewhat let down when he found out it was a sedan and not a wagon, and that it was a '92, so not a LT1 car. 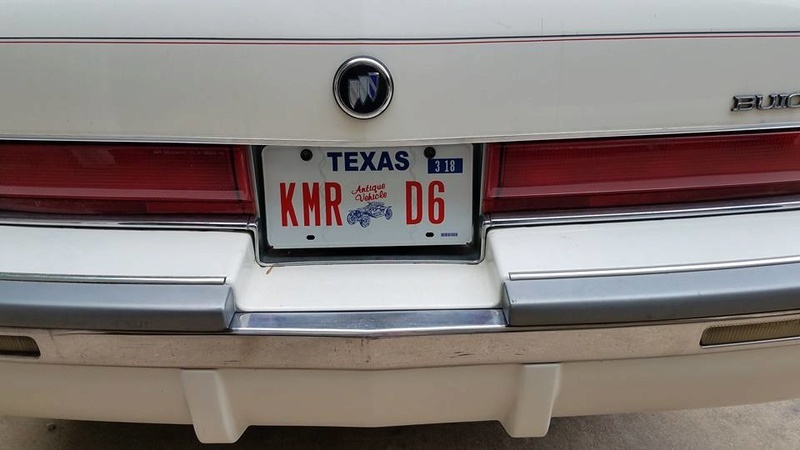 But he did get interested when he learned the car was a low-mile, 2-owner Dallas car. The friend send Rich the pics I pasted below, and Rich made his an offer based on the pics alone...which was low, but again, site-unseen and sitting for years.....who knows? The friend accepted the offer, and the car is being shipped down here today. The details are what sold it. 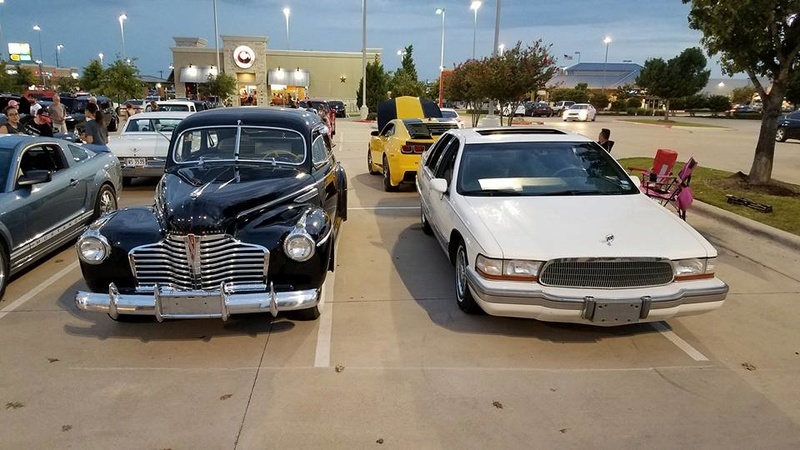 It's a two-owner car. 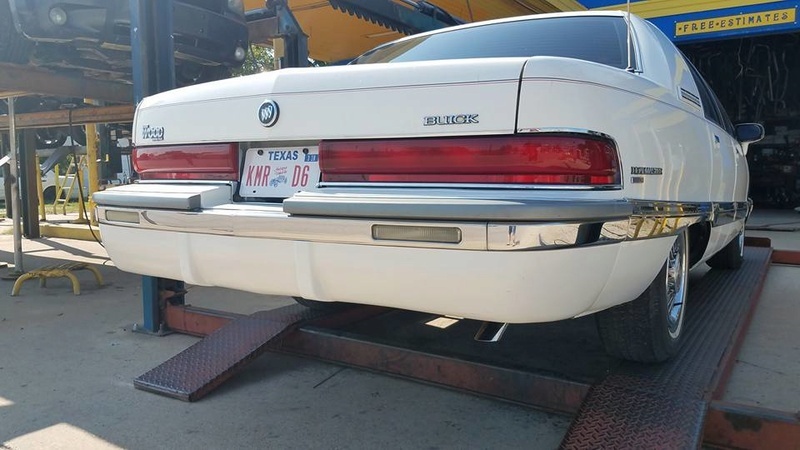 The car only has 77K miles on it, and has been in Dallas since new (built in Arlington, so BORN in Dallas). 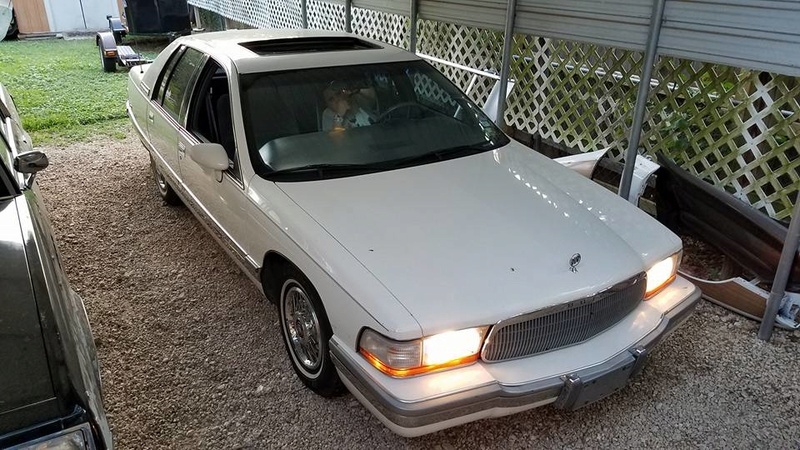 The mother-in-law bought it with 30K miles at a Buick dealer in 1997 (trading an '85 Pontiac Parisienne for it). She drove it the rest of her life, and it's always been garaged, never wrecked, never seen salt or snowflakes. 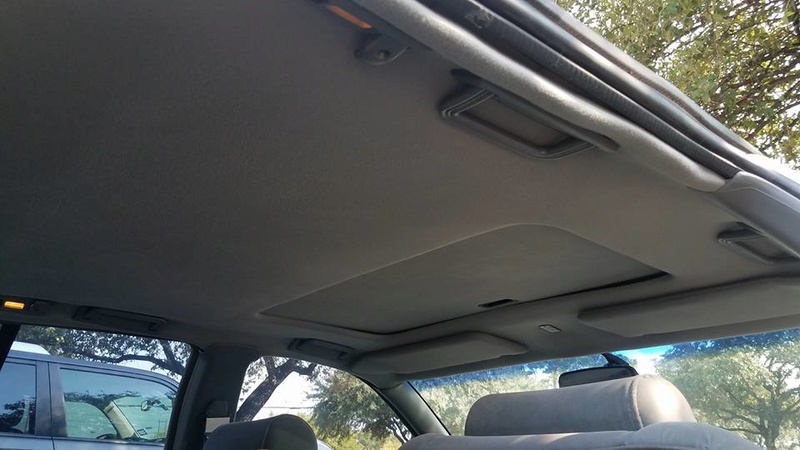 The car is a 5.7 TBI 350, smooth-top Limited with cloth seats, which is great for a Texas car, no burned vinyl roof, no hot and dry/shrinking leather seats. Under the dust it's supposed to have great paint, no wrecks, zero rust, again was always garaged. The pics below are all he had to go on. Hopefully the car looks good all cleaned-up and comes back to life! 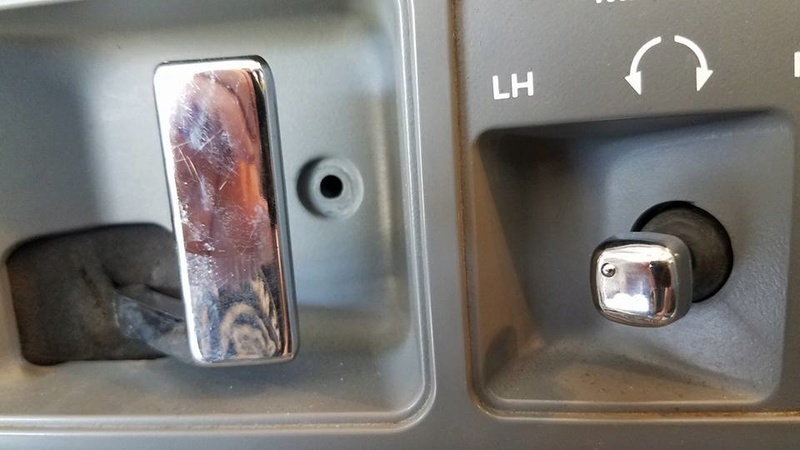 I can see the white printing in the turn signal stalk for the cruise control and wipers still looks bright, which is a good sign for TRUE low-mileage. Also the horn buttons are still on the wheel..another sign of a car that's led an easy pampered life. I'm really looking forward to seeing the car in person, and installing the wheels and tinkering with it. 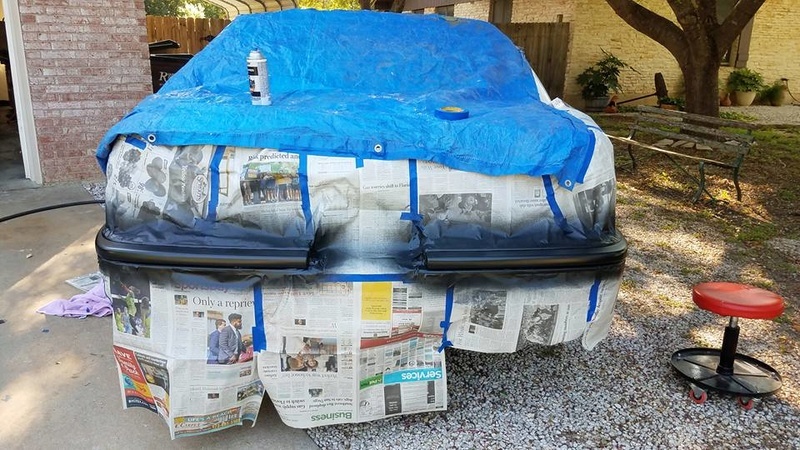 LOVE a project, even when it's a friend's car! 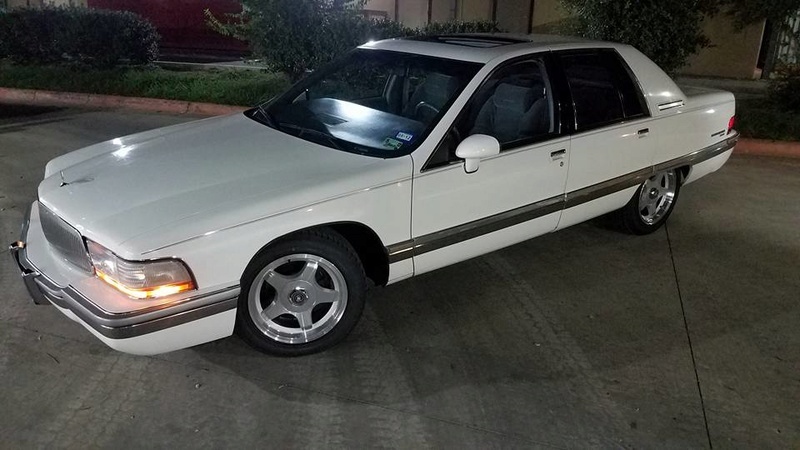 Ran down to San Marcos to pick up the Impala SS wheels last night. 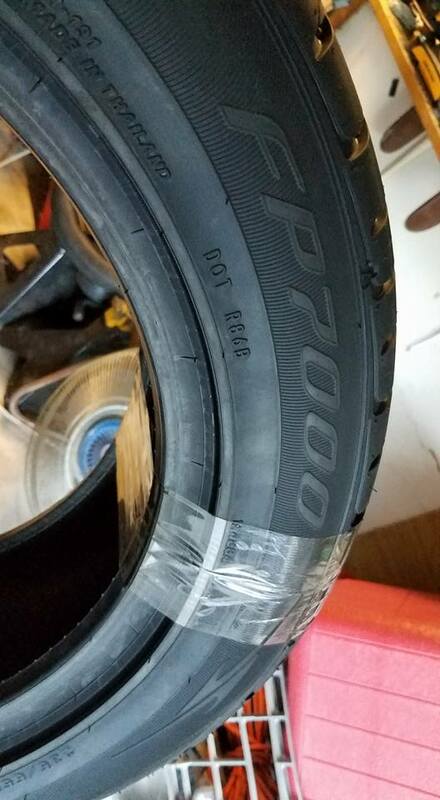 Going to strip the clear off, polish them, and install my custom center-cap decals, and then look for tires this weekend. 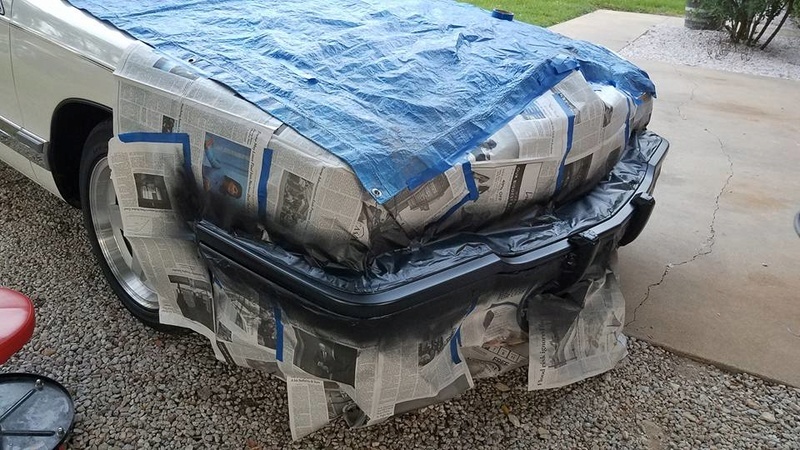 Will post pics of the car once I see it myself! San Marcos is a beautiful little town and the San Marcos River flows right through the middle of it, and is crystal clear. We stopped at the park below Texas State University and I let my kiddo Tuck, who had tagged along with me, jump in the river...at 10pm! Love our adventures! Ha! Summertime! 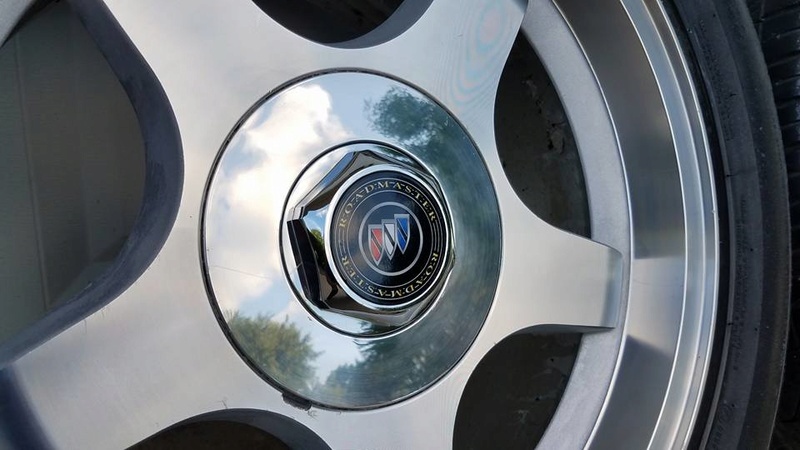 Here are the center cap decals I make for these wheels, and a finished wheel. Always push them at the flaring end of the horn symbol, they will last a long time. When people push on the outside edges, the button jams, and the guide posts crack, leading to a broken button. 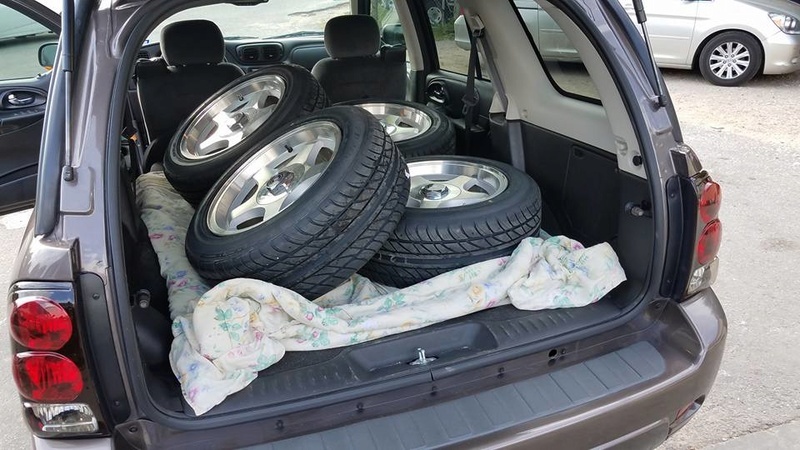 Thanks, I'll mention that to Rich when I give him the Impala wheels for the car. Appreciate the tip! 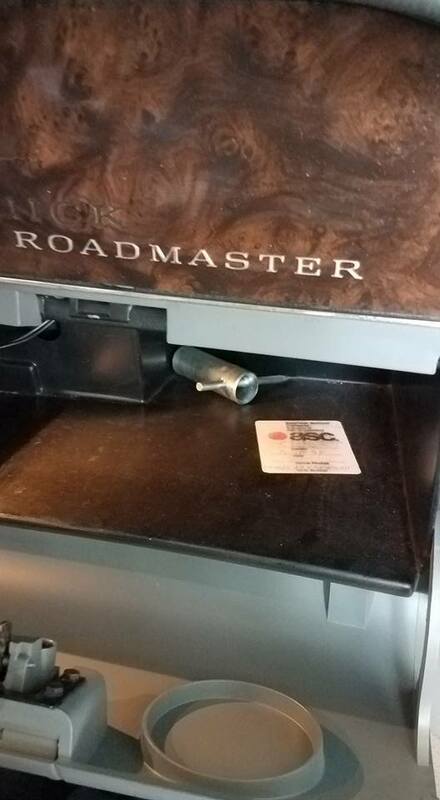 The Roadmaster Sedan arrived. Looks really good for a car that's been parked in a garage since 2012. 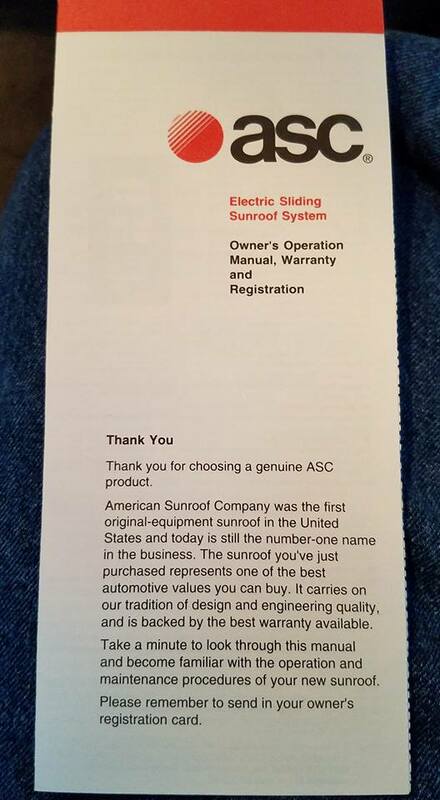 Didn't know it had the ASC sunroof. Needs the grey side trim along the beltline (typical) but really nice other than that! You had the choice of light gray, dark maple red, or dark sapphire blue in 92. 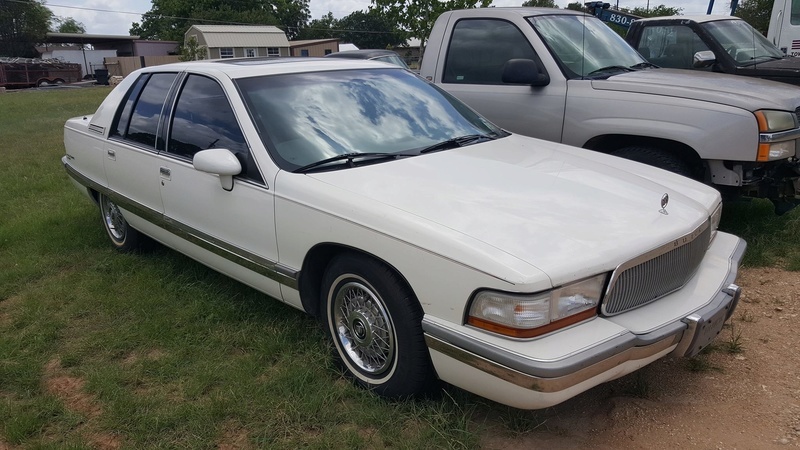 7/31/2017 - So I picked up the 1992 Roadmaster Limited Sedan yesterday. 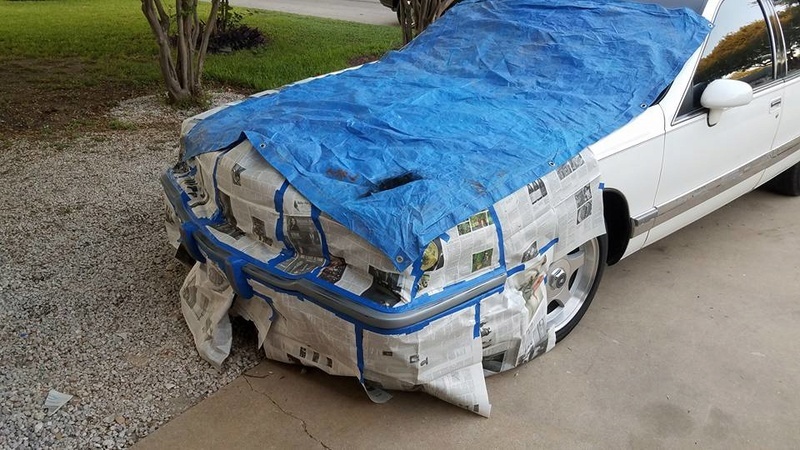 I'm going to refurbish this car, and frankly...I'm debating on how to start this project. First, I DO like this car. The GOOD parts are very good. It's VERY solid, totally original and untouched. 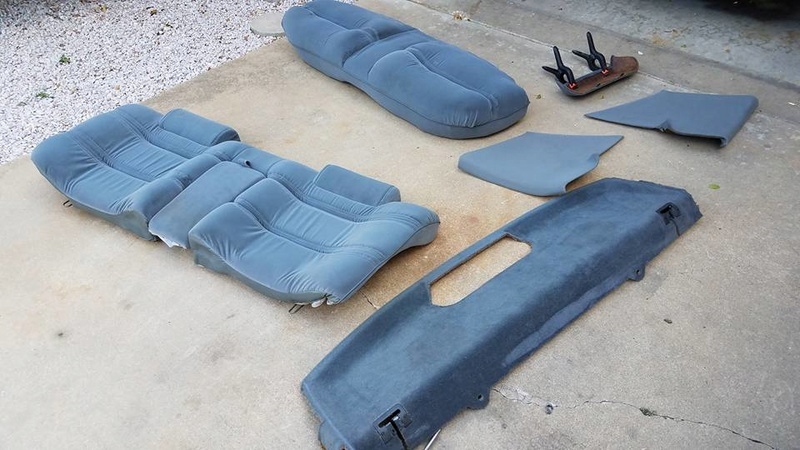 A Dallas car since new, always garaged, zero salt ever, no vinyl top, grey cloth Limited interior, and a dealer-installed ASC power sunroof. 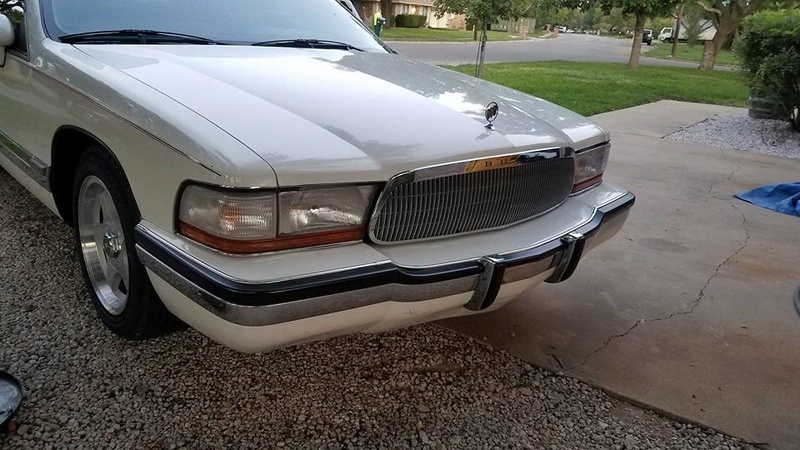 The paint needs to be waxed, but should come back to life, and it has sharp painted grey and maroon pinstripes, the original Royal Seal tire is still in the trunk, the C-pillar opera lights work, the trunk pull-down works, the keyless-entry works, and the interior is nearly perfect, other than needing some cleaning and a headliner. 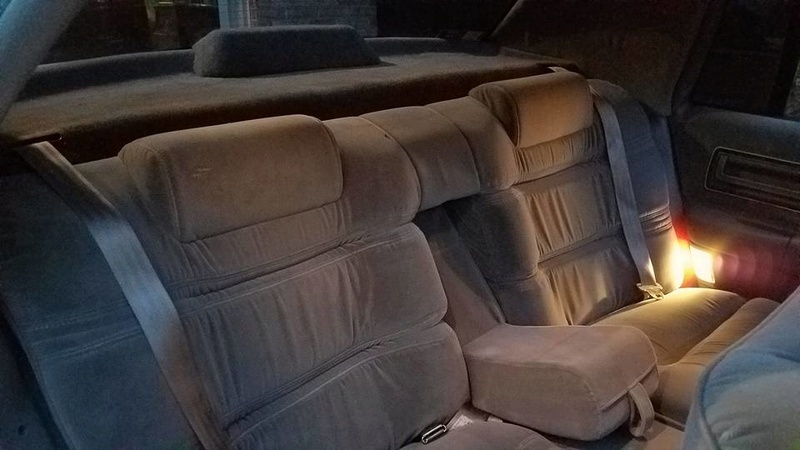 The dash and door panels are beautiful, the seats are nice, the carpet is not stained, and its not been smoked in. 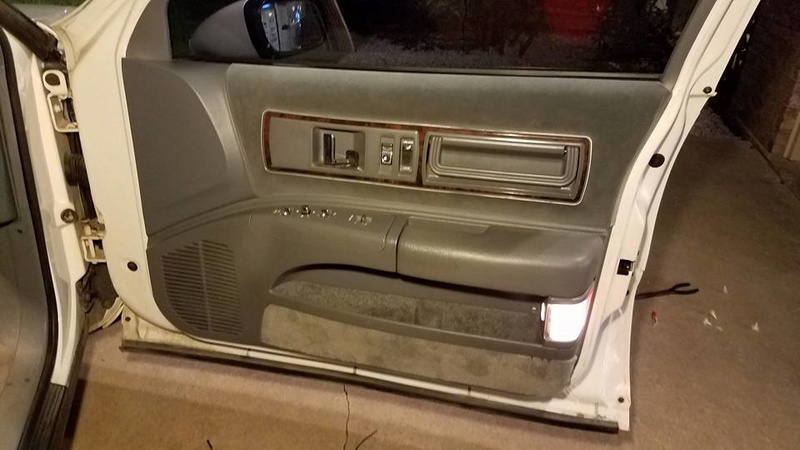 Door panels are still tight when you close the doors. No rattles at all. SO again quick recap on the history. 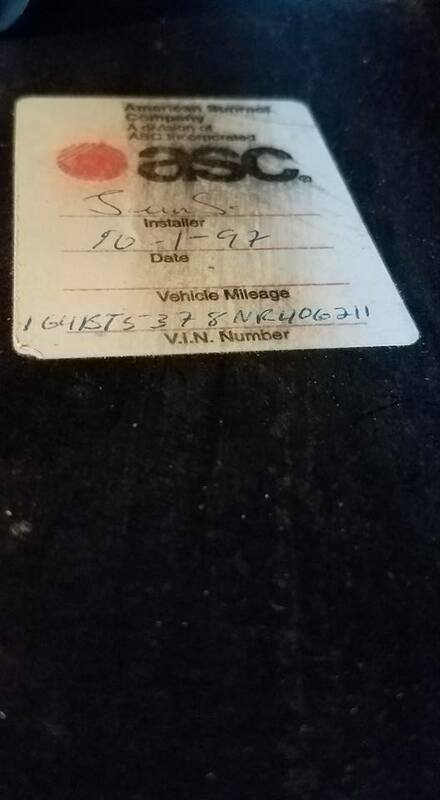 2-owner car, previous owner had the car for years, and passed away. The car hit 81K miles on the trip home yesterday. I think it sat totally unused in the owner's garage that last 3-4 years (it was last registered and inspected in 2012). 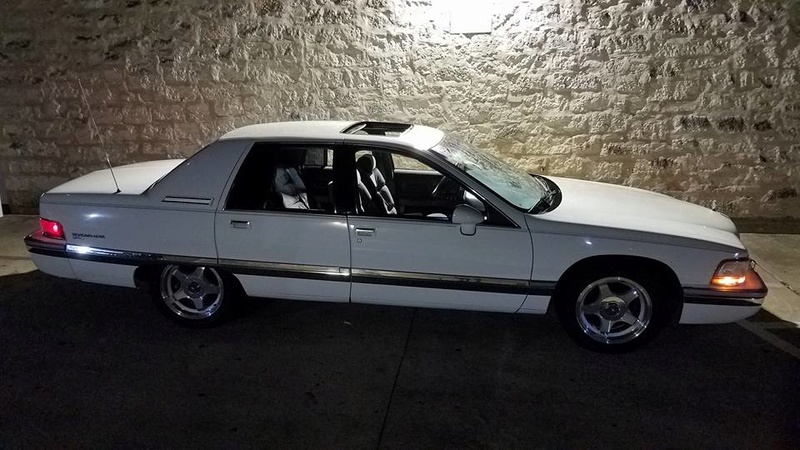 My friend Richard got the car about a month ago, put a battery in it, changed the oil and fuel pump, and possibly a tune-up (need to ask about what all was done). 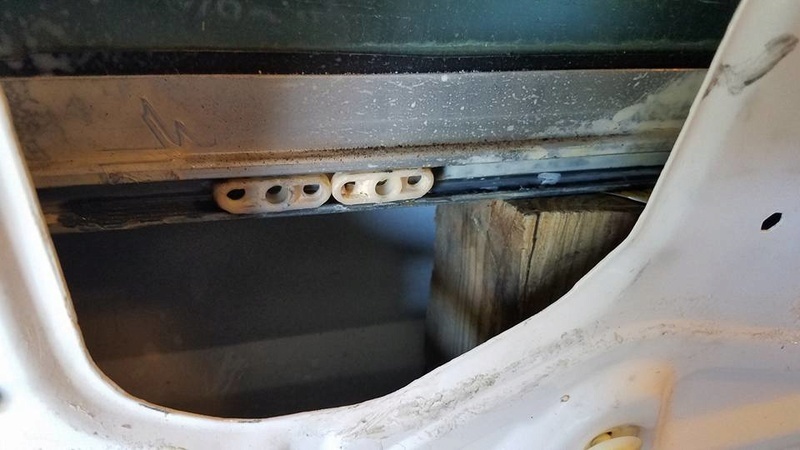 He put a couple cans of 134A in it and the a/c came on, but the compressor is rattling and leaking. 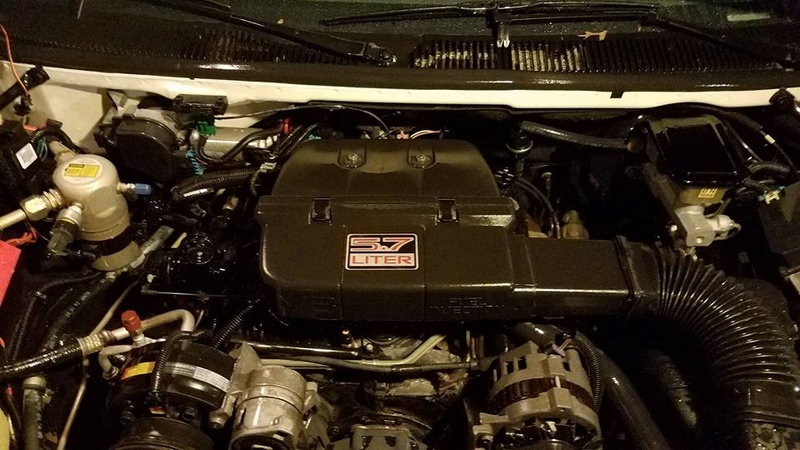 The LO5 350 motor is quiet and smooth, and transmission shifts fine, and the car itself is still "tight" like it should be at only 80K miles. 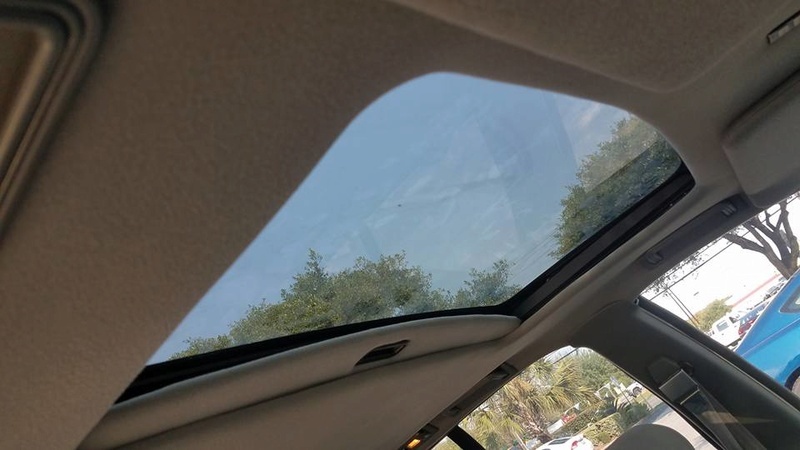 First, I sit down in the car, and notice the headliner is falling, especially on the sunroof shade, so I reach up to slide the sunroof shade back so the headliner will not be touching my head, and the headliner on the shade rips and falls off onto me as soon as I slide it, and covers me, the front seats , the cupholders, and front carpet, in black, dried out/powdered headliner foam dust/chunks. Wonderful. I get out, beat the dust out of my hair, pick it out of my ears, off my clothes, pull off the remaining headliner material, which is hanging by one thread front the shade, and throw the headliner out on the ground beside the car, and then grab a towel and knock as much black foam dust off the nice-looking cloth seats and carpet as possible. Yuck. Next I get back into the car, and start it. 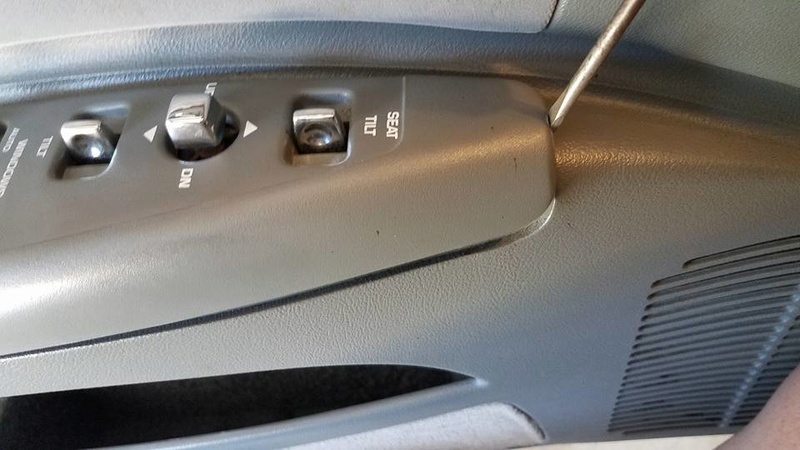 It starts right up and sounds really good, but when I hit the AUTO button on the climate control, the compressor comes on...grrrrrrrrr...rattling loudly. Blowing cold though, but not long for this world. 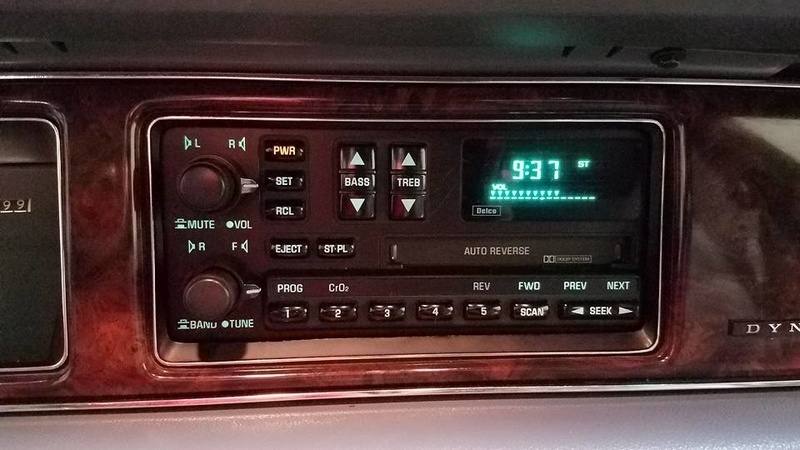 I turn on the stock, base-level cassette radio (and later find a Frank Sinatra cassette in the car, which FITS this car well), and the rear-mounted antenna goes right up, but there is no sound. 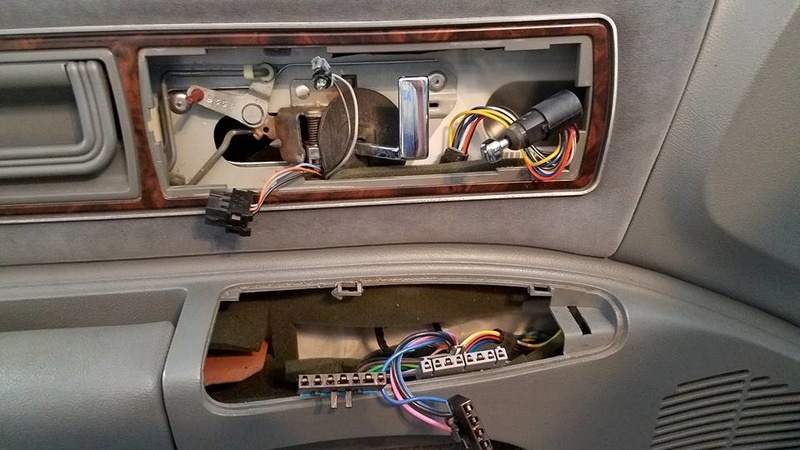 I turn up the volume, and learn that only one speaker works, in the driver's door, and it's almost totally blown, all tinny and high, and you have to turn the stereo up almost all the way just to hear it. Holy Cow. Horrible. I turn it off and listen to YouTube on my phone for the rest of the drive home. I then look around at the pretty Limited-level cloth seats, which have controls on the doors and the sides of the seats too. 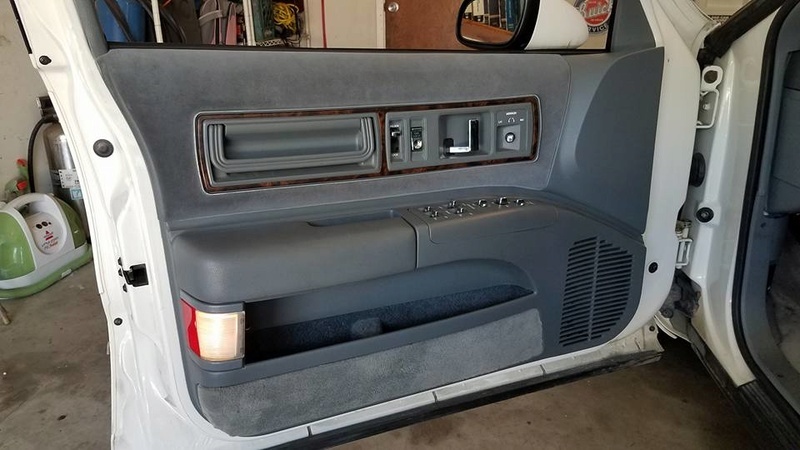 I press the various buttons and the seats move up and down, recliner works, air bladders hum, but when I go to move the driver's seat back it moves about an inch, and that's it. 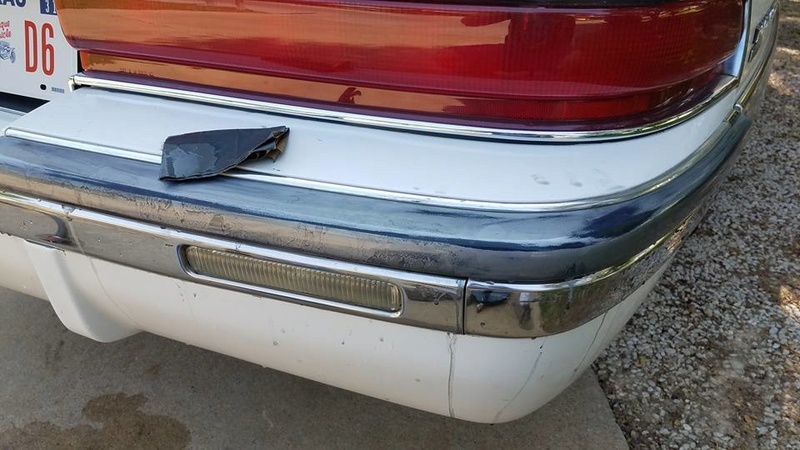 It's sticking on the forward and back. 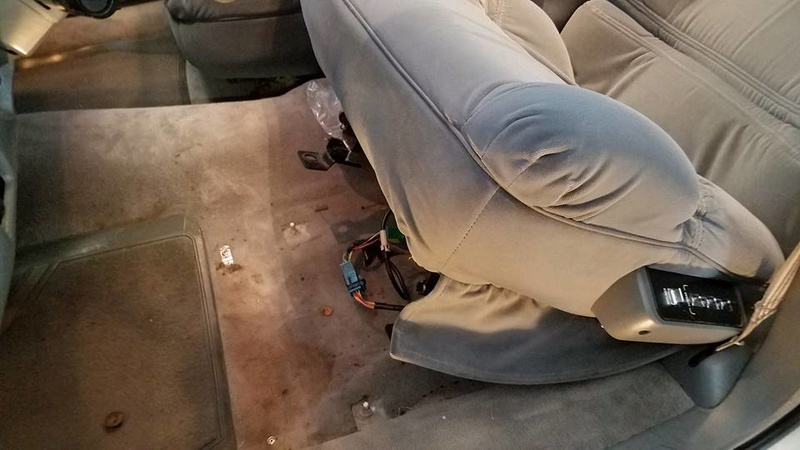 The passenger side seat all works. 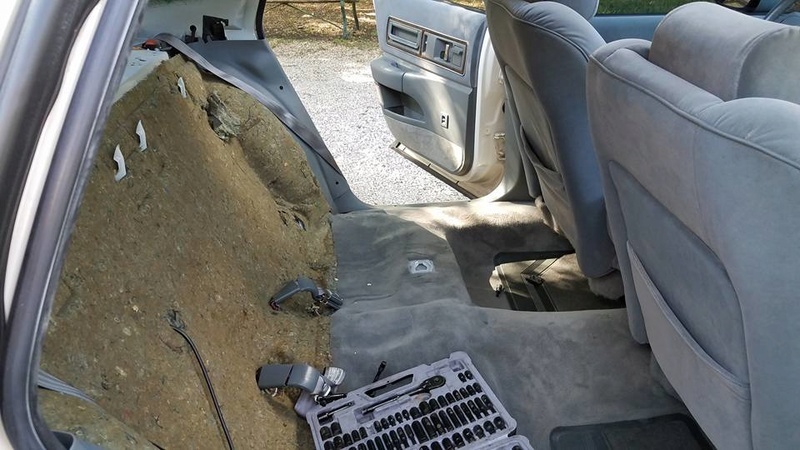 So in the span of five minutes, I know the car needs an a/c compressor, has issues with the driver's seat, three power windows are goofy, the speakers are bad and the headliner is shot. Not a really great start. 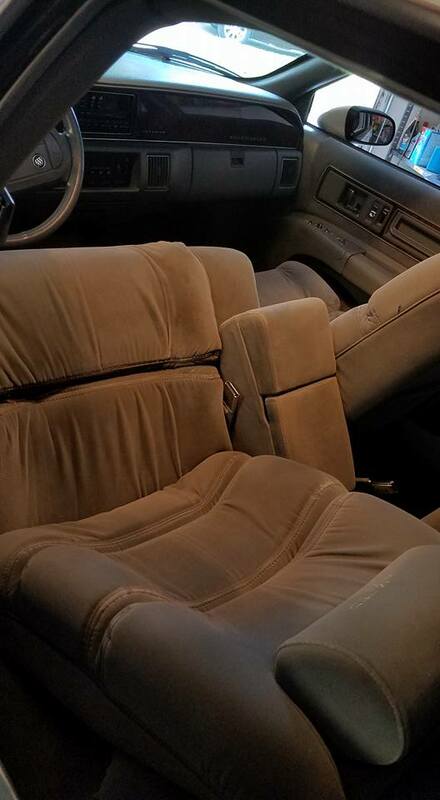 I sit down in the driver's seat, which is INCREDIBLY comfortable, and look around. Again other than the headliner, the interior is beautiful. I close the door and marvel at how tight it is, no panel rattles. 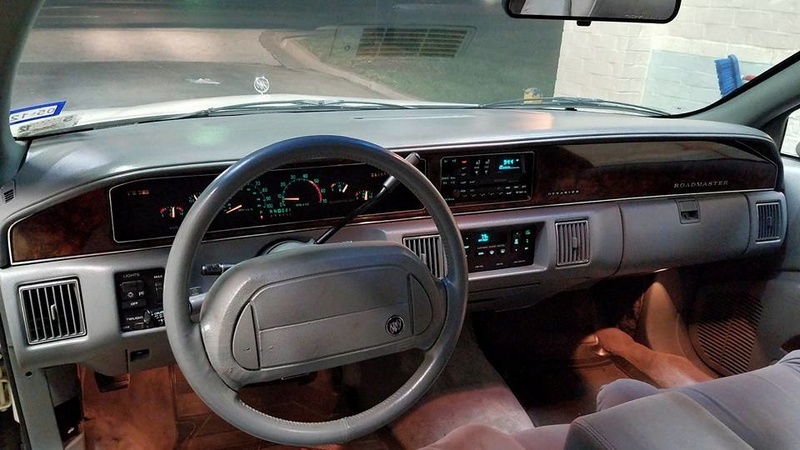 The shifter has no play, the grey leather on the steering wheel is nearly perfect, and all the dash gauges all work. 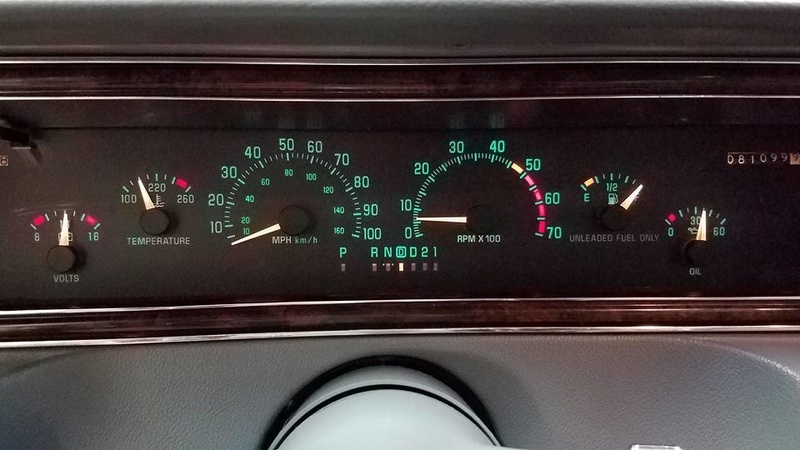 The chrome on the dash still shines, wood is pretty too....again, it's a low-mile, garaged car, and I'm shocked over what doesn't work in comparison to how NICE it all looks and feels in there. I drop the car in DRIVE and pull out. It feels very smooth, but also heavy and VERY soft. 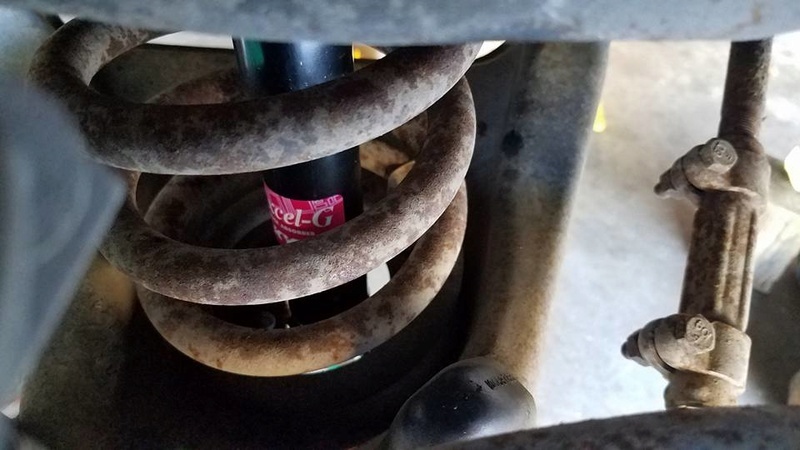 As I pull out through the parking lot, which is bumpy and potholed, the car bounds around a lot more than my Roady wagon does, the shocks, I'm sure, are original, and need to be done. The next issue is power...this car....is not fast. I'm comparing in to my LT1-powered, tow-pack-equipped Roady wagon, and this TBI 350 is..not quick. 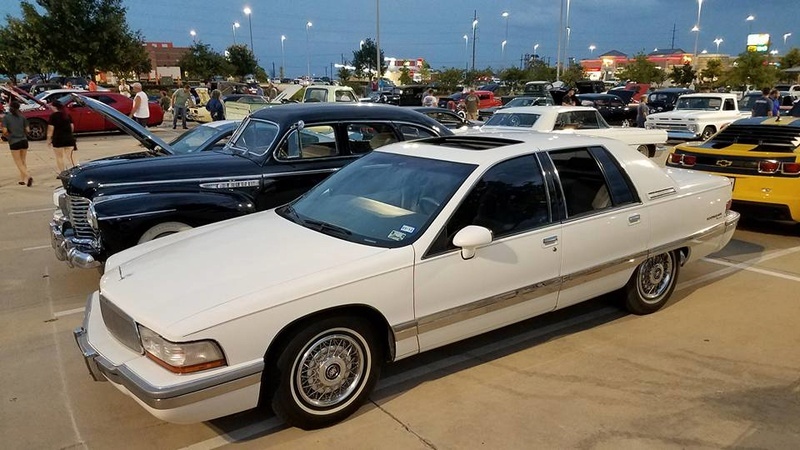 I had that 92 Olds Custom Cruiser with this same TBI 350 motor, and it was much faster, but it was a tow-pack car too, so I'm sure this sedan just has very tall highway gears in the rear. 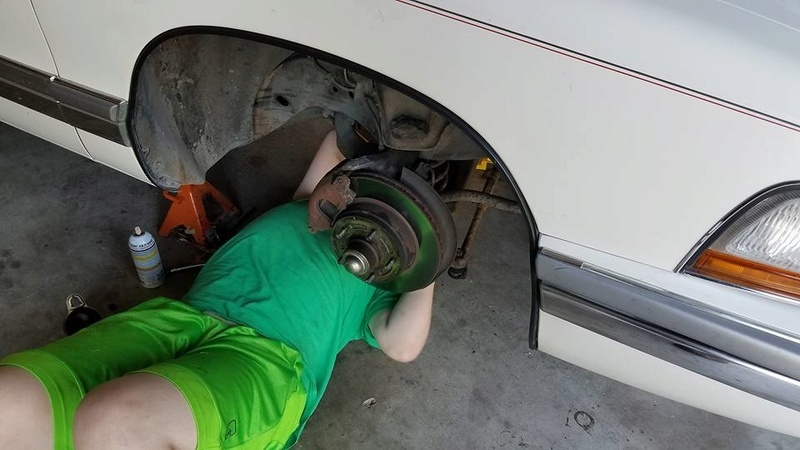 The gearing HAS to be the issue, because the car seems to run fine. The brakes are firm and don't stutter, and there are not idiots lights on. It's just heavy, and slow. 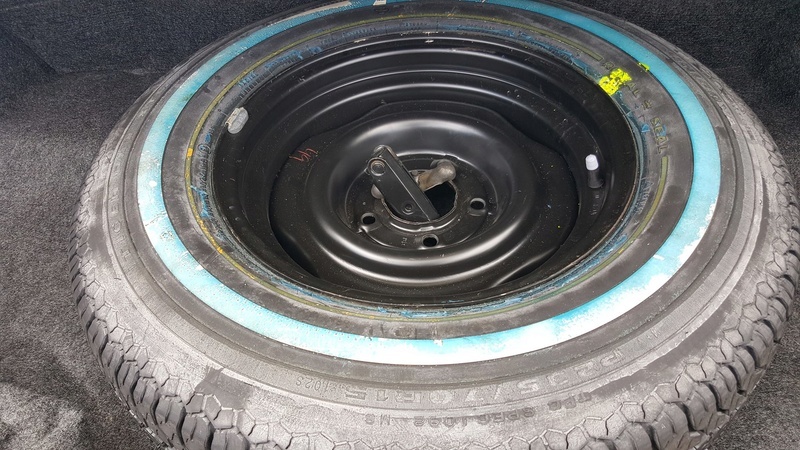 I accelerate onto the highway, and soon I find the biggest issue, the tires...they're square..I mean totally out-of-round. 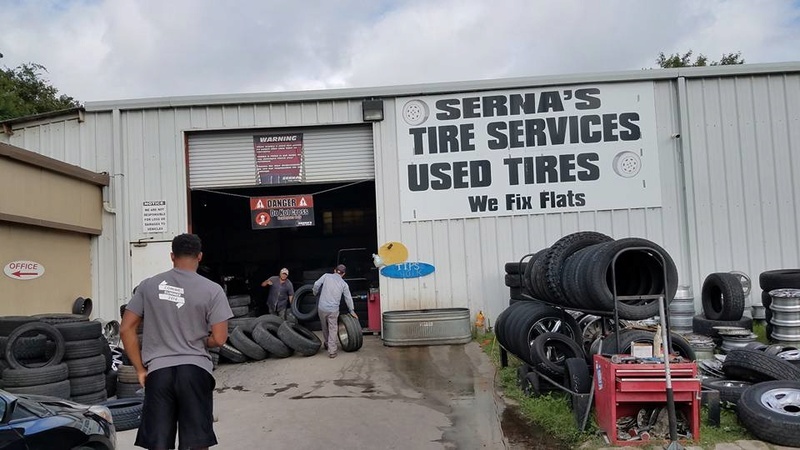 I'd looked at the tires before leaving, knowing they were older and nearly flat when the car was pulled out of storage. 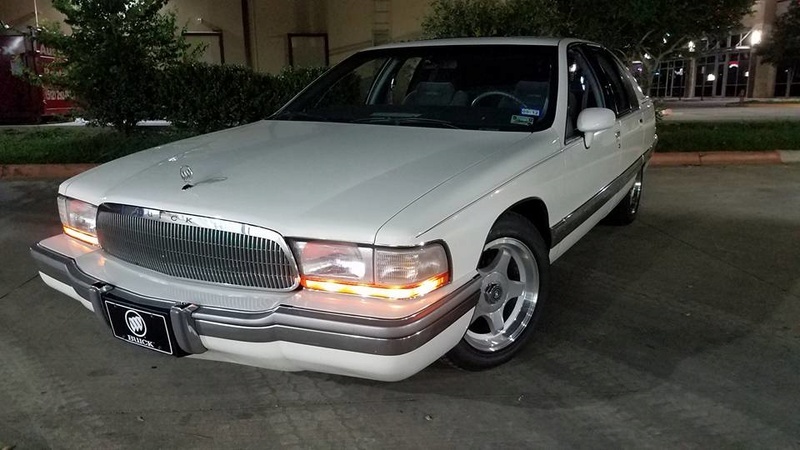 They're Goodyear Viva white-walls, no horrible dry-rot to be seen, and with TONS of tread, but at about 45mph, this car, and especially the steering wheel, begins to shake. It gets steadily worse at 50-65, and then begins to smooth out at around 70. I do stop and look to see if there is a bubble in the tires or something, or if a wheel is loose, but no, nothing seems wrong, until you ACTUALLY drive the car at speed. The drive back to Austin is through the Texas Hill Country, and it's down Hwy 1431, which is all hills, fast and sharp turns, switchbacks, and long sweepers. It's a great road, with fantastic views, and AWESOMELY fun in a quick car or on a motorcycle (it's even fun in my LT1 Roady wagon to blast around, but again the Roady has KYB's at all four corners and the thumping LT1 undef the hood). In this Sedan, Hey 1431 was NO FUN at all, sadly. The road speeds are at 45-65, exactly where the car is shaking the worst, and between the shaking, the worn-out shocks, massive body lean in turns, and the distinct lack of power to climb up the hills, I was exhausted, stressed, and seasick by the time I got back close to Austin. 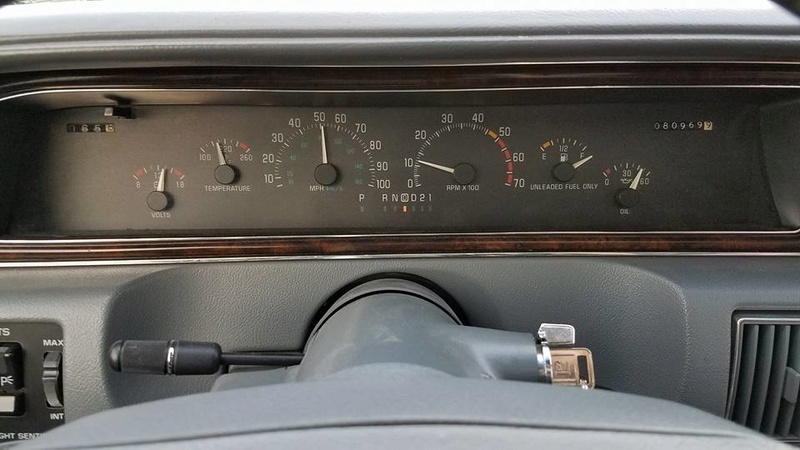 Beyond that, after about 30-mins of driving in the hills, and the heat (it was around 100-degrees outside), I noticed the temp gauge moved beyond the halfway point and leaned over toward the red, but never quite got there, adding to my stress of a possible issue. 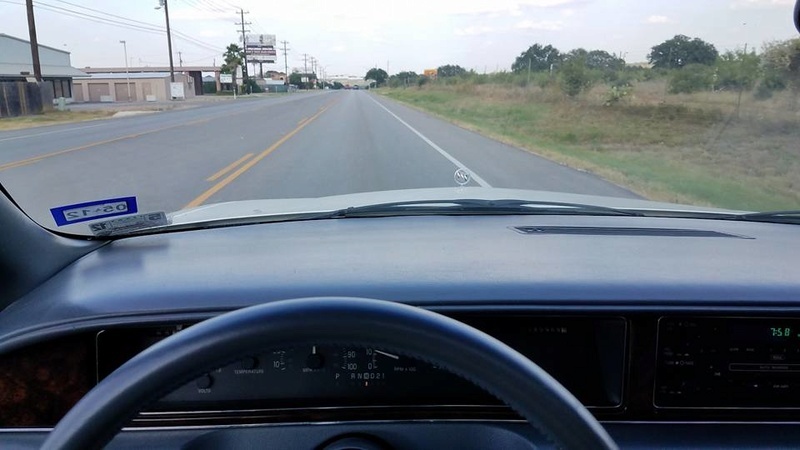 In Austin I left the hill country behind, so the road leveled-out and I was able to set the Cruise Control and drive at around 70mph, which smoothed things out somewhat, and the temp gauge slowly swung back over to below-halfway at that steady-speed. But even at 70, the car feels underpowered, and I still think the gearing is just way too high. 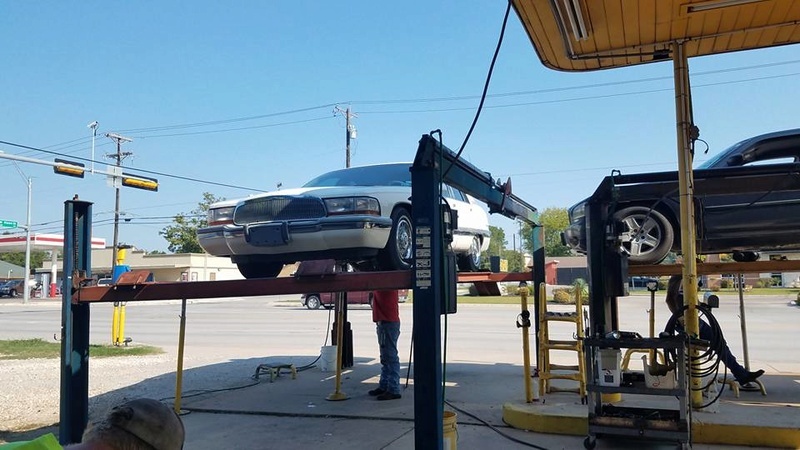 This car BADLY needs a rear-axle swap from a tow-pack car. 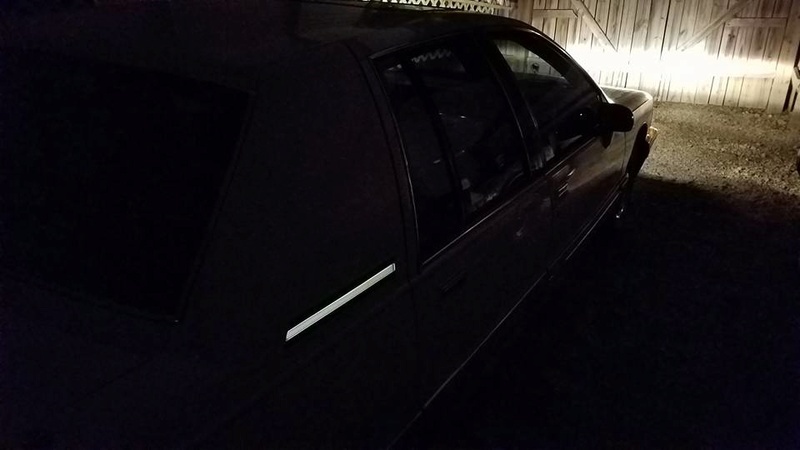 On getting home, I parked in my side-yard and really looked the car over. 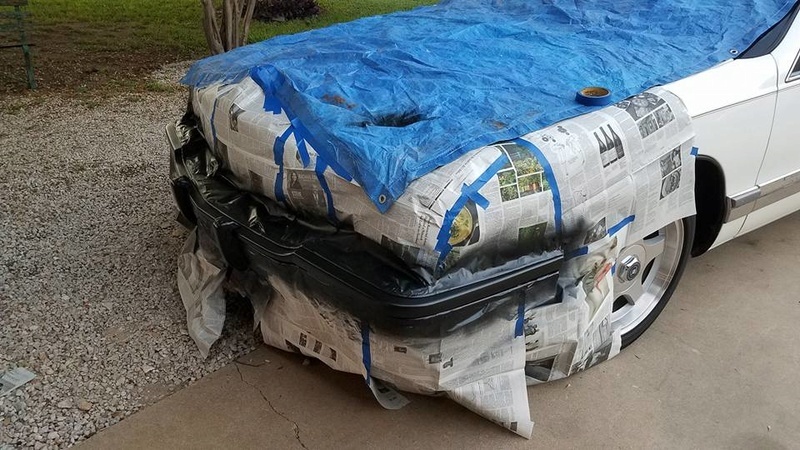 It needs to be detailed under the hood, but is totally corrosion-free. 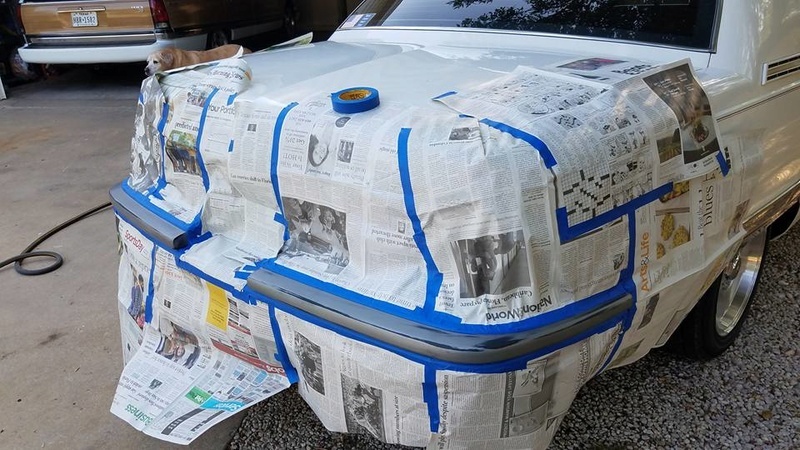 The exterior paint will shine up, but I need to locate new rub-strips for the side trim, typical, they are all missing. 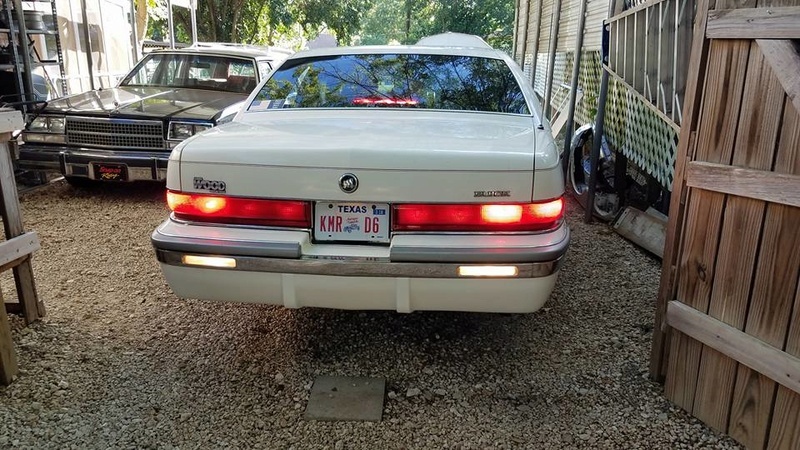 The trunk pull-down still works, and again even the opera lights work. 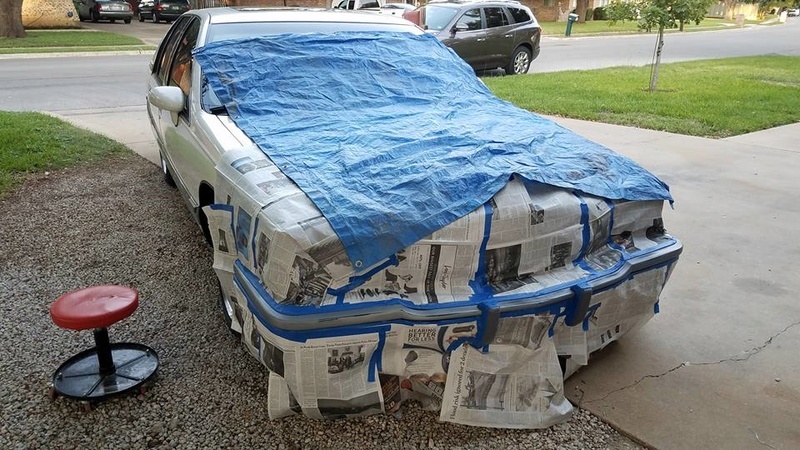 It should clean up really well, and it really will be pretty....and should be a great car, if I can peel the "lemon rind" of issues off this clean and low-mile vehicle. 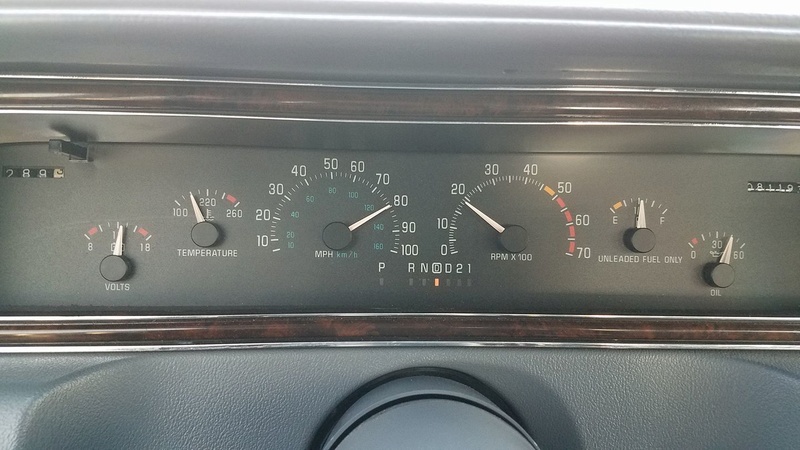 I can't believe it has so many goofy issues, considering the actual condition and miles on this car! 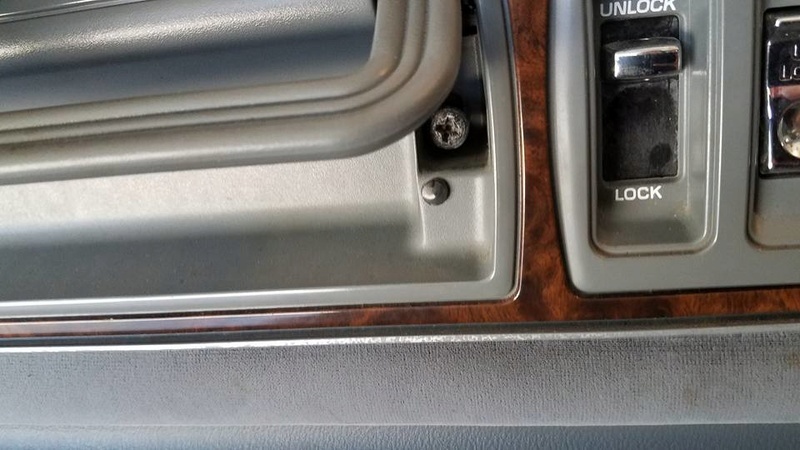 I have to remind myself that it IS a 25-year-old vehicle... I know I need to lighten-up! 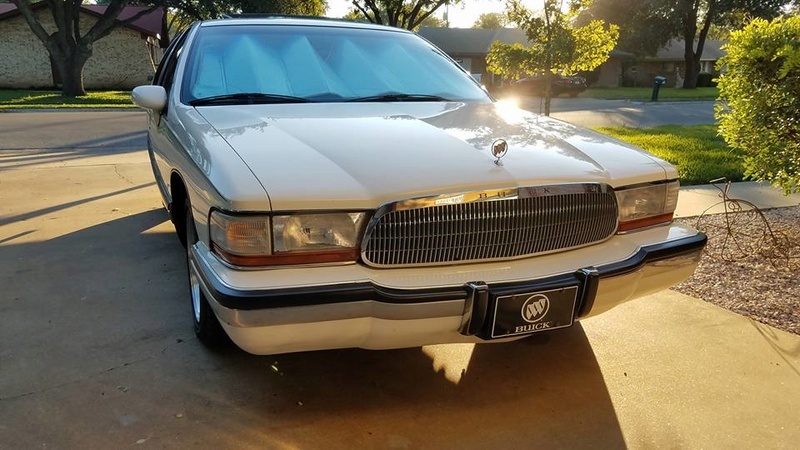 The purists will cry, but the first mod, after giving the car a REALLY GOOD cleaning and detailing, will be to install Impala SS 17-inch wheels with my custom Roadmaster Buick tri-shield center caps. 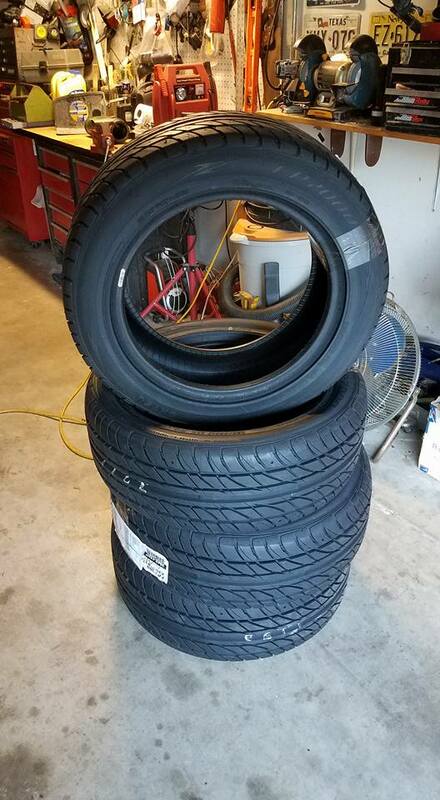 The wheels are already in the garage, I just have to find good tires for them. 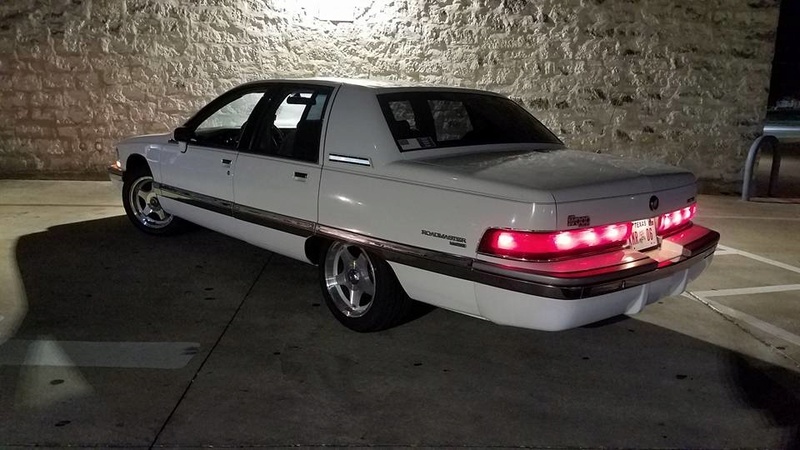 I think the white car, with the tinted windows it already has, and no vinyl top, will look great with the Impala wheels mounted on it. Will of course save the original steel wheels and wire-hubcaps for a future owner (I hate rattly and hard-tp-clean wire wheel hubcaps...). 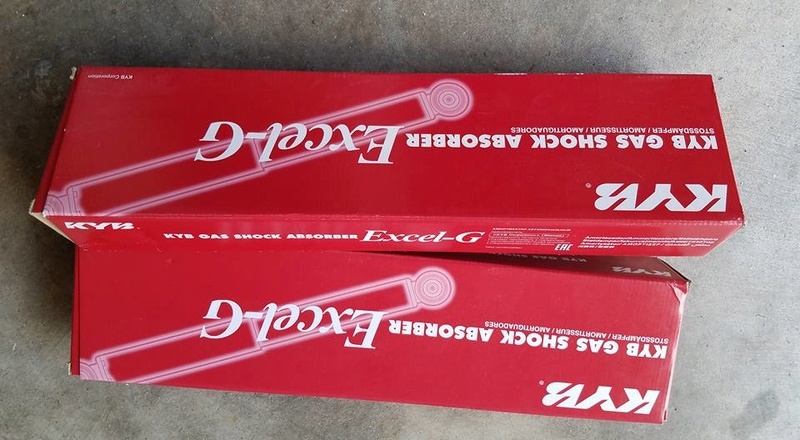 Will plan to install some new shocks while it's in the air, and will look at brakes and check the front bearings and steering for issues while the wheels are off, and lube everything well. New tires and shocks should totally transform how this car drives (I hope!). 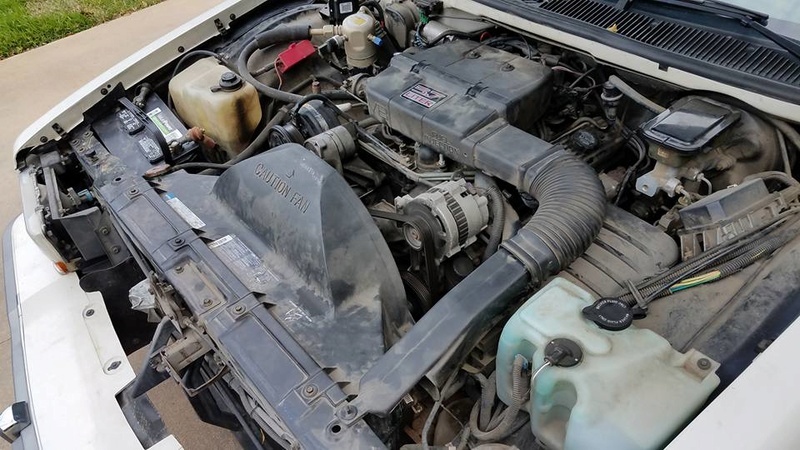 Next-up, I plan to get the a/c fixed, and will possibly flush the cooling system and replace the thermostat...that running hot issue is a little worrisome. 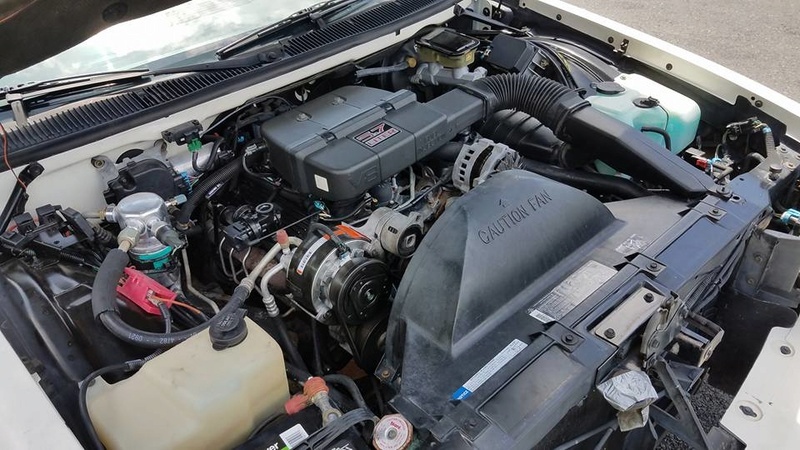 Will check the fan clutch too, and clean and detail underhood. Will post updates as I sort it out and put this car back together. 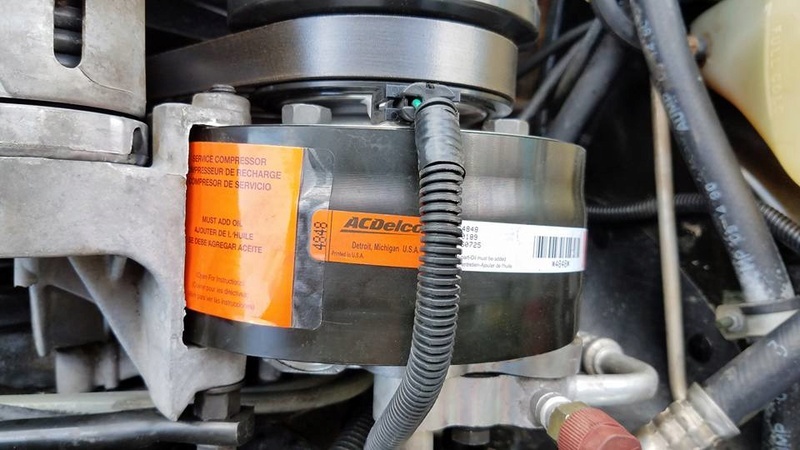 Is the AC compressor rattling or is it hammering?? You had said that someone had added a couple of cans of 134. If the older systems are over charged, the compressor will hammer (sounds like an engine knock). 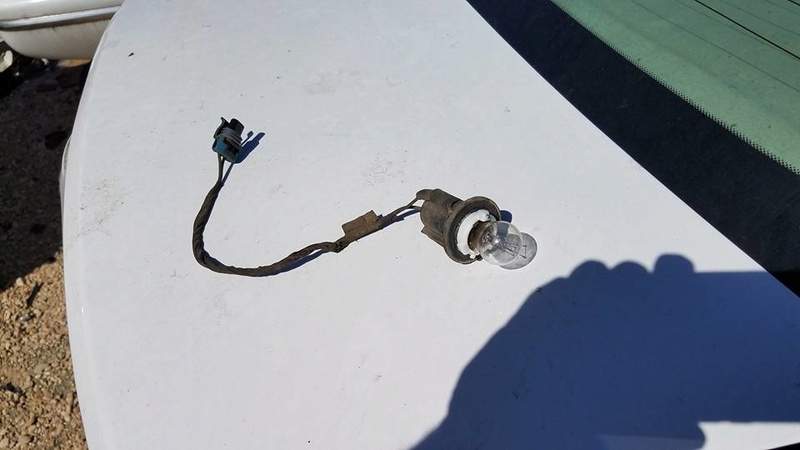 Try venting off a bit of the Freon first to see if it improves. Might be all it needs. 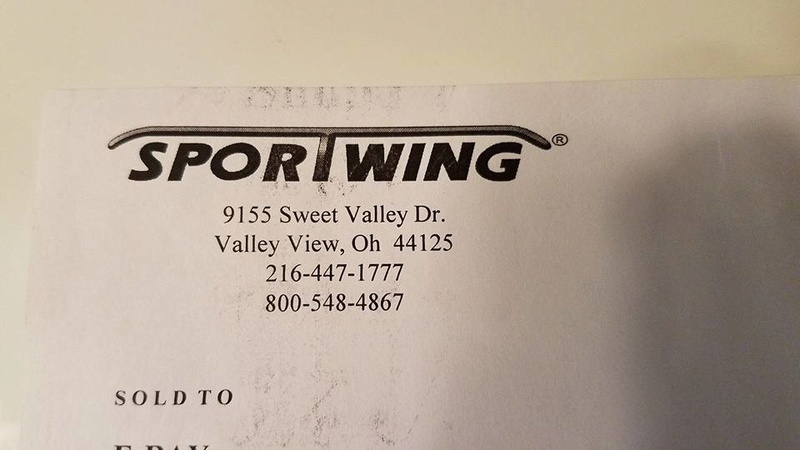 Thanks but it's slinging from the front seal. Was low and cycling when I got it home last night. Compressor time. Projects! This has the makings of a great soap opera. Will the fat lady sing? About to dive into this project. 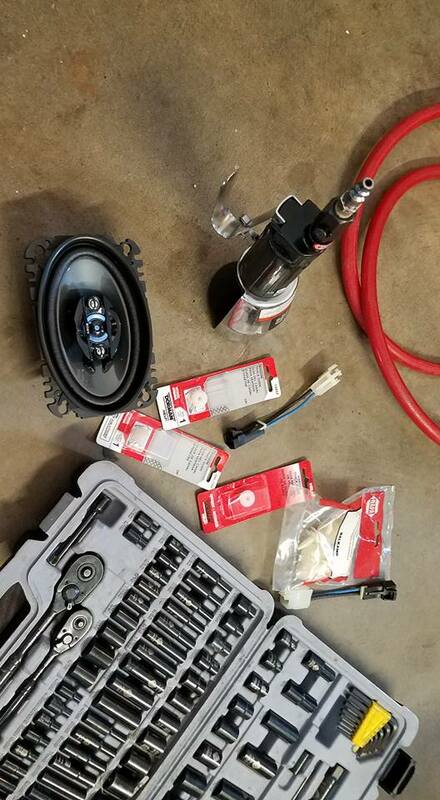 Been making a LONG list of parts to order and things to do. It will be NICE and totally sorted out when it leaves my driveway. 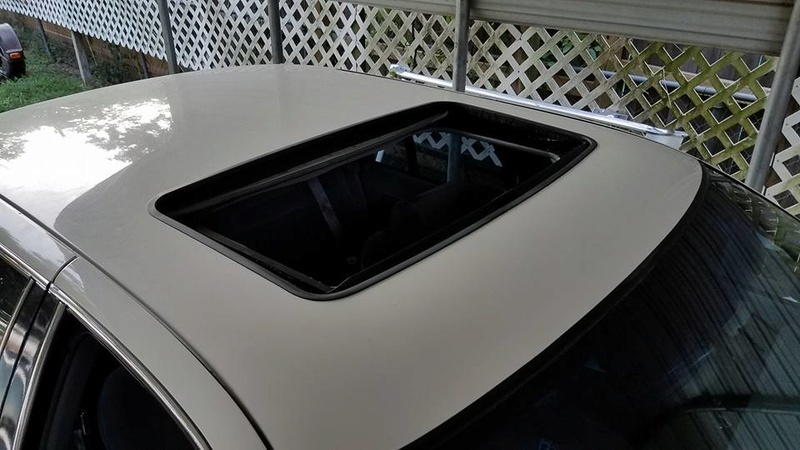 On as happy note, the dealer-installed ASC power moonroof works, and perfectly, even the auto-open feature. 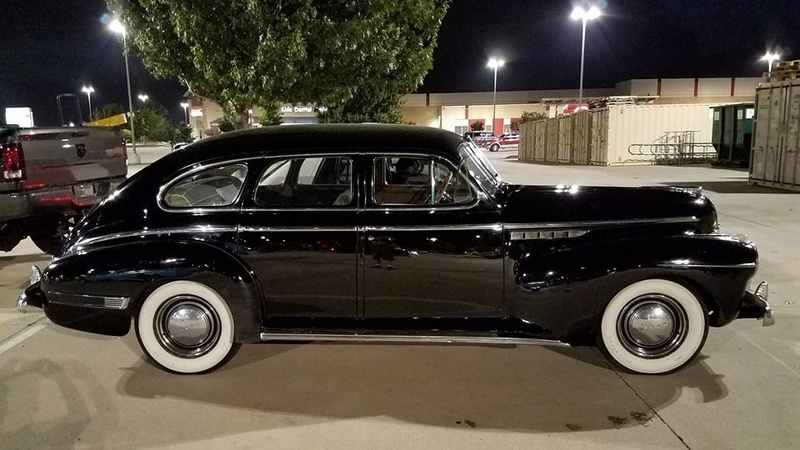 It's big, I've never seen one in a Roadmaster (but have seen them in Impala SS's), and I totally love it. Nothing on this car scares me too much...except the power windows. 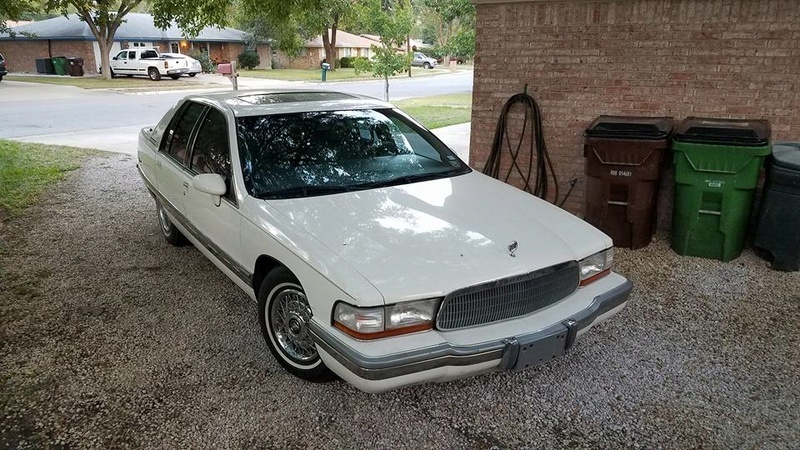 I've done rollers/sliders before, and DID replace the front motor on my 92 Custom Cruiser wagon, but both driver's side windows on this sedan are totally up, and do not move. 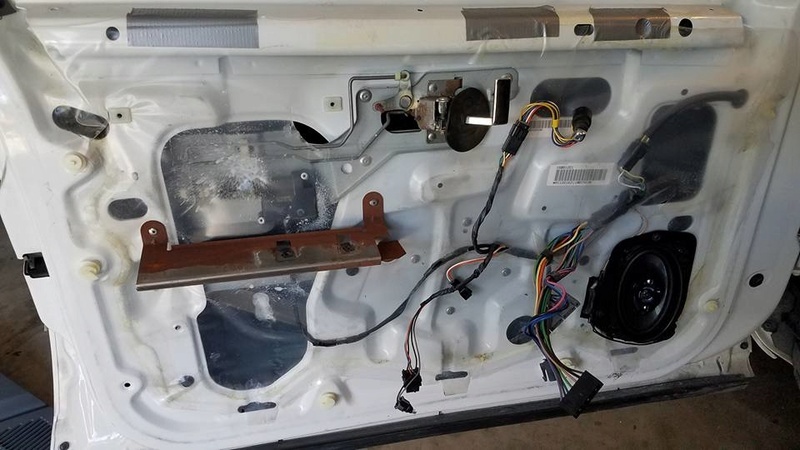 I'm hoping when I remove the door panels and tap on the motors, that maybe they wake up again.... 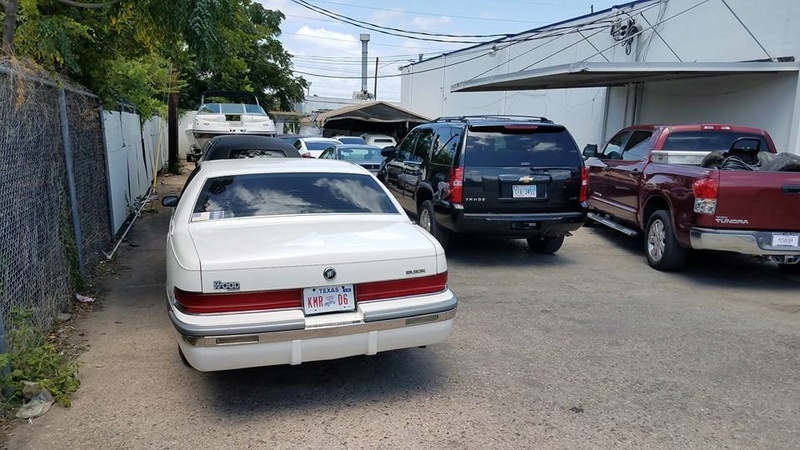 This was a lady-owned, garaged Texas car, but she stopped driving in 2012, so I think a lot of the car is just...frozen, from sitting. Even if the windows need motors, it is not that big of a job. 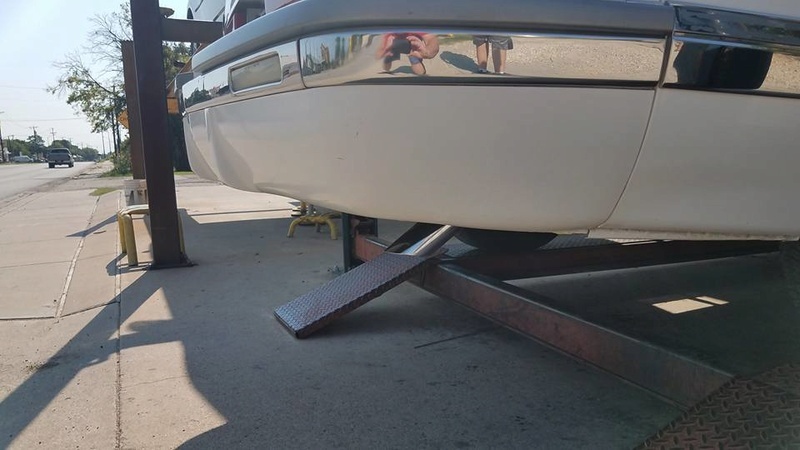 The sliders may be stick in the old grease. Motors are easy. Once you open it up you'll kick yourself for ever worrying about it. 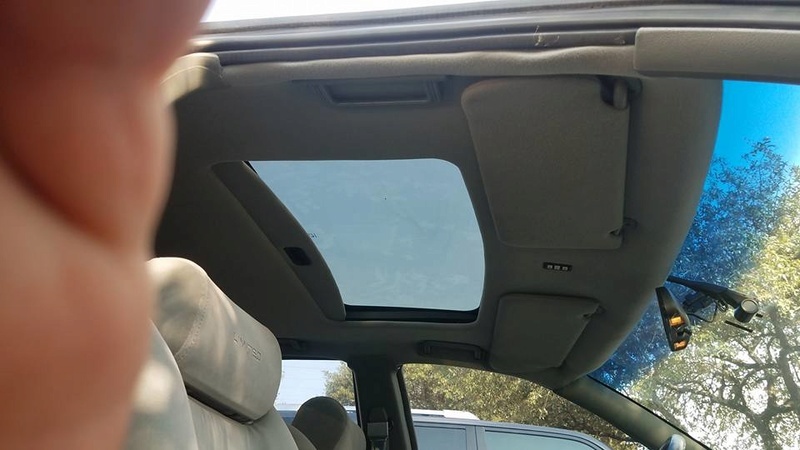 Video of the dealer-installed power moonroof. 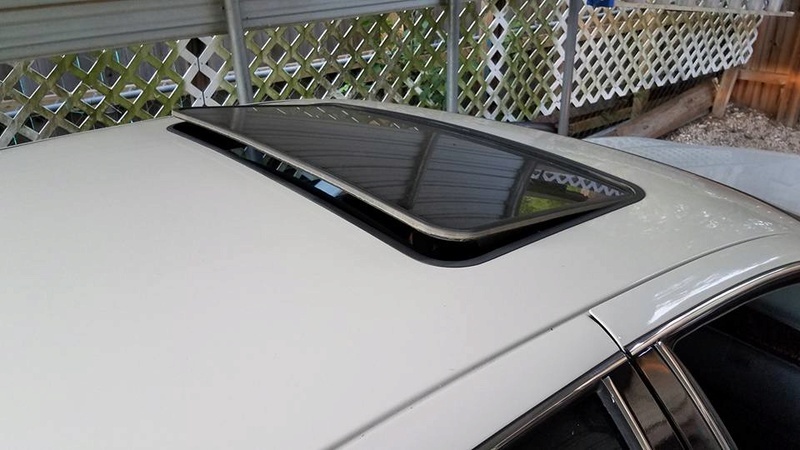 This car has a dealer-installed power sunroof. Cool Feature! 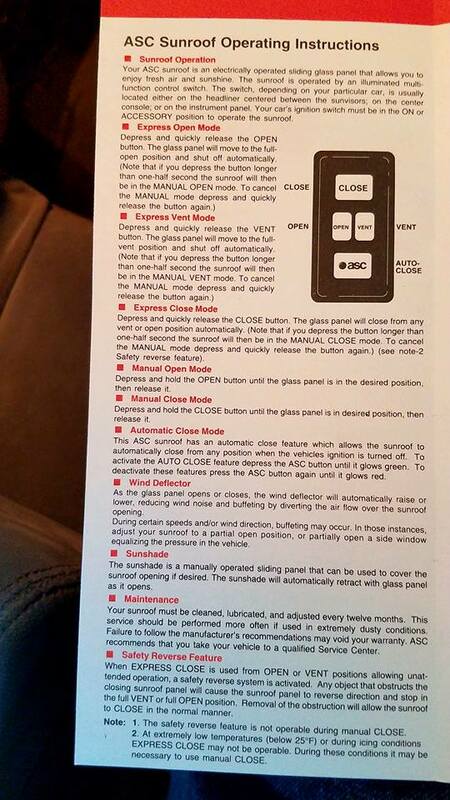 Headliner buttons for the ASC power sunroof. 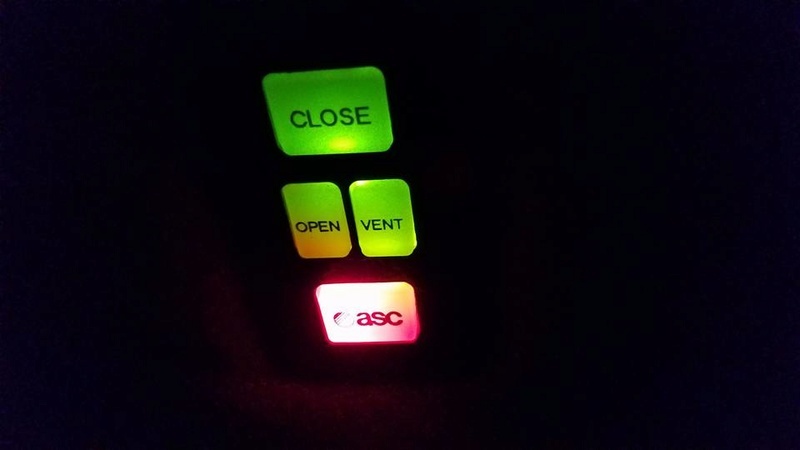 The ASC button lights up red when auto-close and auto-open are turned off. Green when feature is on. It has a sliding sunshade, and the sunroof drops down to open, or pops-up to vent. 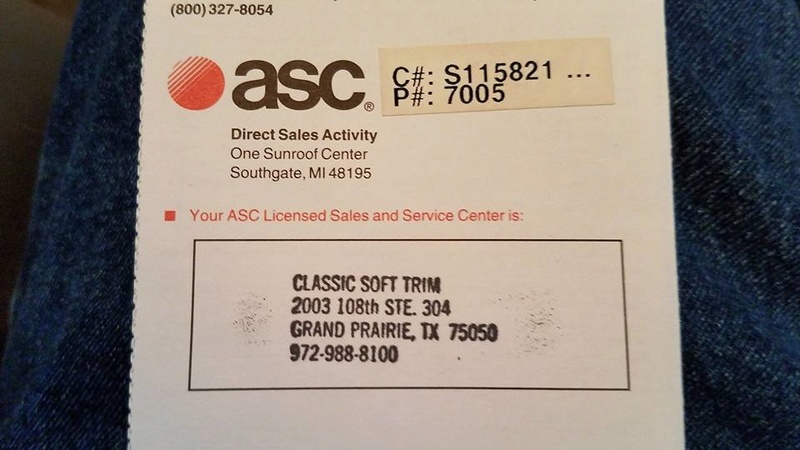 ASC sunroof tag inside glove box. Also wire-wheel hubcap tool, along with ASC paperwork tucked in the original owner's manual. 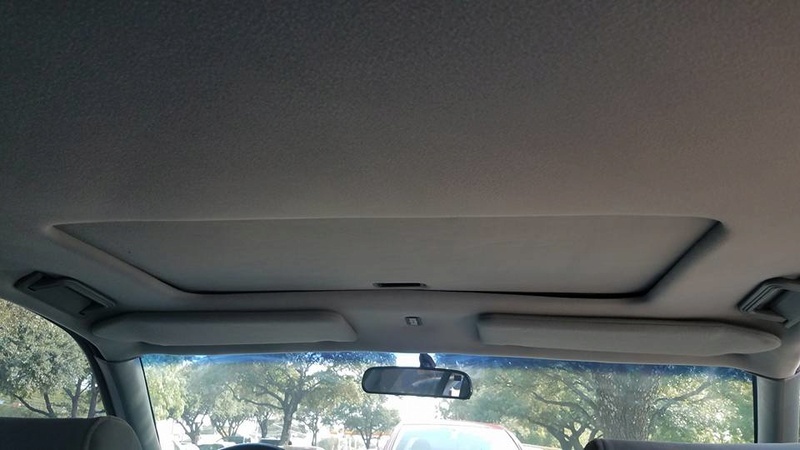 Works perfect, but the headliner material is missing from the shade, and the headliner in the car itself is falling. 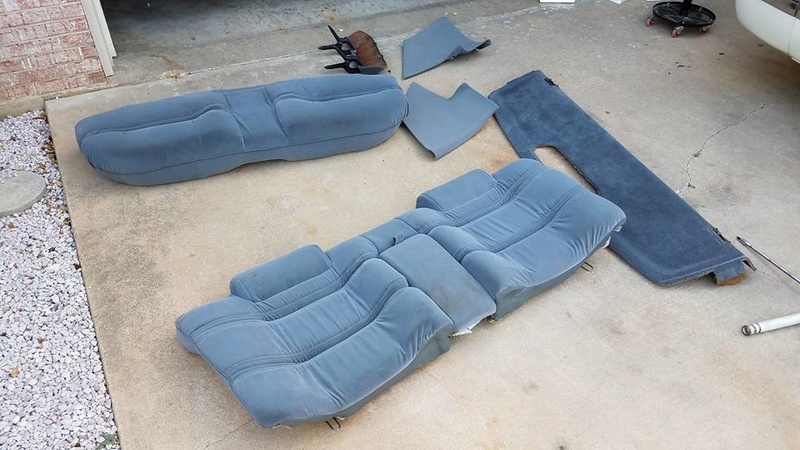 Will be sent to my interior guy in the next few weeks to have it all redone. 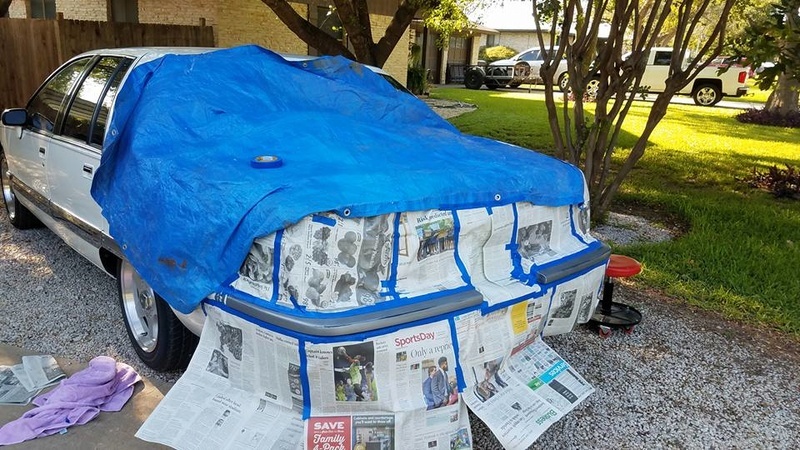 I still have to clean and buff the paint, and clean under the hood. 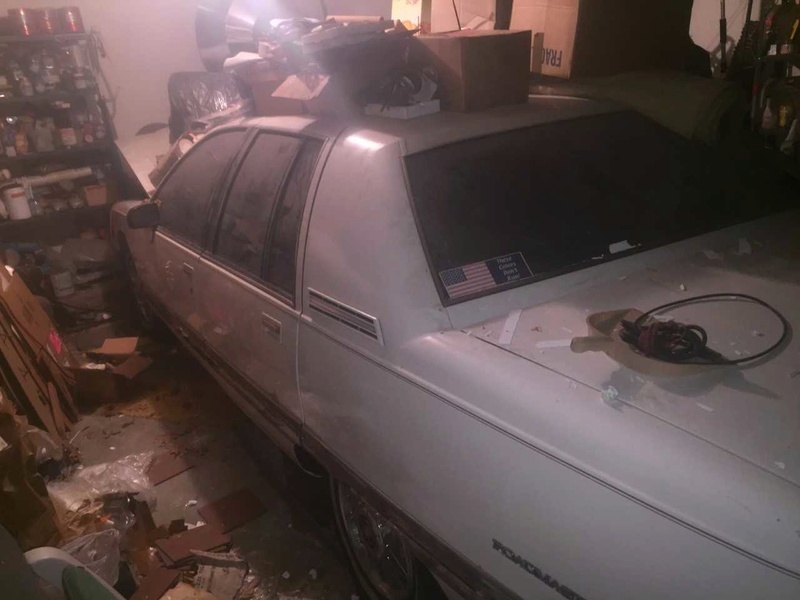 The car was used as a storage shelf in the garage for years, and has rub marks and light scratches all over it. I'm hoping I can make it beautiful again. 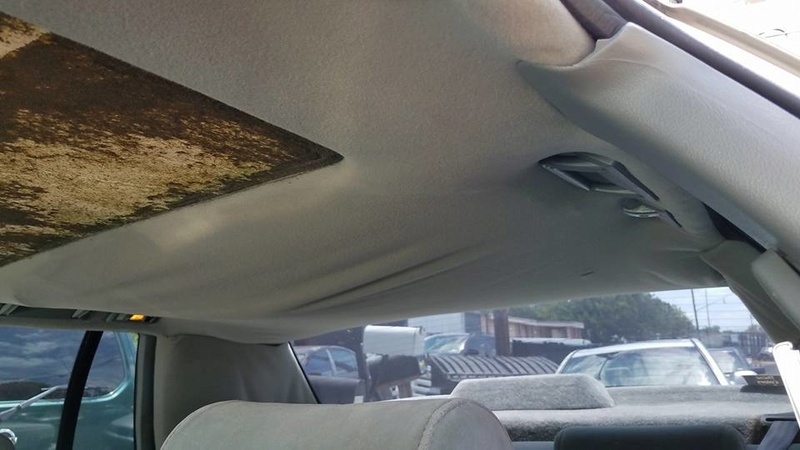 I don't think the underhood was ever cleaned. 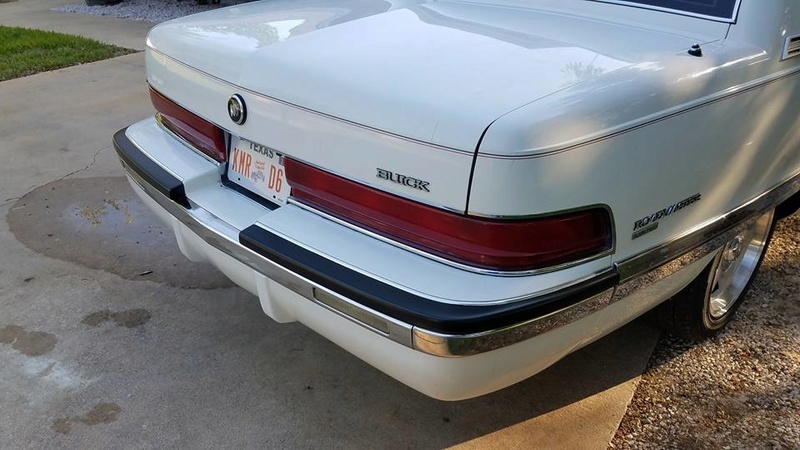 Who knows when the car was last waxed, but I did give it a good bath, and installed the new Antique plate. Amazing that something from 1992 is considered an antique now! Yikes! 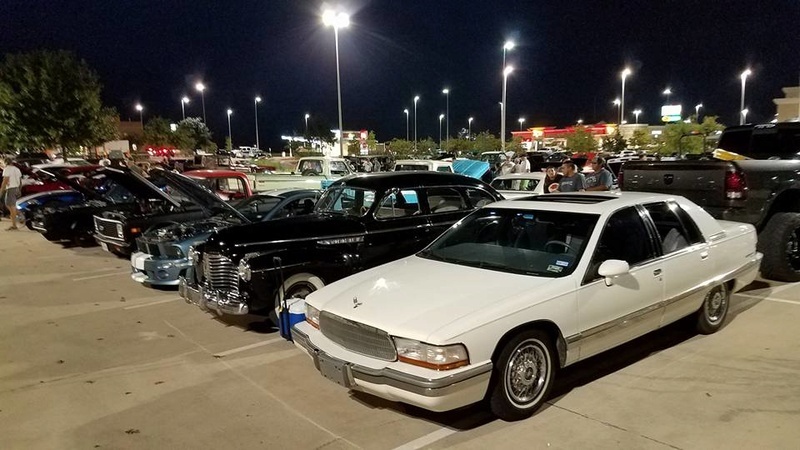 Took the Roady Sedan to the Stone Hill weekly Saturday-night cruise-in, Pflugerville Texas. Still a lot of work to do, but figured we'd take the Sedan out and show it off a bit. 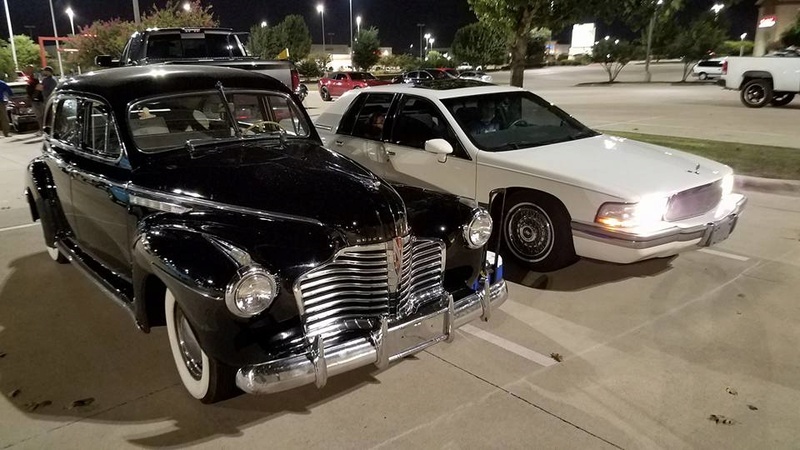 It got a lot of good comments, and looked great next to the classic black Buick Eight next to it! Sunday 8/6/17 work. 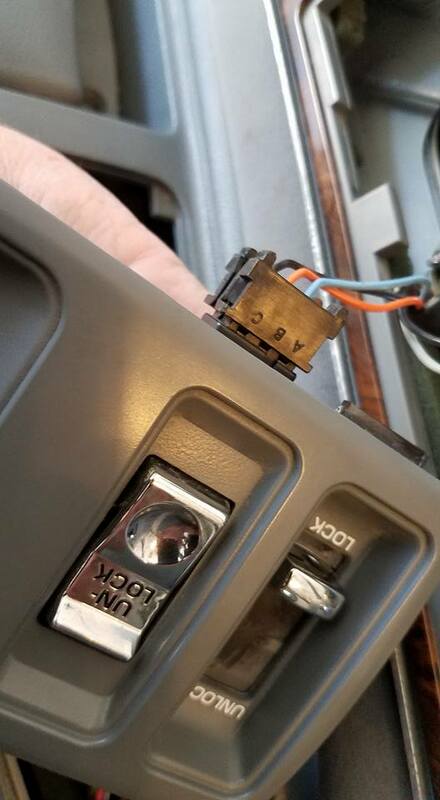 FIRST, when picked-up, only the right/front power window was working. Now I have both rears working too. Still need to fix the driver's-side front..needs a motor, on order from Rock Auto. The rest have roller/slider issues...common. 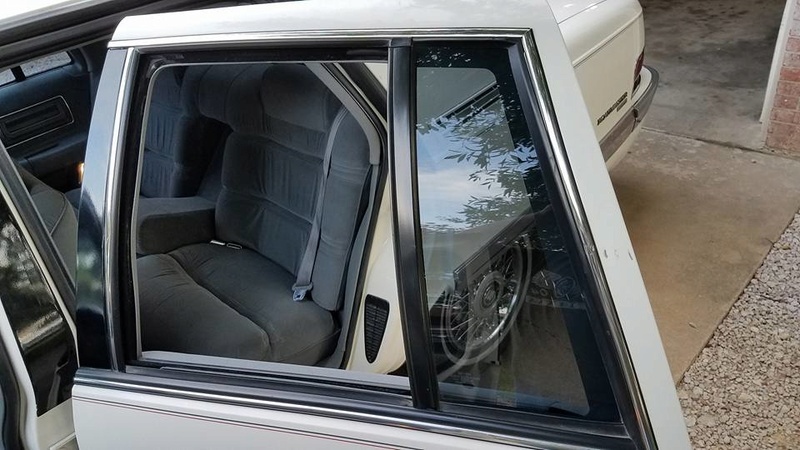 I do like how the Sedan rear door glass goes all the way down into the doors when open. The Wagon rear door glass only goes down halfway. Next, I worked on radio repairs. 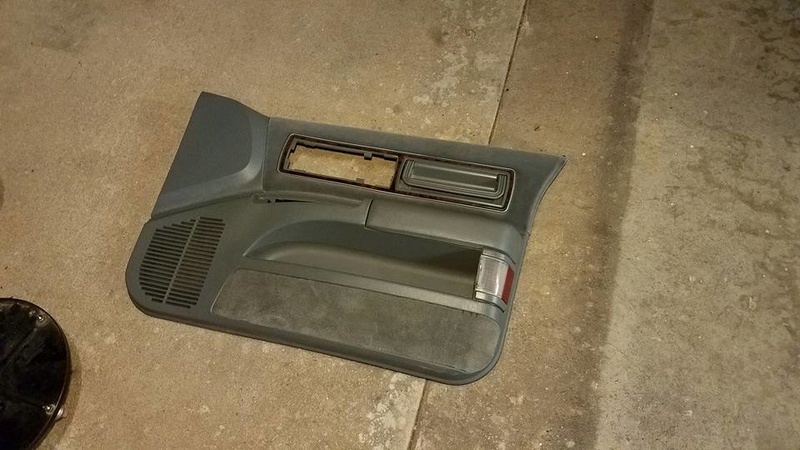 When picked up, only the speaker in the driver's front door worked, and it sounded terrible. 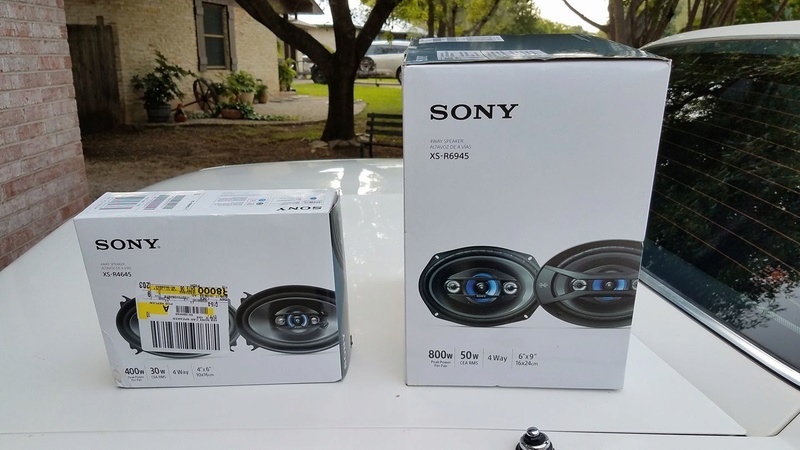 Went an bought all-new speakers to go in the stock locations. 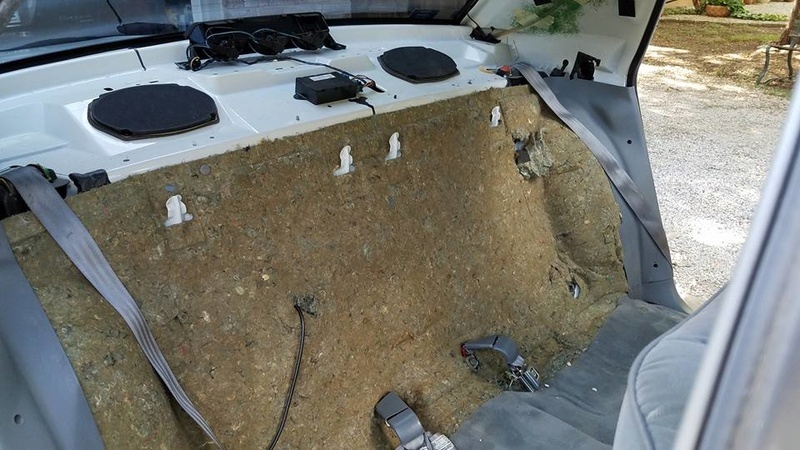 Have to completely remove the rear seat to do the deck 6x9 speakers. 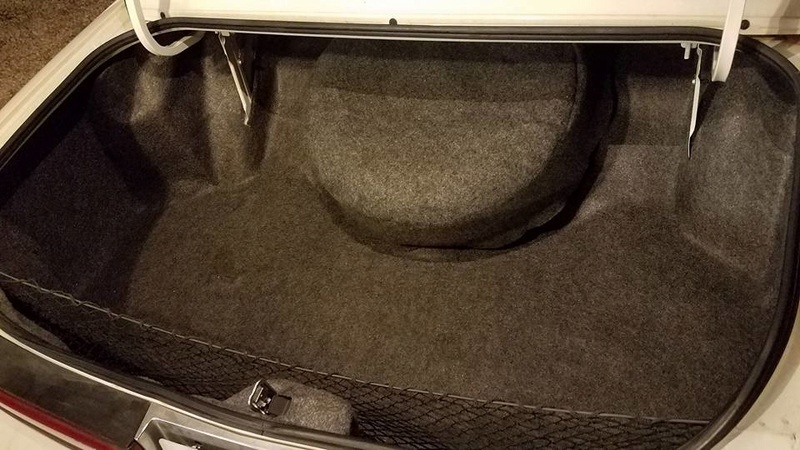 DUMB design, and worse, I learned this after emptying out the trunk, including the spare! 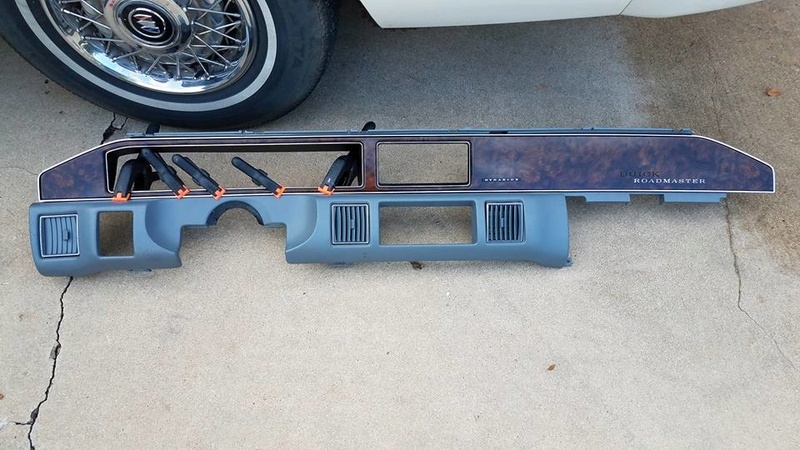 On boxy B-body sedans, you can change speakers in the trunk in no time. Not on round-bodies! 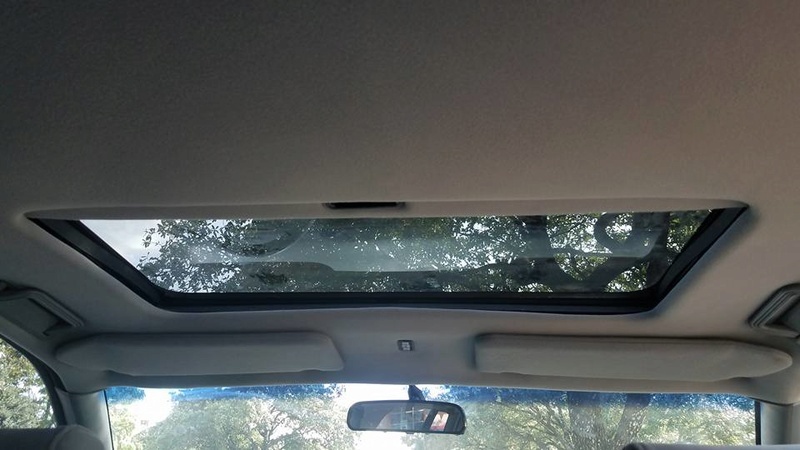 They mount from inside the car! Doh! 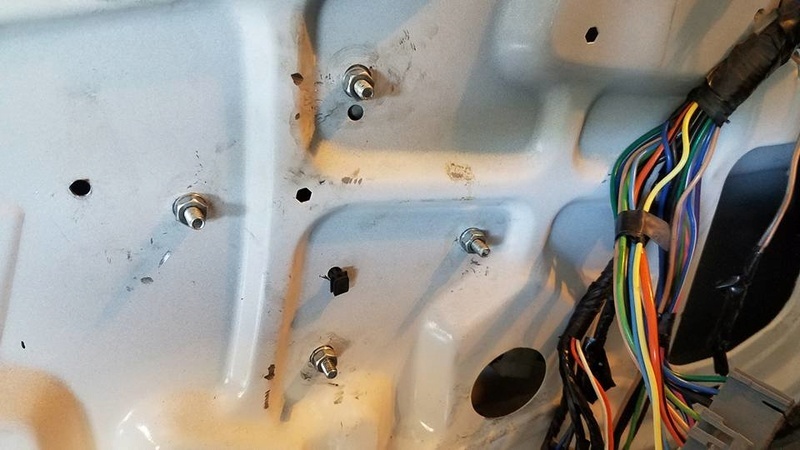 Have to remove all this to get to the rear speakers. Yikes. Notice in top picture I had to re-glue some of the attachment clips, being held together here with clamps. 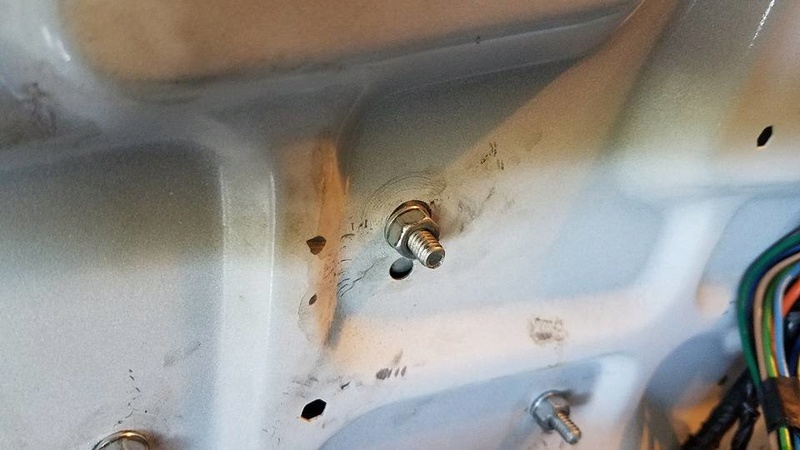 Found that the rear-mounted antenna wire was crushed under the seat frame...my guess is from the factory when brand new. Amazed this car has any radio reception! 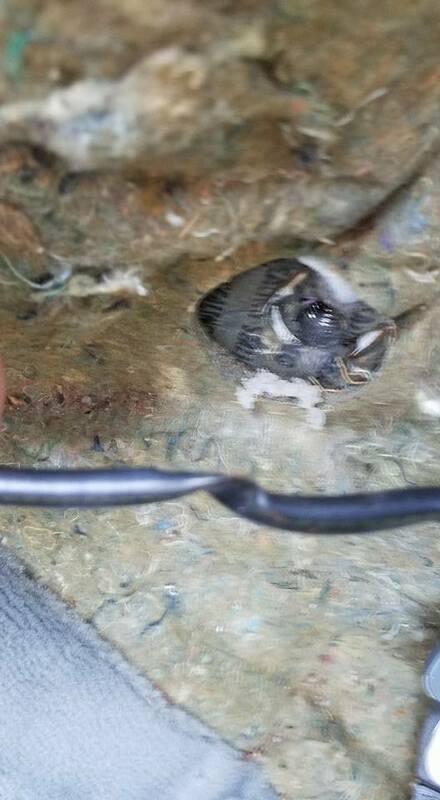 Look how crushed this wire is! 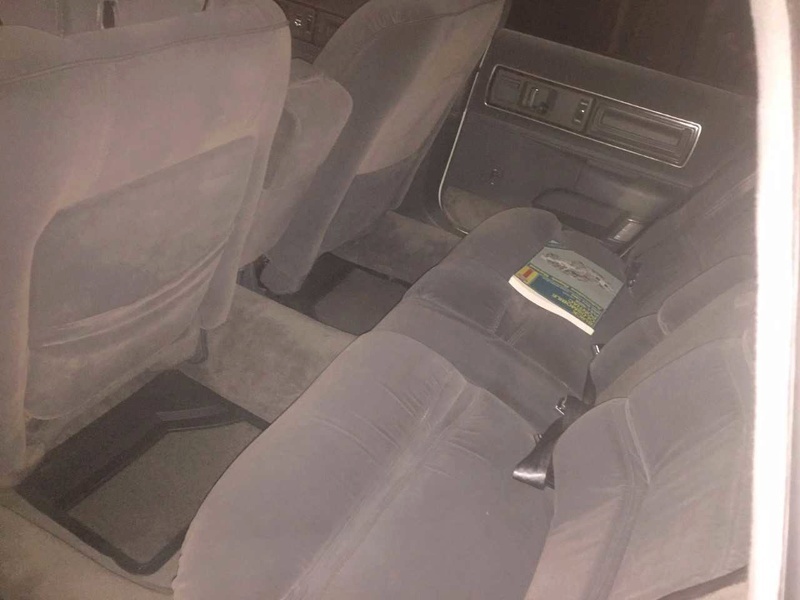 Found under the rear seat in the 92 Roadmaster Sedan. 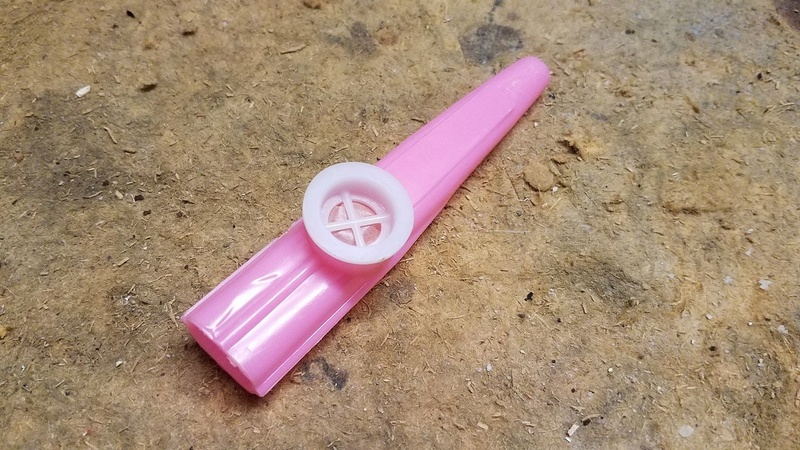 Don't you wish you could find a pink Kazoo too? 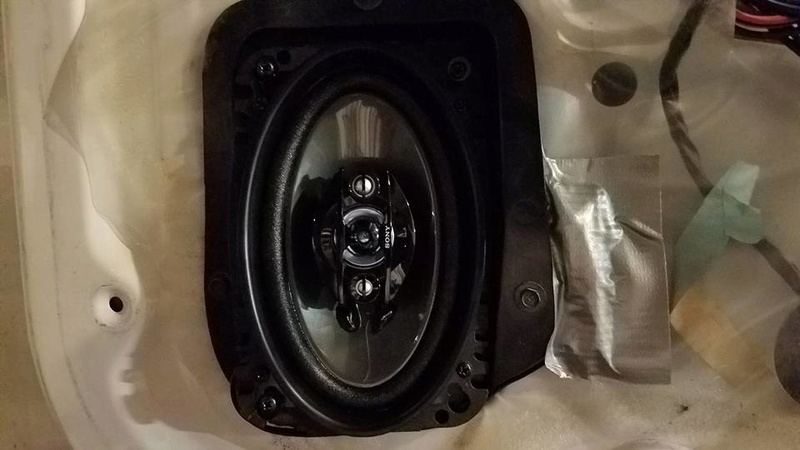 Old stock speakers, about to remove them. New Sony 4-way, 800-watt 6x9 speakers installed. 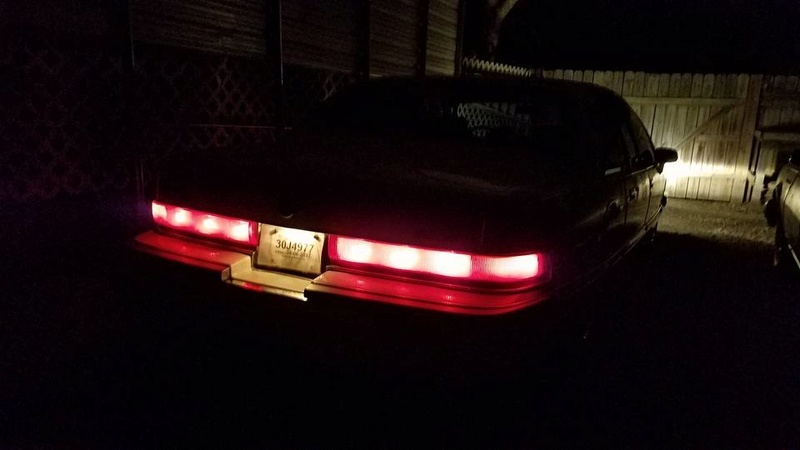 Also notice the HUGE 3rd brake light that contains three bulbs. Had to replace one bulb while this was apart. All fixed now. 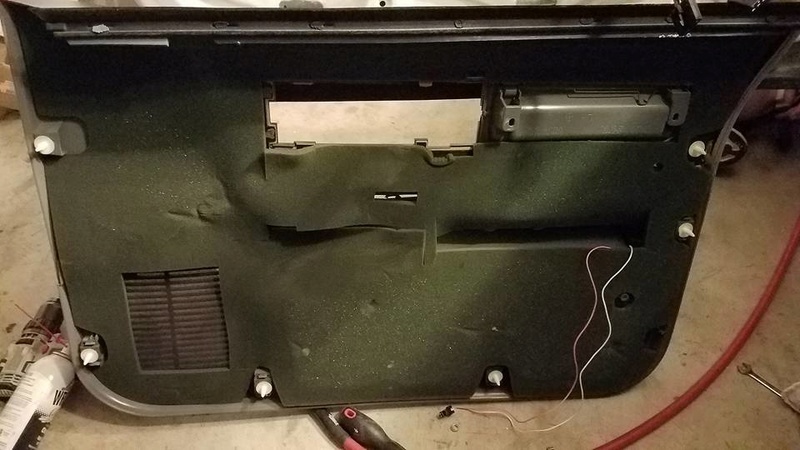 New Sony rear speakers installed and everything back together. 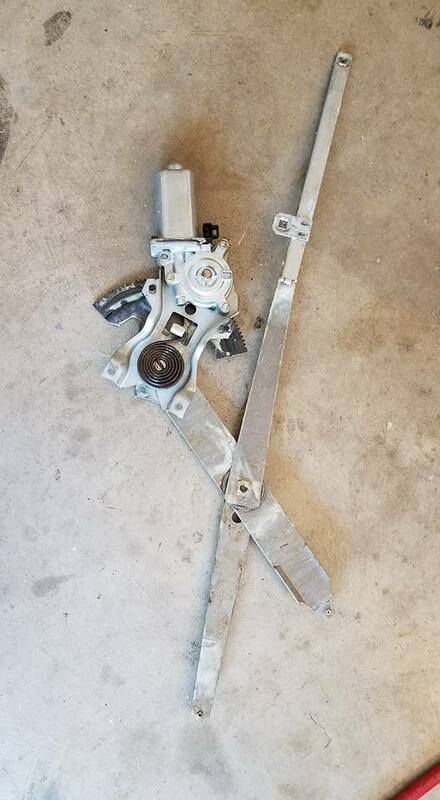 You'd never know it had been apart. 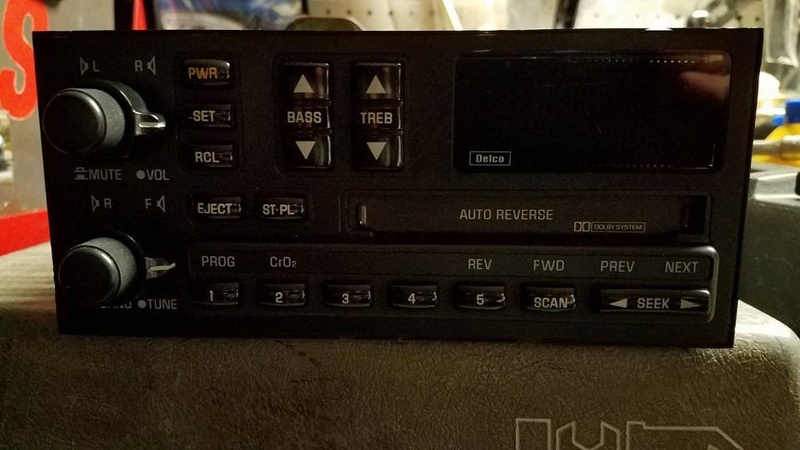 Once I got the back speakers installed, I went to try them and found out the original radio had a bad right channel, will only play out the left speakers. 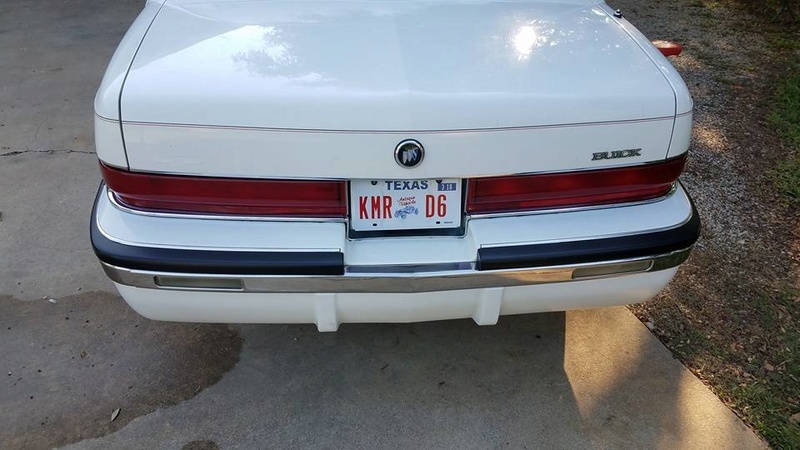 This Buick Riviera radio was donated to the cause by a good local car buddy. 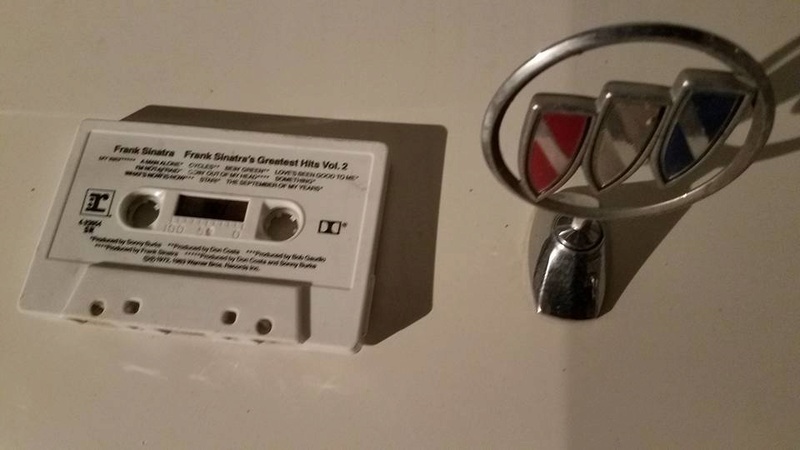 It's a step-up from what the sedan originally had, but still correct for the car, to retain the stock look, and will play the Frank Sinatra cassette that was in the car just fine! 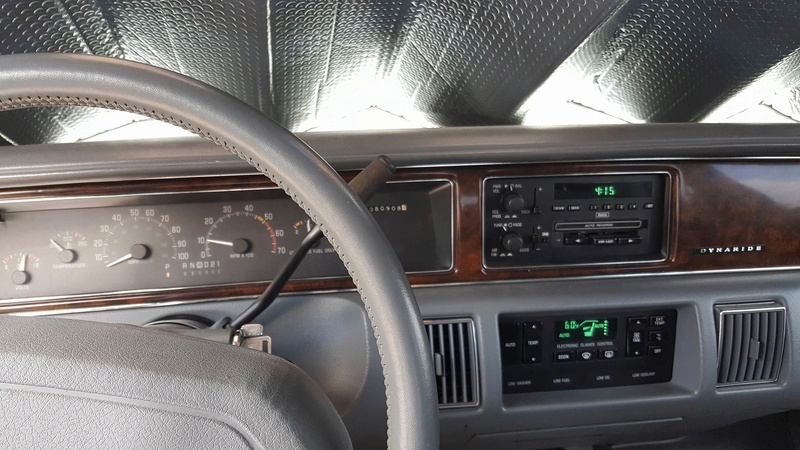 Hopefully I can get the radio installed after work tonight, and will be replacing one burned out light in the dash cluster behind the tachometer at the same time. 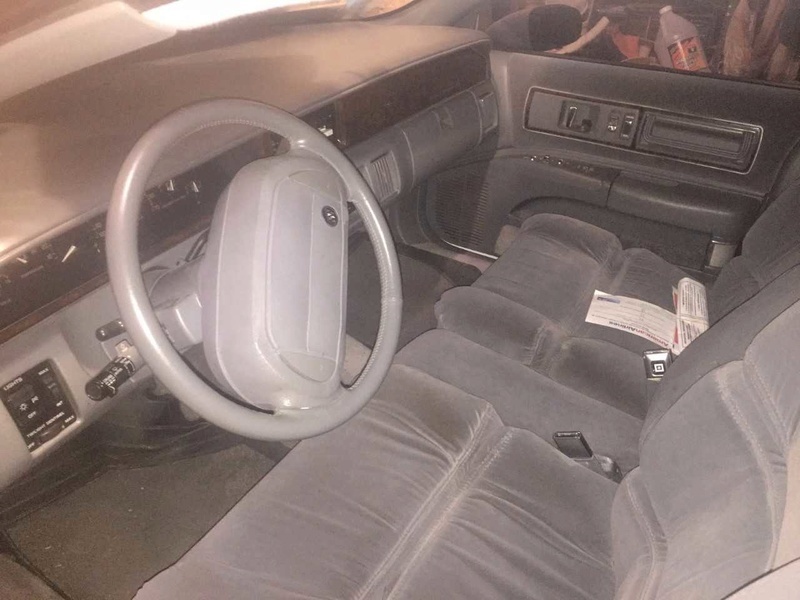 Then later in the week will do the rest of the power window repairs and replace the front door speakers. PROJECTS! Same on my daily driver '00 Century. 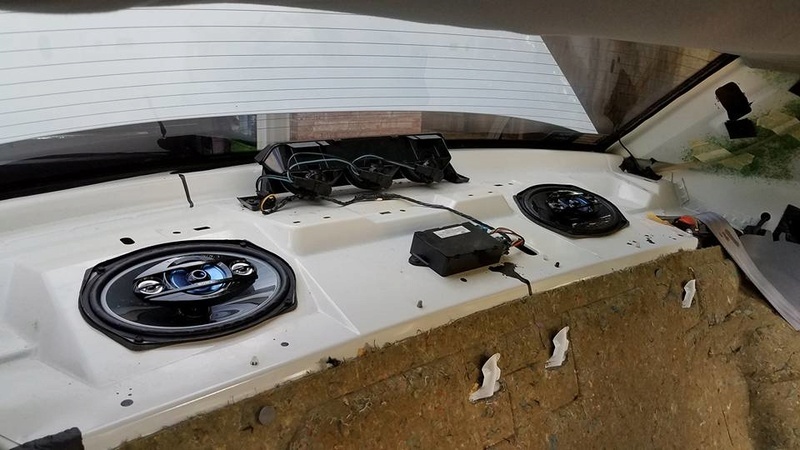 Seat comes out, package shelf comes up, speakers install. Looking good so far. Nice to see a TBI car getting some love. 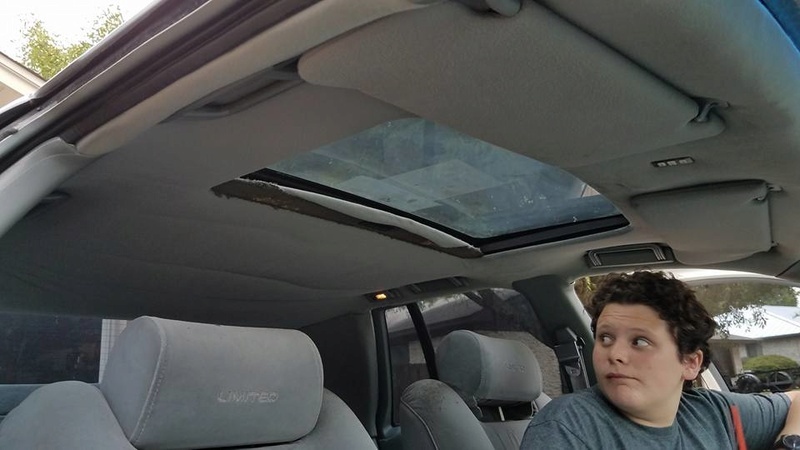 That sunroof is too cool. Would like to put one in my wagon. 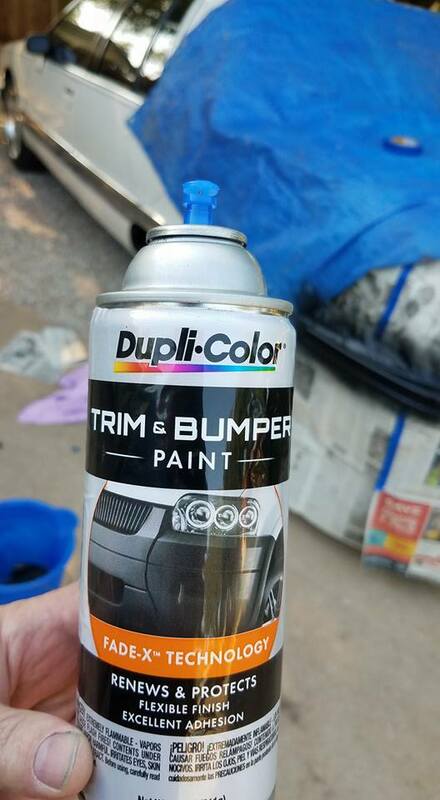 Those are white, and you can get other colors. Well I tackled this job last night, and raided my parts-stash to for bulbs. 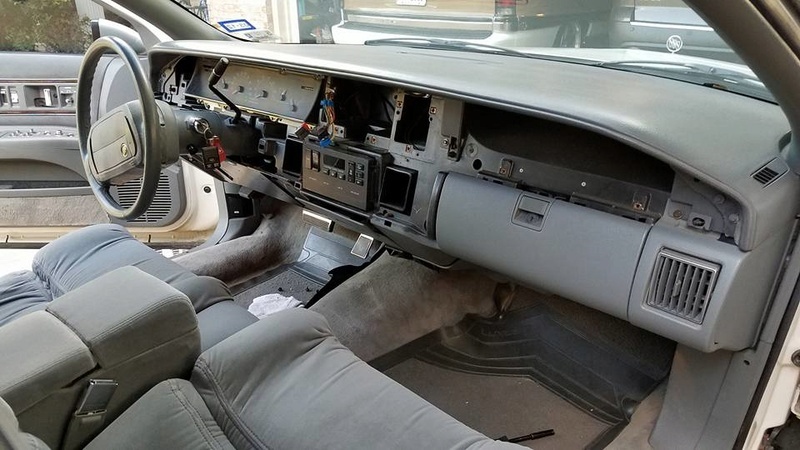 Took the dash apart yesterday evening to install new/used Delco radio, and also replace burned-out bulb in instrument cluster behind tach. 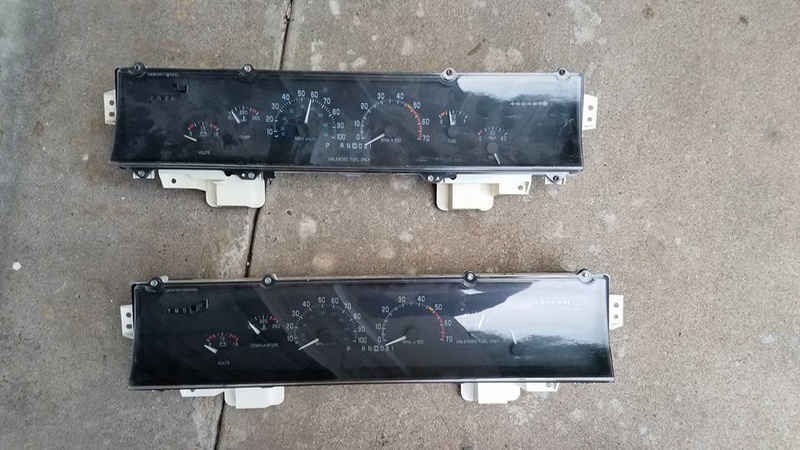 Can you believe I had a TBI Roadmaster gauge cluster in my attic parts stash? 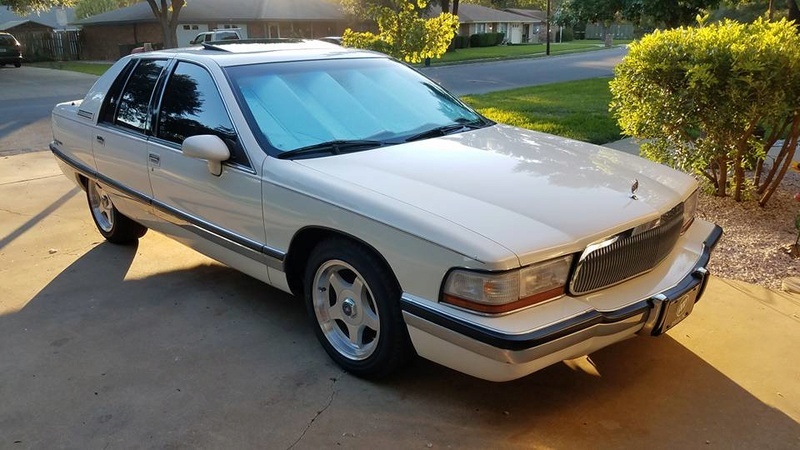 Me either...I've never owned a TBI Roadmaster, yet there it was. 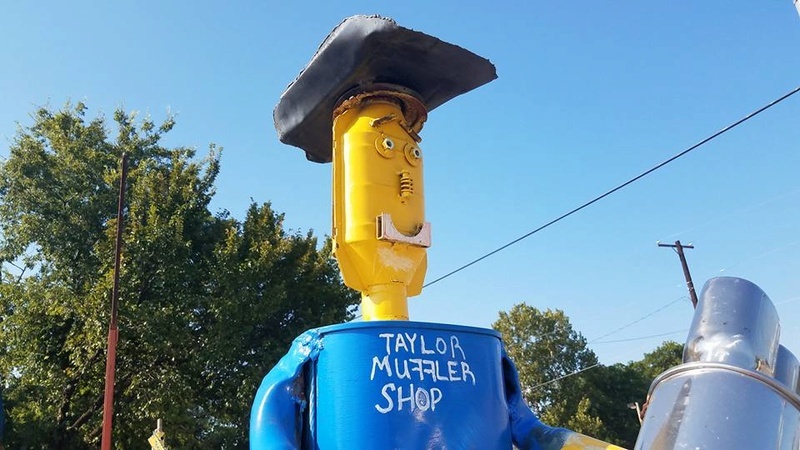 Stole needed bulbs from it. Ha! Dash is nice and bright now! 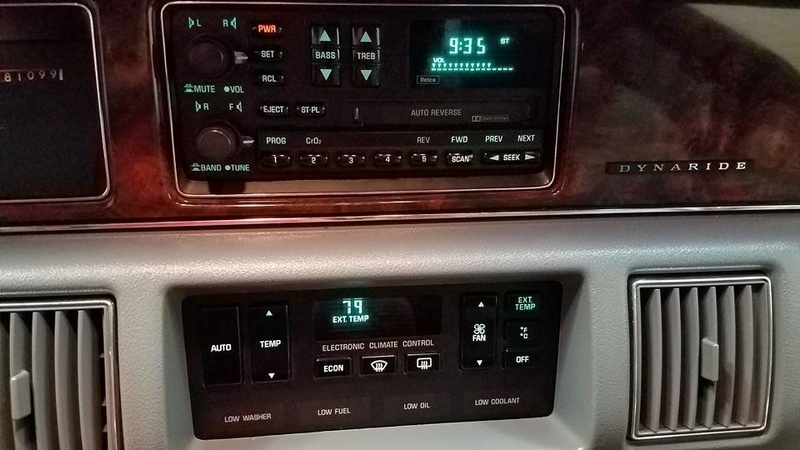 Got the radio in and it works fine. 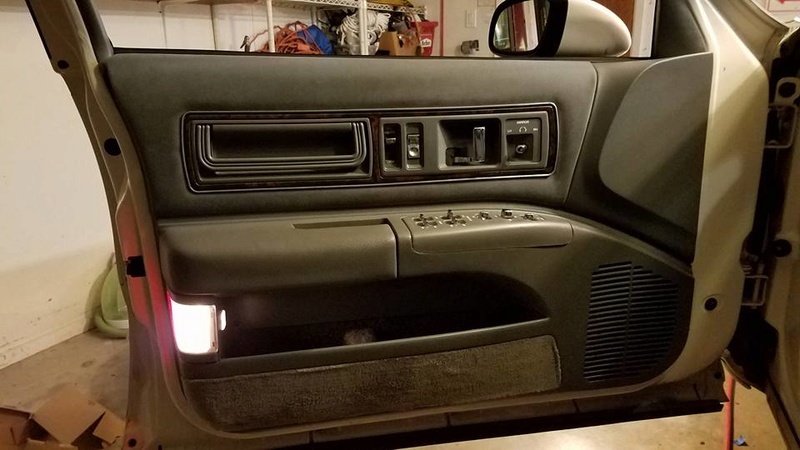 I still have to replace the door speakers, but the new rear Sony speakers sound good. Pardon the sound on my cell phone video...in person it sounds a lot better. My '96 Roady Wagon kept watch over me as I worked on the '92 Roady sedan. It's fun to compare the vehicles. It really is amazing how DIFFERENT two similar vehicles can feel. 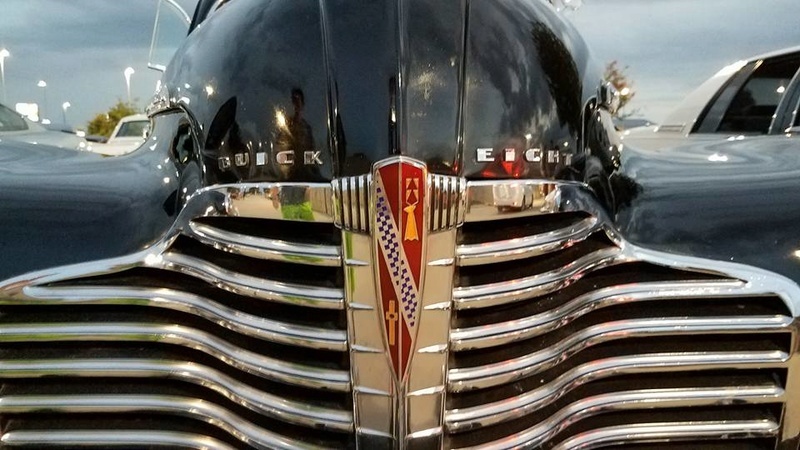 From the sound of the motors starting and running, to the way the doors close, to the feel of the seats and the view of the dash and over the hood, to the way they ride and handle, these vehicles feel TOTALLY different. 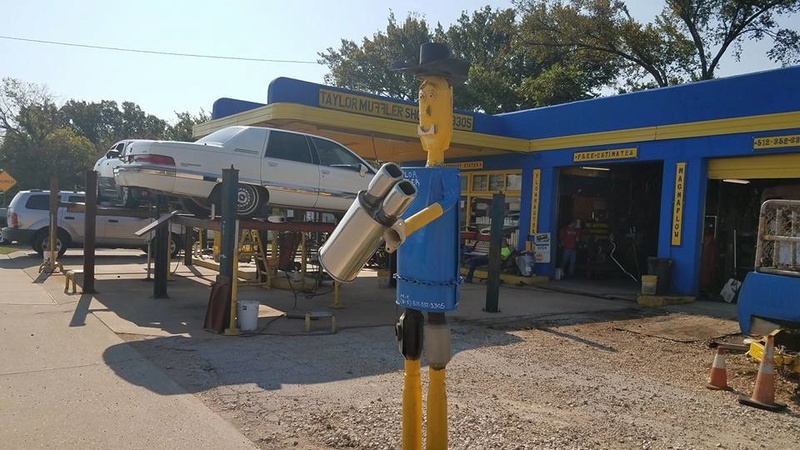 The Sedan is very soft (Dynaride! 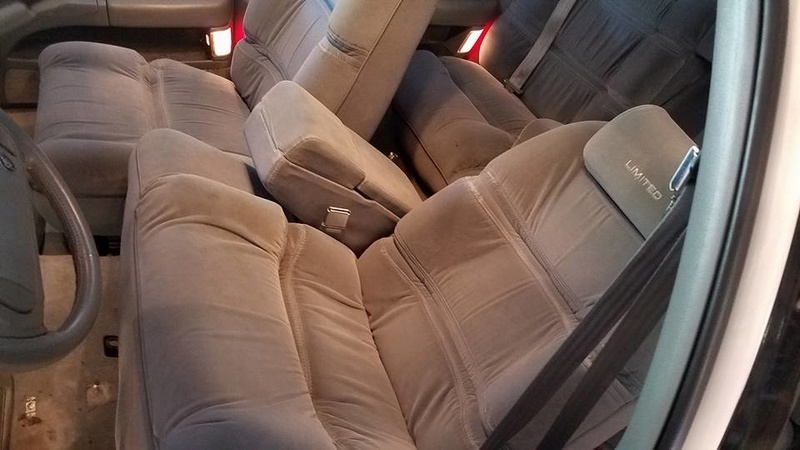 ), and very slow with the tall highway gears, but very smooth, and the cloth Limited seats make me want to take a nap, you sink into them and they curve around you. You can see more of the hood from the driver's seat in the Sedan, which makes it feel more...stately. 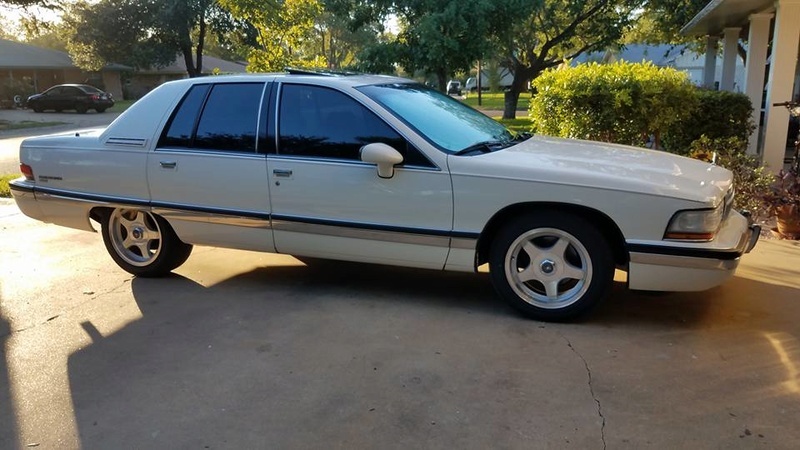 The wagon, with leather seats, is easier to slide in and out of, and the wagon handles much better (Gran Touring Suspension, Tow Pack and KYB Bas-A-Just shocks), is MUCH faster (LT1 baby! ), and feels much lighter on it's feet than the sedan. The handling is firmer, and it just feels...much newer. The wagon actually feels smaller too...maybe due to that sloping hood. They are both VERY nice vehicles, and it's fun to compare them. Oh, I hate, hate, HATE the wire wheel hubcaps on the sedan. Hard to clean, and they rattle and creak driving down the road. 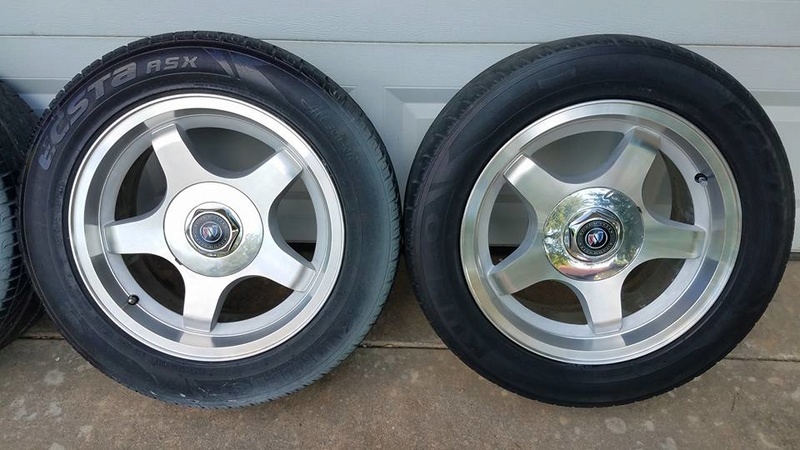 Can't wait to put the Impala wheels on the sedan! 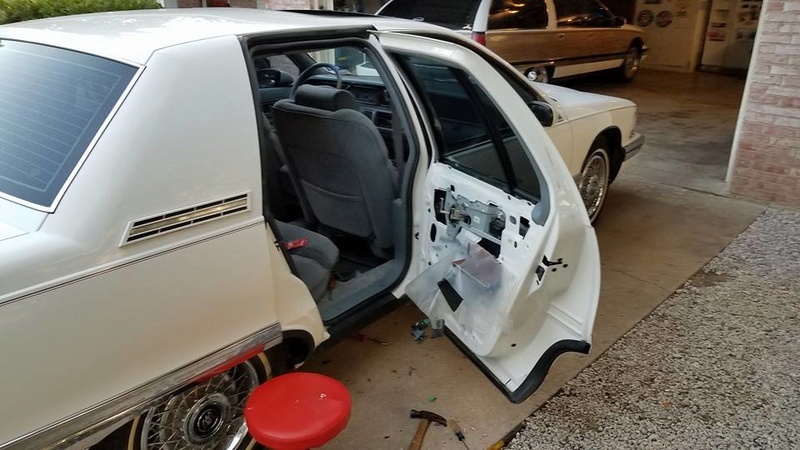 Next up for the sedan is power window work and new front door speakers. The new window motor for the driver's-front door should be in today or tomorrow...fun job there. 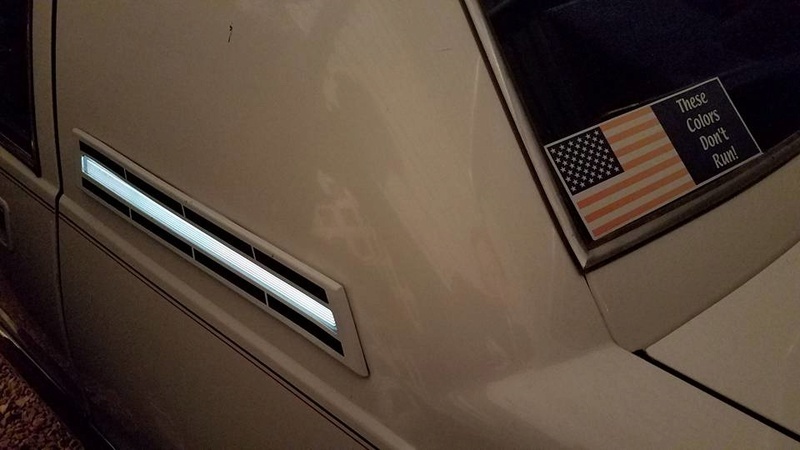 I also ran all over town this weekend getting Dorman/Help window sliders, #74444, which are getting harder to find. Seemed like every parts store had one in stock, and I needed six, so ran all over Austin. Projects! Having fun! Take Care All! 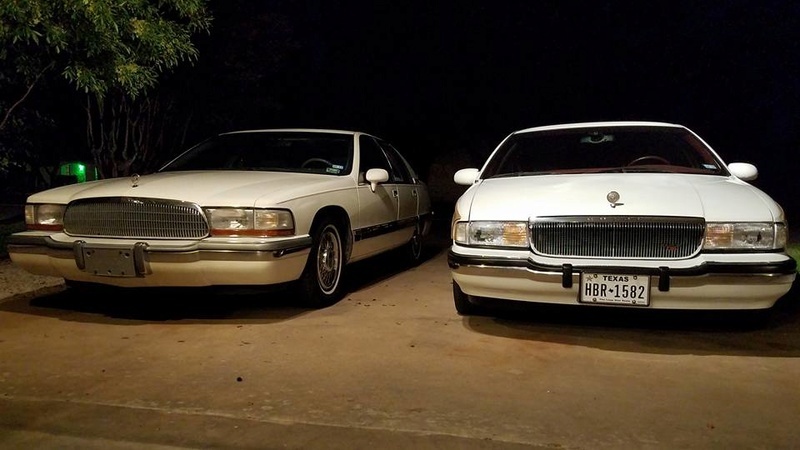 It is fun to compare the Roadmaster noses. 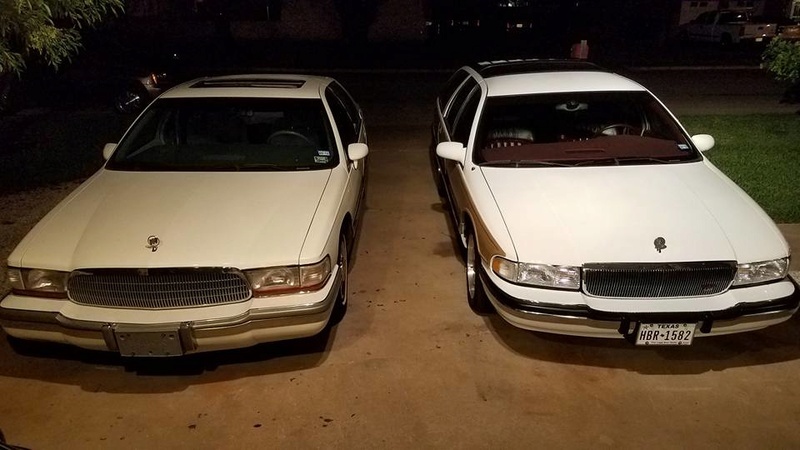 The sedan is much taller when you walk in front of it than the wagon. 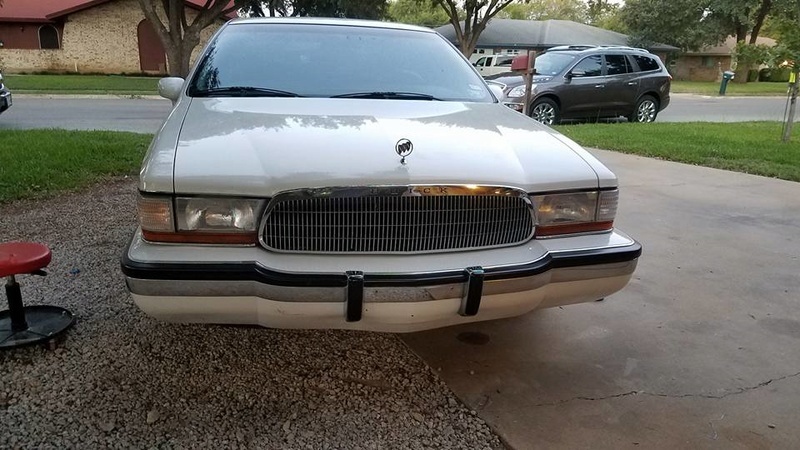 My son HATES the way the sedan looks, says it's frowning, ha! 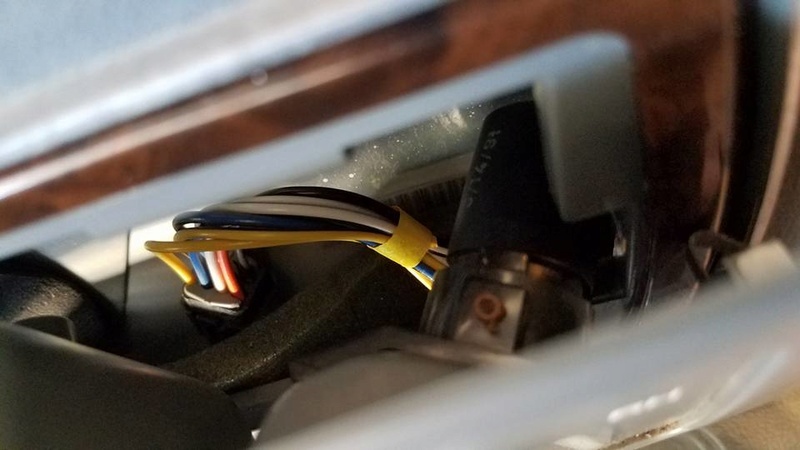 Window motors are painfully easy on these cars. Thread on ISSF makes them seem like a huge and dangerous undertaking, lol. They are anything but. Did all of them in my current wagon in an afternoon. Should have bought the rollers from RA when you got the motors. Much, much cheaper and less wasted gas than searching all over town None of my stores keep them in stock. I like it, the Rivera radio really does look nice. 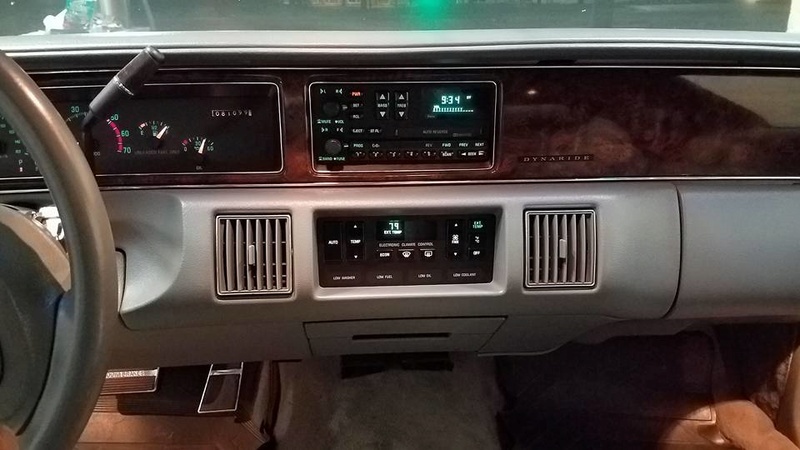 I'm glad a PO swapped in a Buick radio in my Olds, looks better than the base cassette, and sounds better too. 8/9/2017 - Window roller time. Passenger-side first. 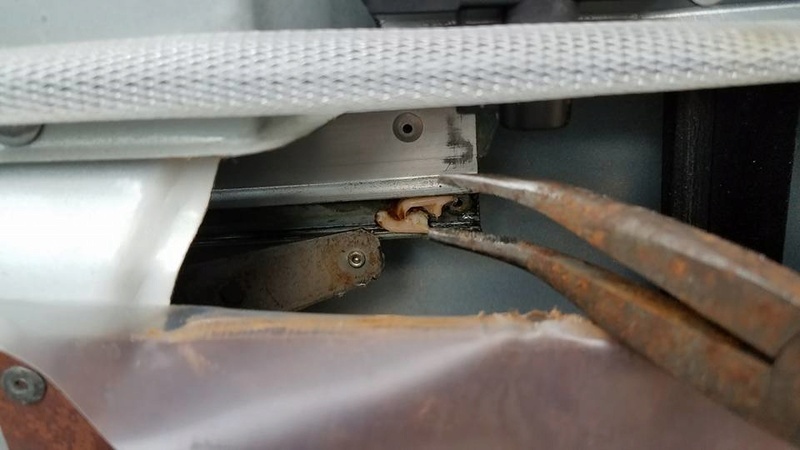 Well there's your problem! I HATE those factory sliders! Broken right in half! 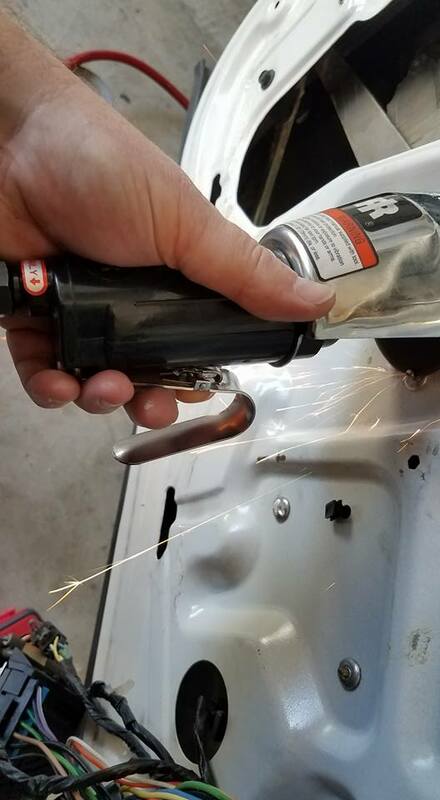 Must-Have pliers to remove old factory sliders. 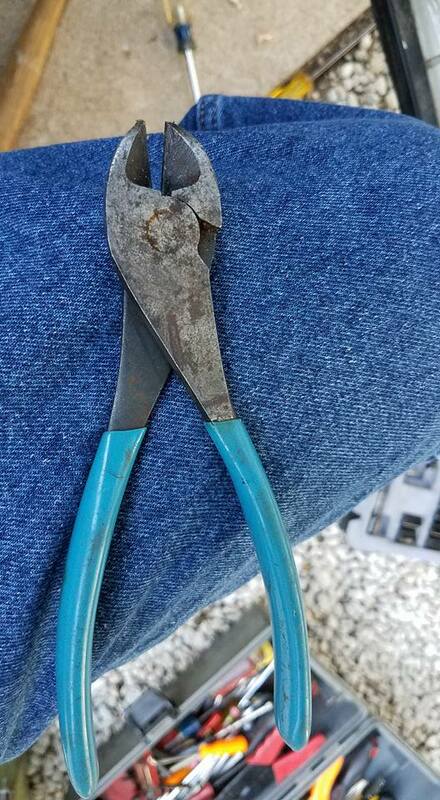 Use the diagonal pliers to snip the broken sliders in half, then yank the pieces out with some long-nose pliers. 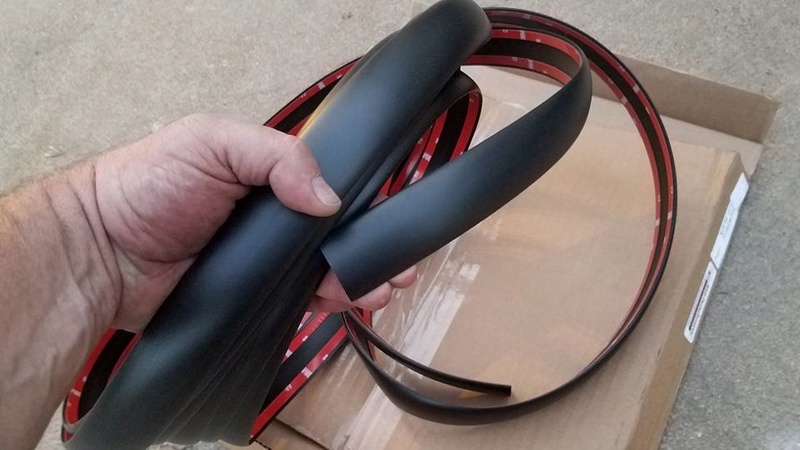 New Dorman HELP roller/sliders. 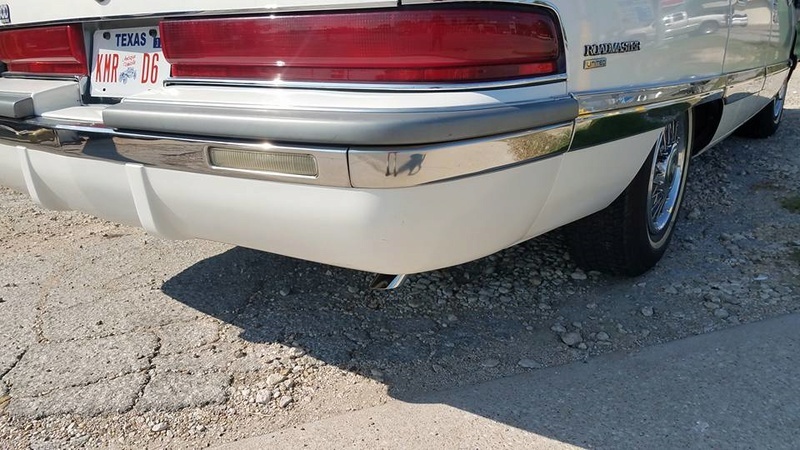 THE permanent fix for B-Body whales and round-body cars. I use my bench grinder to sand the thickness of the new slider nearly in half. 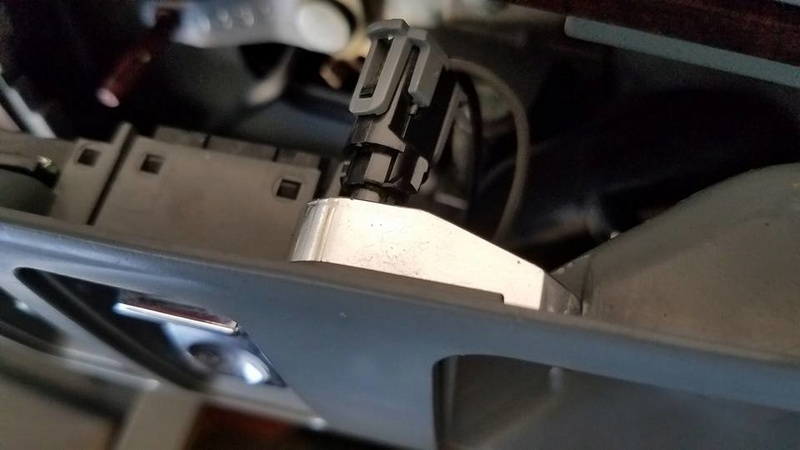 This allows the slider to be easily installed into the track rail, and to move totally free with no friction when using power windows. 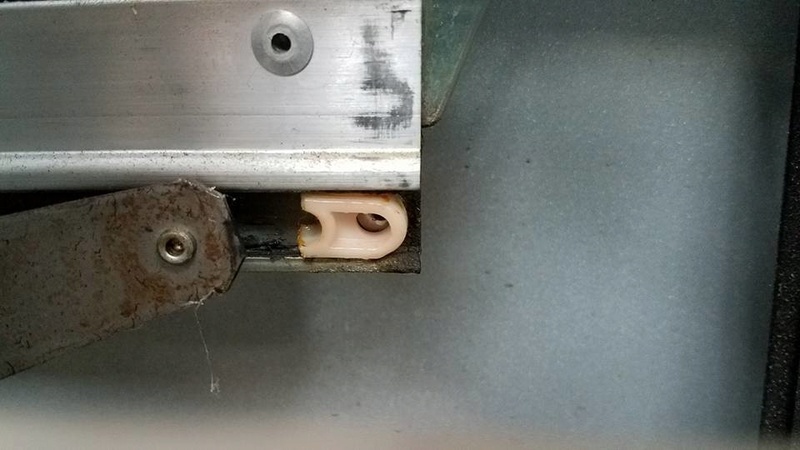 After installing the slider in the rail, line the ball pivot on the regulator up with the slider, and use a small clamp to force the ball into the slider. 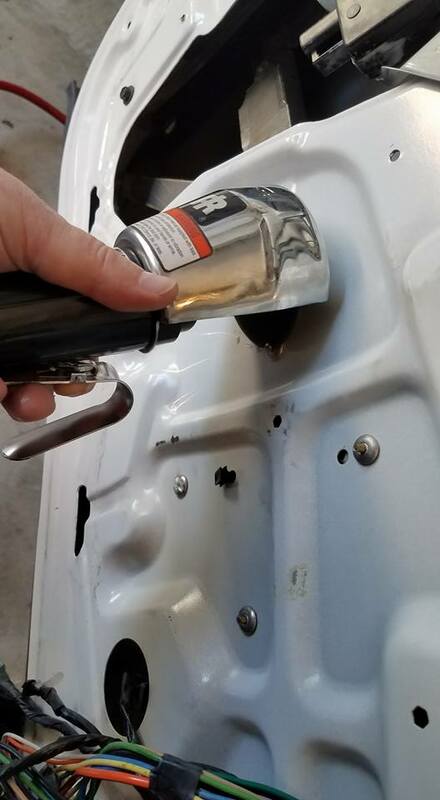 Apply white lithium grease to the rails, regulator pivot points, door latch and lock, and anything else that MOVES inside the doors while you have the chance. Run the window up and down a few times and then add more grease. Work the locks, door handles and such as well. Everything should move freely. Back together, and used some duct tape to re-attach the plastic protector. 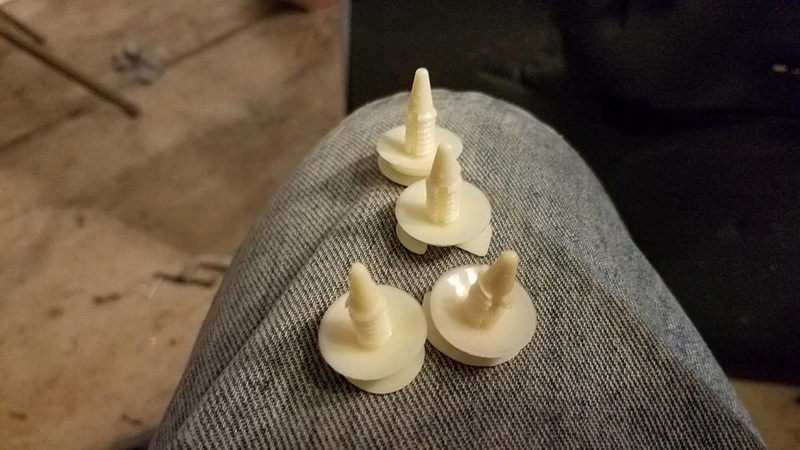 I also always replace the Christmas Tree clips. Bag is about $6 at Napa and worth it! No rattles allowed! New Napa Christmas-tree clips. These flex, unlike the brittle ones Autozone sells. 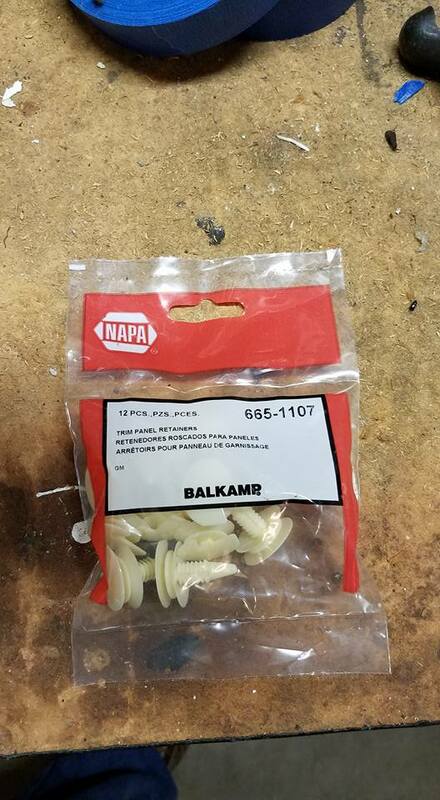 The Napa ones are just like factory ones. 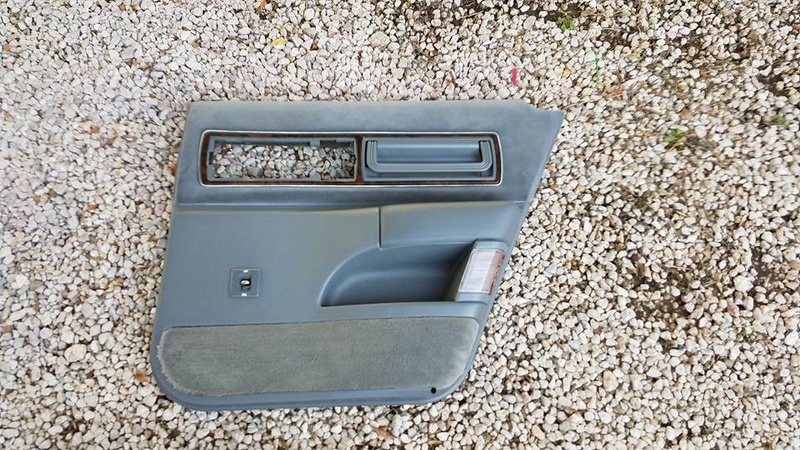 Passenger rear door back together and working perfectly! 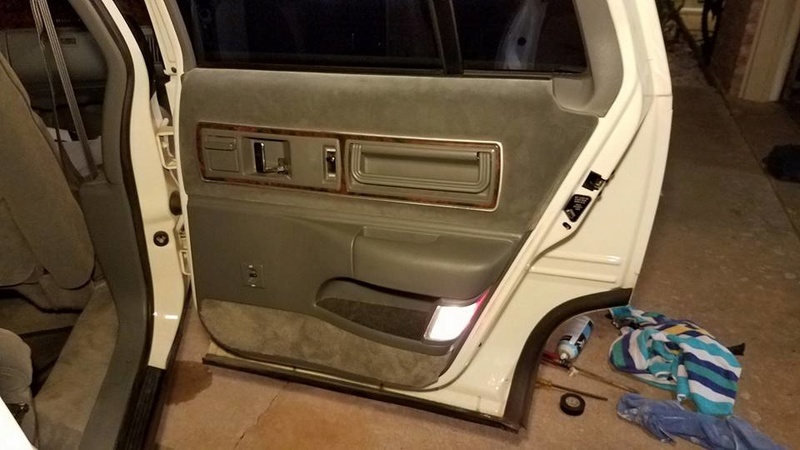 Front passenger door next. Same steps as above, plus added new 4-way speakers. 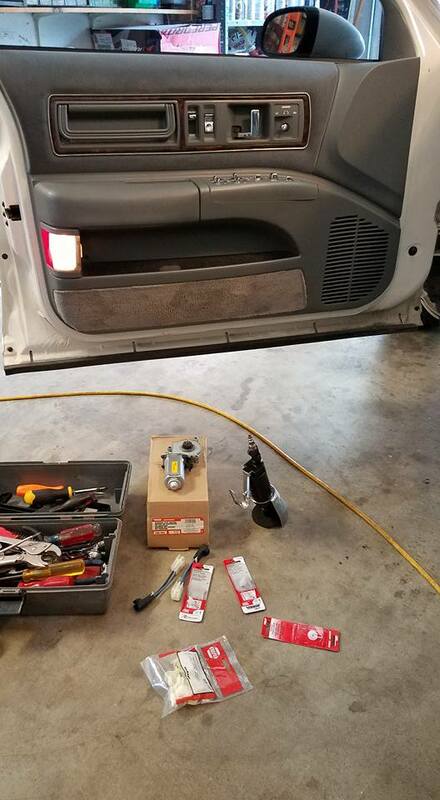 8/11/17 - Backed into the garage for driver's-side door window repairs and speakers, and shocks, and oil change. 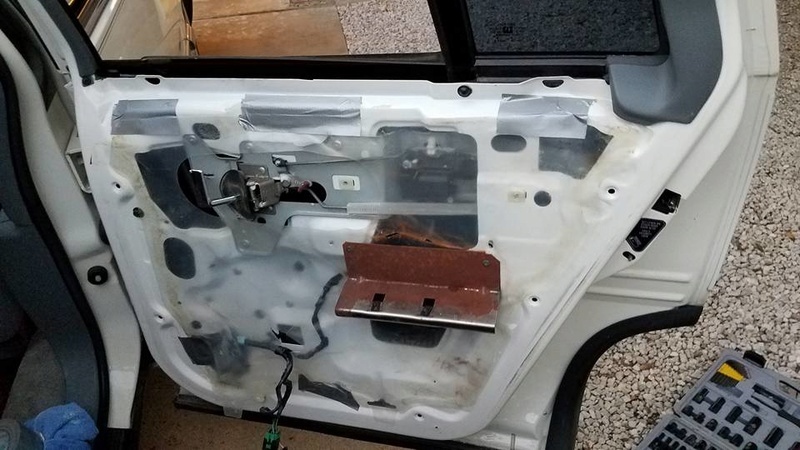 About to remove door panel. 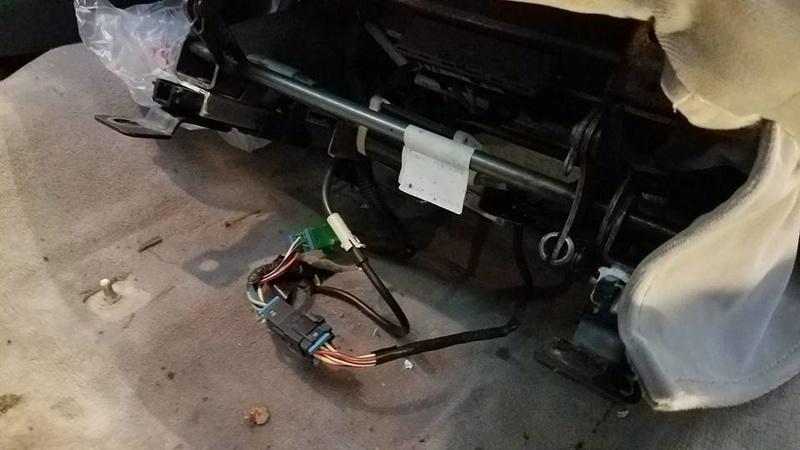 Driver's door has the most wiring mess. 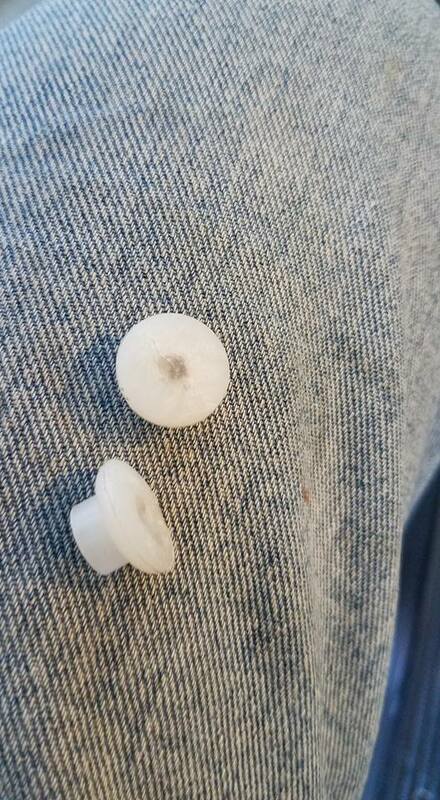 Need to be really careful too, all the plastics are brittle, want ZERO rattles. 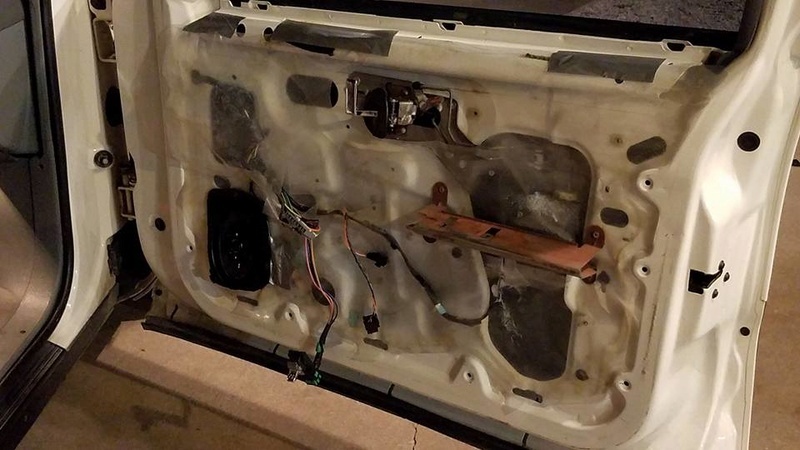 Panel carefully removed. These panels are more stout than the 94-96 panels, but they can crack. Got to be careful. Power seats are sticky, did not want to move forward and back with a person seated in the car. I unbolted and lubricated all the mechanisms really well. Works perfect now! Did both front seats, using white lithium grease on all adjusters and pivot-points. 8/11/17 - Time for shocks and the oil change. Got my son Eddie to jump in with this work. His first shock job. 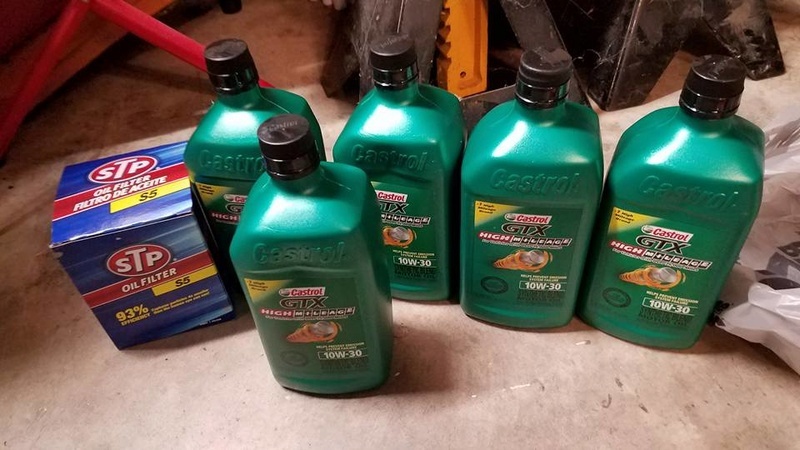 I personally like KYB Gas-A-Justs, but the Excel-G are good too, just softer. We're trying to keep that "DYNARIDE" smoothness, but just without the extreme float. These will do that. Eddie Massey doing his first shocks. Proud of my smart kiddo! Removing the oil FROM 2012! Yikes! It was still not black...that's something... Car will be MUCH happier now! 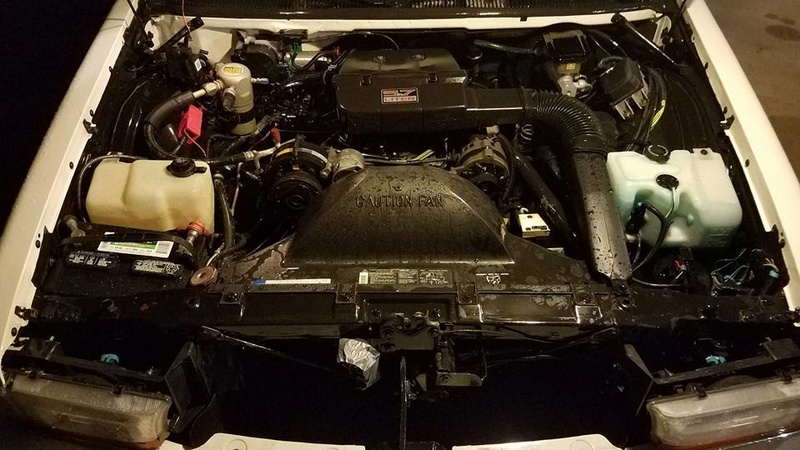 Nighttime Engine Degreasing and Detail. Because it's August in Texas and this is the coolest time of the day! LO5 5.7 TBI 350. Outstanding motor, will run FOREVER! 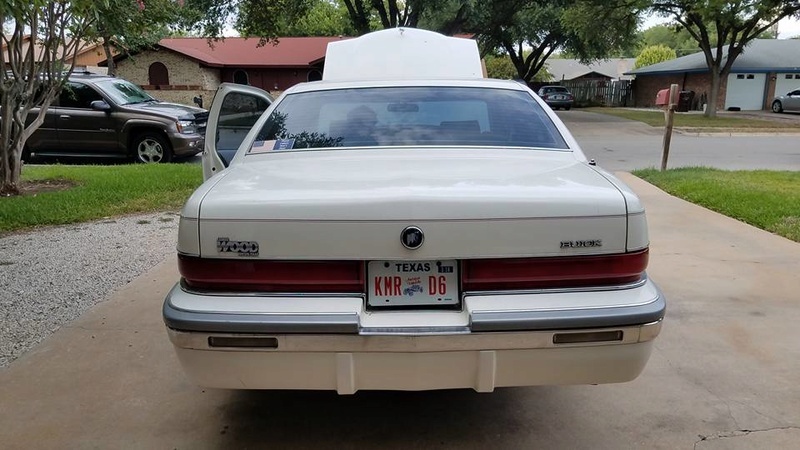 This is the THREE-BODY mafia trunk. 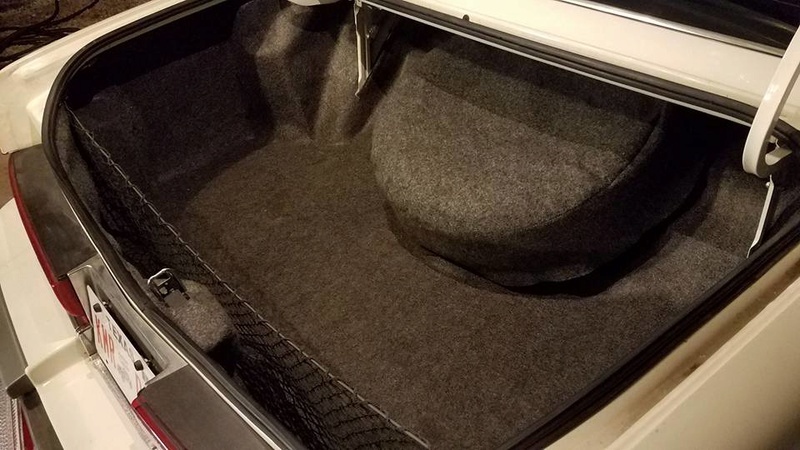 Cleaned-out the trunk, aired up the original Uniroyal Gold Seal spare tire, mounted the jack and hardware correctly and installed the tire cover and storage net. Also lubricated the trunk auto-latch pull-down assembly. Everything looks new! 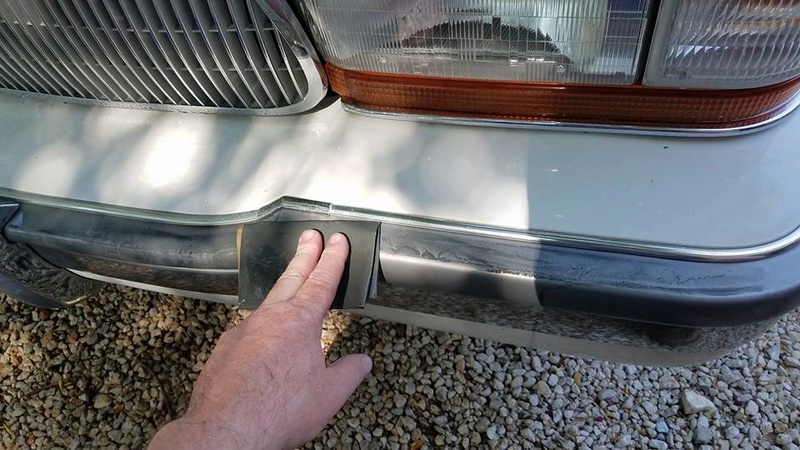 8/13/2017 - Ran all over Central Texas looking for a reverse-light pigtail assembly. 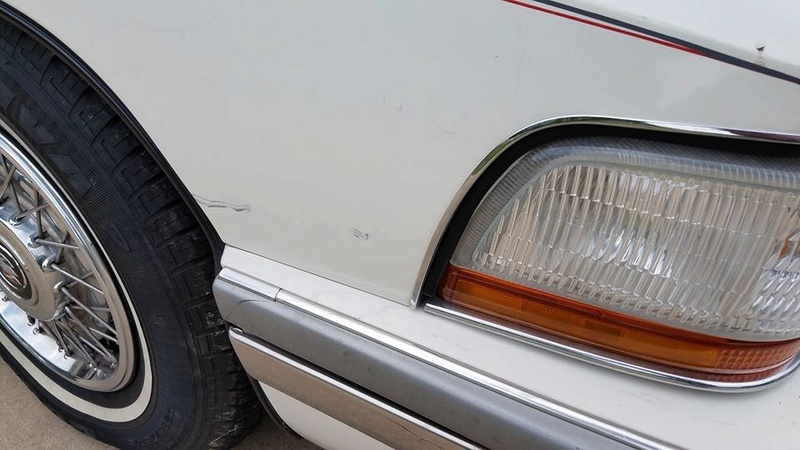 The one on the '92 Sedan was torn and socket cracked (my guess was in shipping). 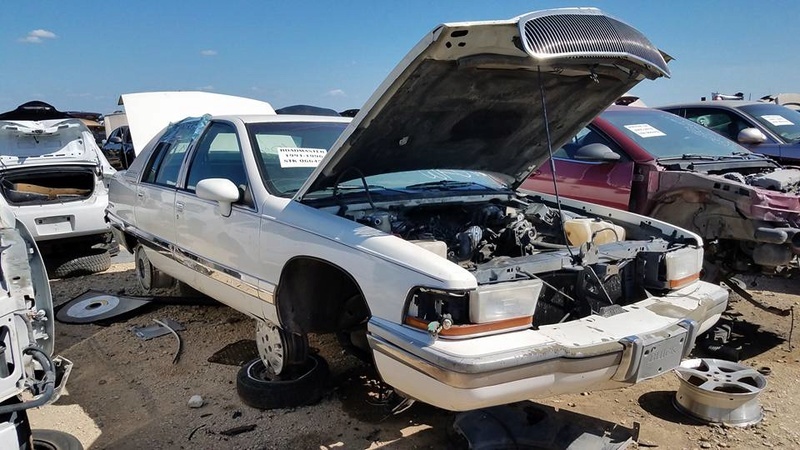 Finally found this 1993 Roadmaster parts car at Austin Wrench-A-Part with 190k miles on it. 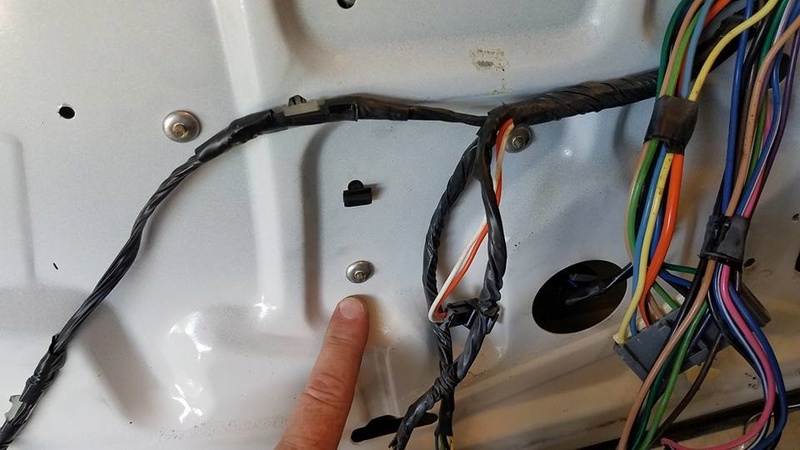 Got the needed reverse-light wiring pigtail off this car....was HOT! Said 104-degrees in the parking lot. WHOO!!! 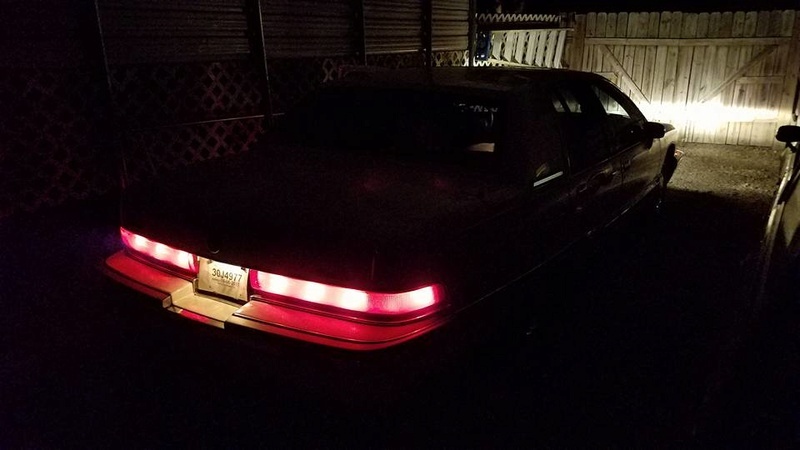 8/14/17 - Reverse lights fixed, all bulbs on entire car now working. 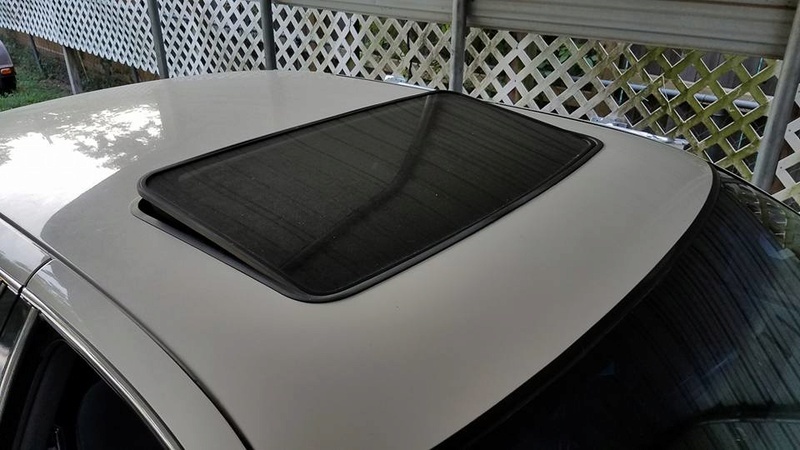 Next repairs are the a/c system and headliner replacement. Will keep the updates coming! 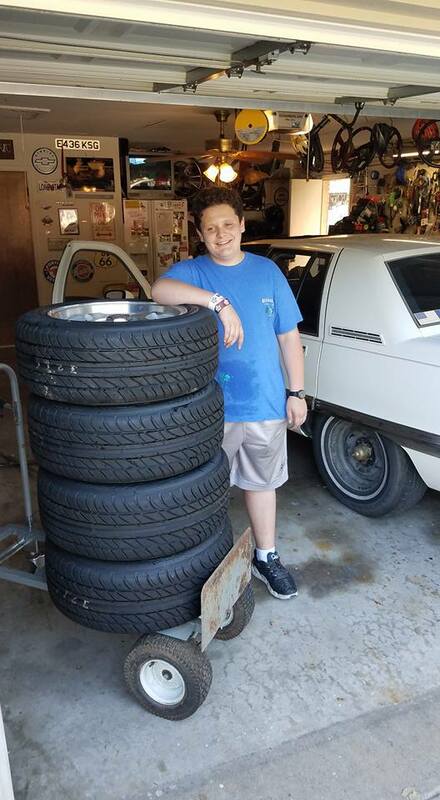 This morning, 8/16/17 - Rolling the new tires and wheels in for Mr. Serna to mount and balance. 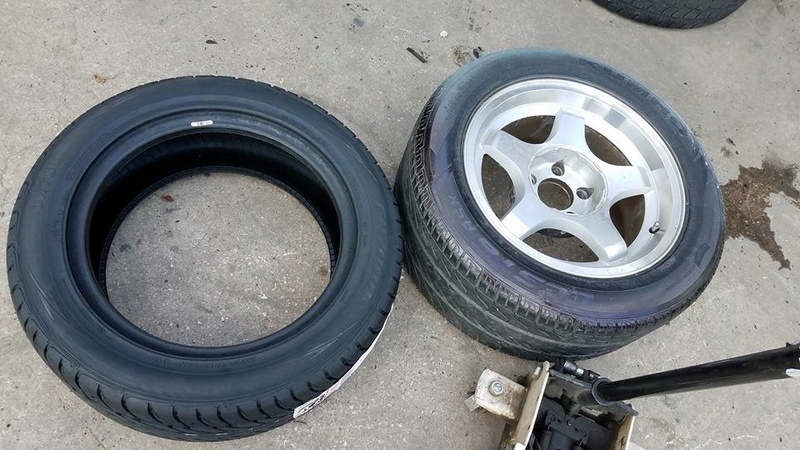 New tire on left, old still mounted on right. 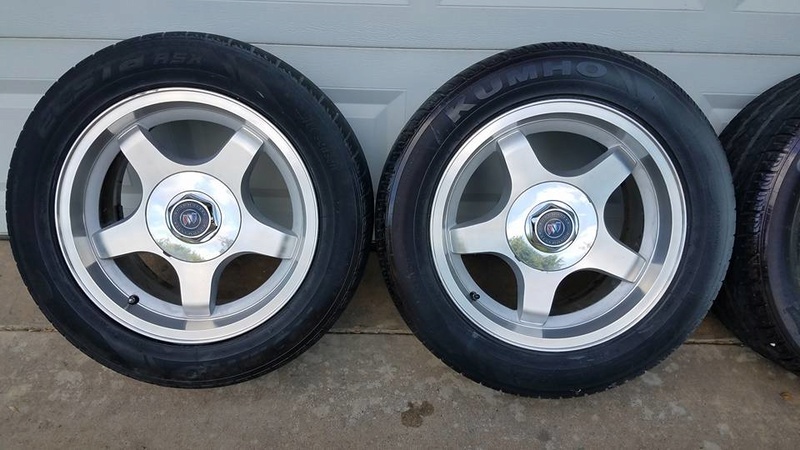 Those old junk Kumho tires were super wide! New tires mounted. Back-balancing so no weights on the front, looks better. Another load of joy! 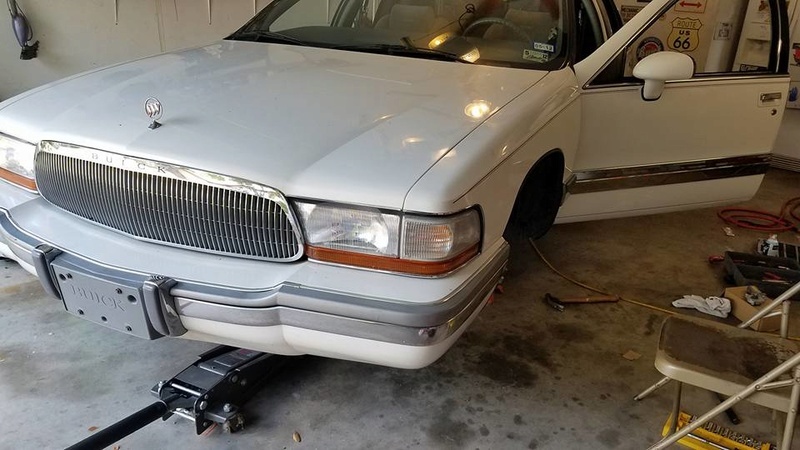 New tires mounted on refinished wheels, Buick center caps installed. Will mount on the car soon! 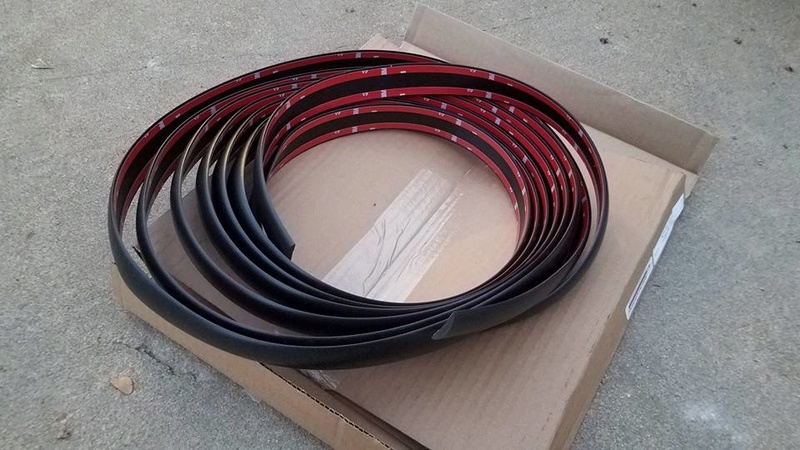 Looking forward to seeing how much different the car looks with these installed. It's always amazing to me how much wheels and tires change the look of the car. 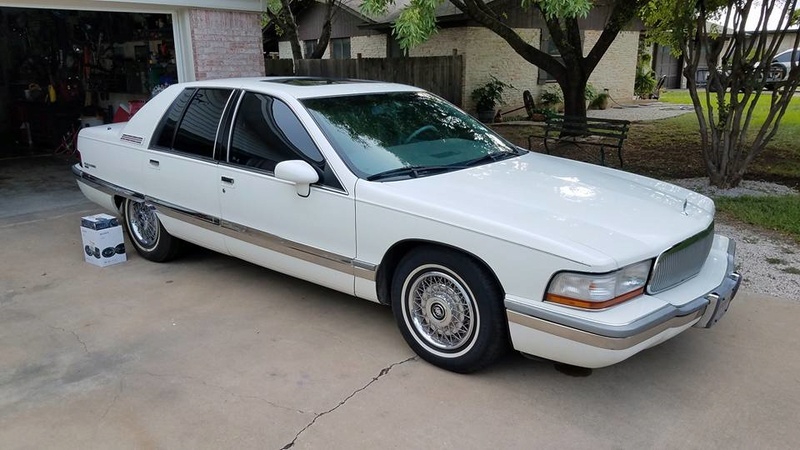 Oh and as for size, the 235/55/17 is not as low and wide as what the Impala SS cars got, but I've had issues with groove-following/road-walking with wide tires on the wagons, and moved to these some years back, and these ride smooth and there is no steering wheel pull. Also there is almost no change in the speedometer reading with this, and I've checked with my GPS. 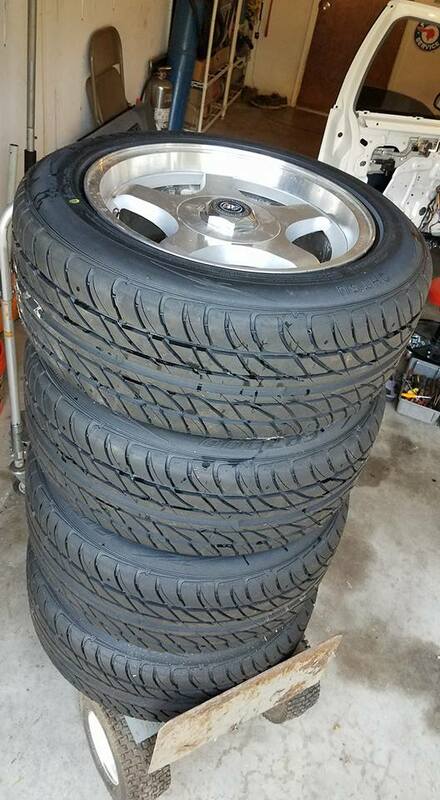 These are Falken Ohtsu FP7000 tires can be bought for $280 on Ebay. 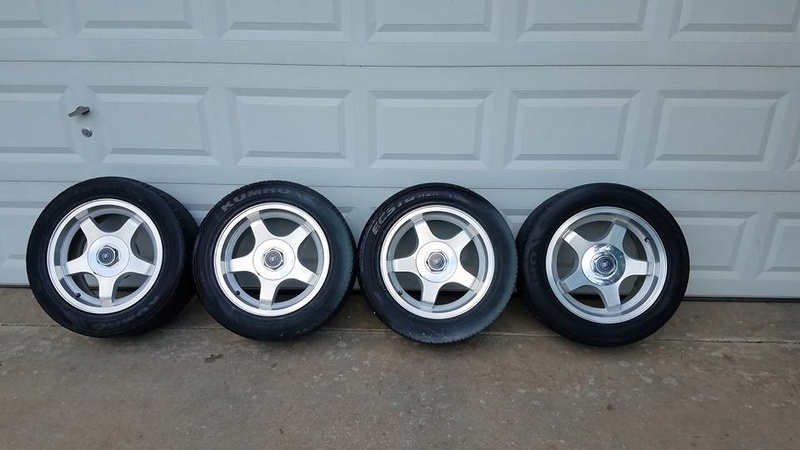 I guess we'll see how they ride and how quiet they are, but at that price these are about the same price I was paying for used Pirelli PZero Nero tires....which sadly have not been showing up used like they were when this was the Crown Vic and V6 Mustang go-to size. 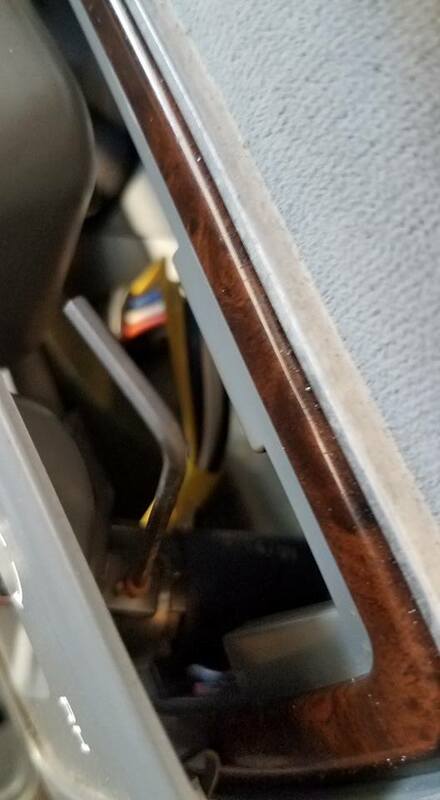 8/16/17 - A/C fixed on the 92 Roady sedan. 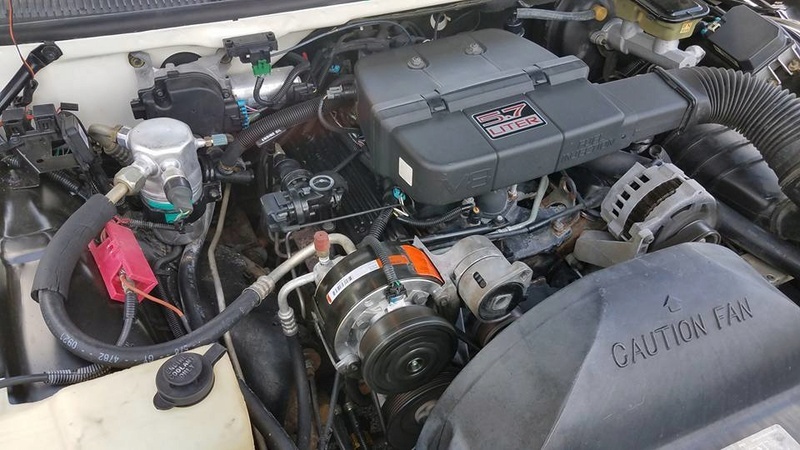 New Delco compressor, accumulator and orifice tube, system flushed, new O-rings and oil. Running quiet and blowing COLD. Coming Along! Will post next update in a week or so! Looking good. 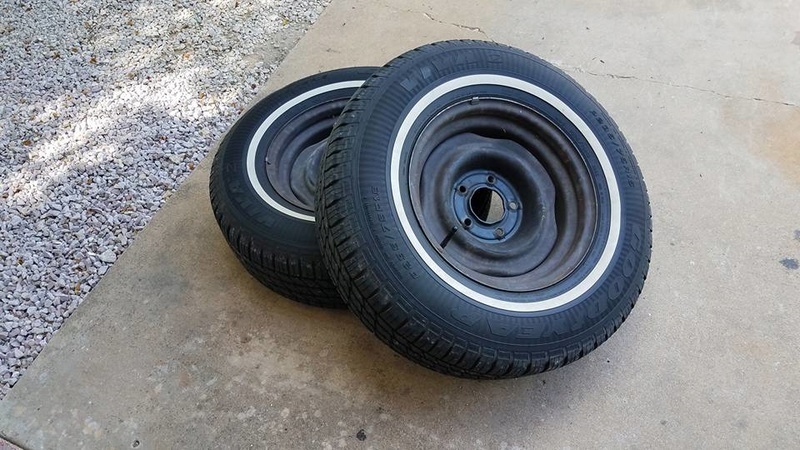 Im with you,wheels and tires,make or break the ride. Always changes the attitude of the ride. 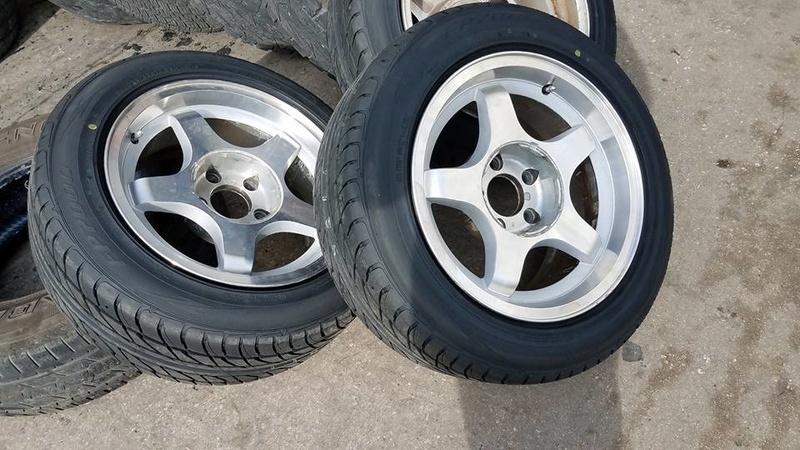 If the car had the factory aluminum wheels I would have just been hunting for tires, but the wire wheel hubcaps creak and rattle going down the road, and are a pain to clean anyway. I've always hated them. 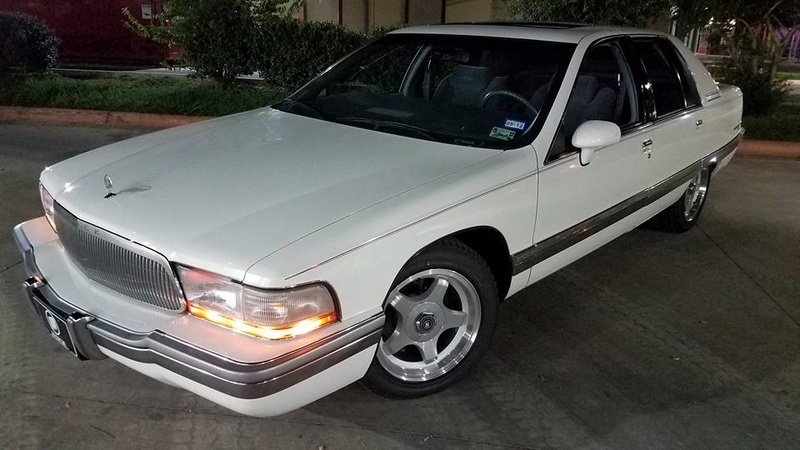 I would have really liked to have found some chrome 15-inch Buick Road Wheels, since those look GREAT on these cars, but the Impala SS wheels showed up locally, so there we go. TIME FOR AN UPDATE! Here We GO! 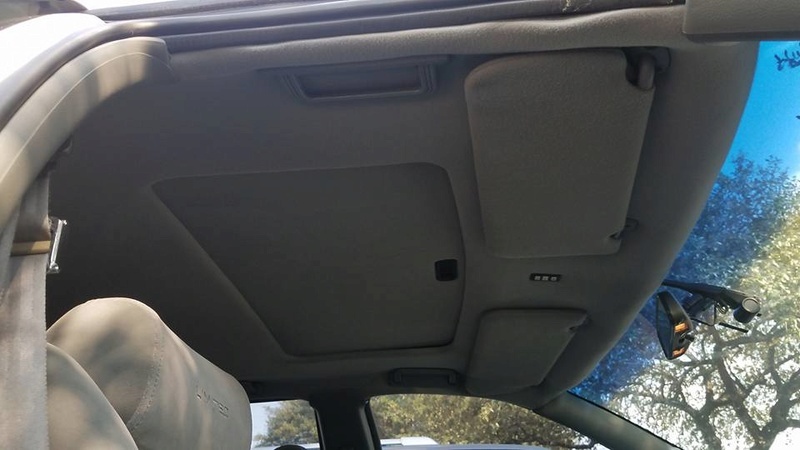 9/2/2017 - New headliner installed. 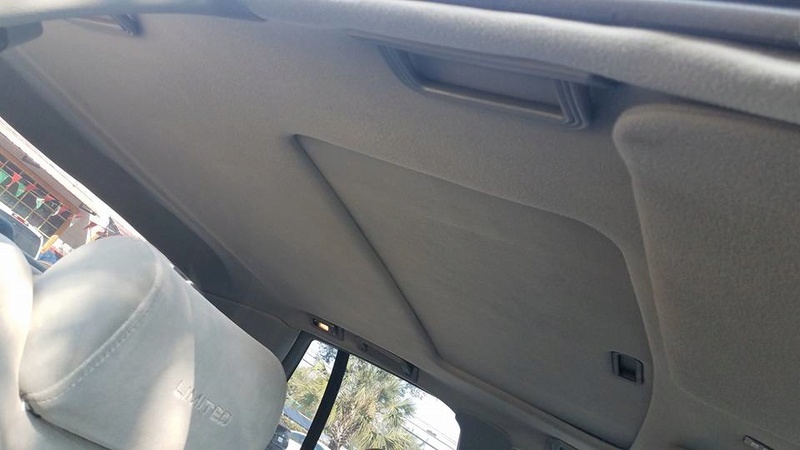 My interior guy was not happy with the aftermarket ASC power sunroof. 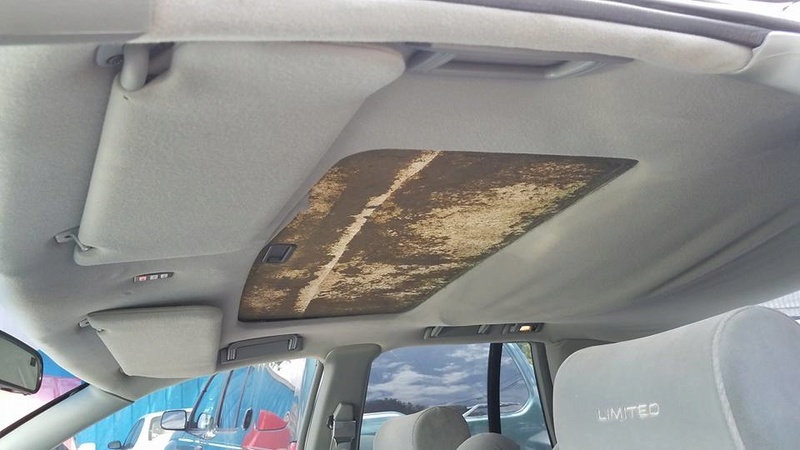 This job took over two weeks and the fabric had to be installed inside the car...could not remove the headliner like on a normal car. Looks good! Shade slides fine and everything works! 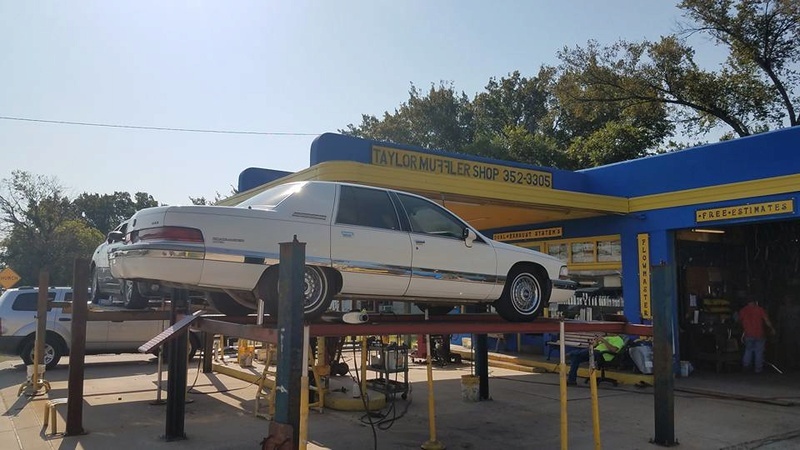 9/2/17 - Took the Roadmaster Sedan to Taylor Muffler, because when we did the shocks we noticed that the muffler was bulged and the car had always sounded a bit loud under load. 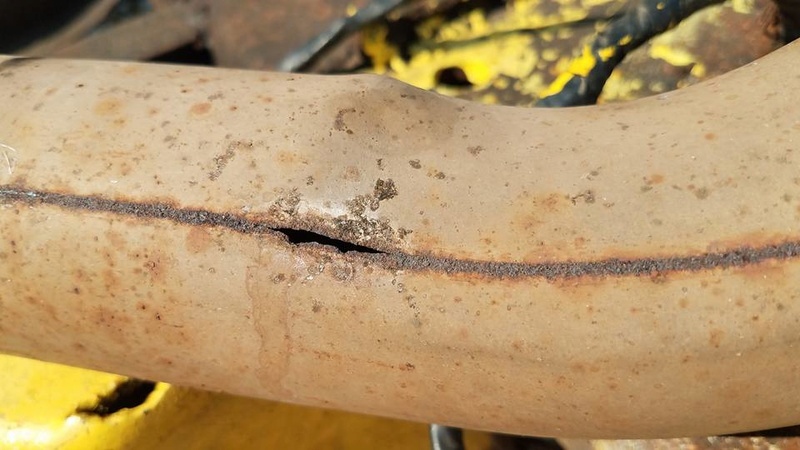 Discovered the muffler had broken baffling inside AND the mid-pipe between the catalytic converter and muffler had three rust holes at the weld seam. 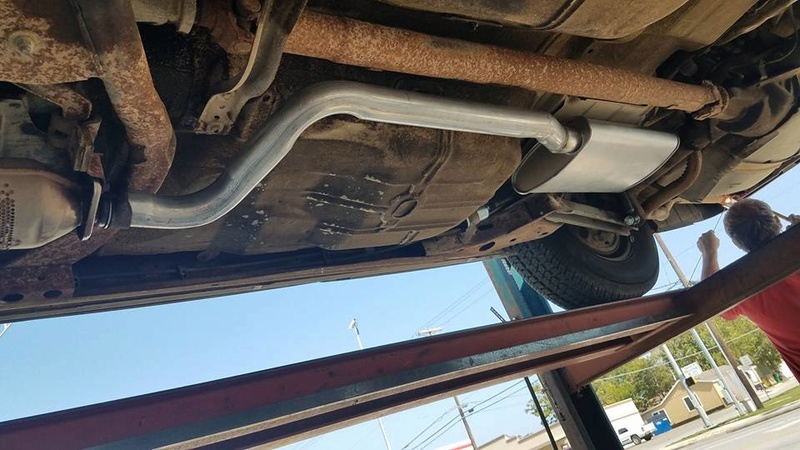 New exhaust mid-pipe, muffler, and chrome exhaust tip welded on. 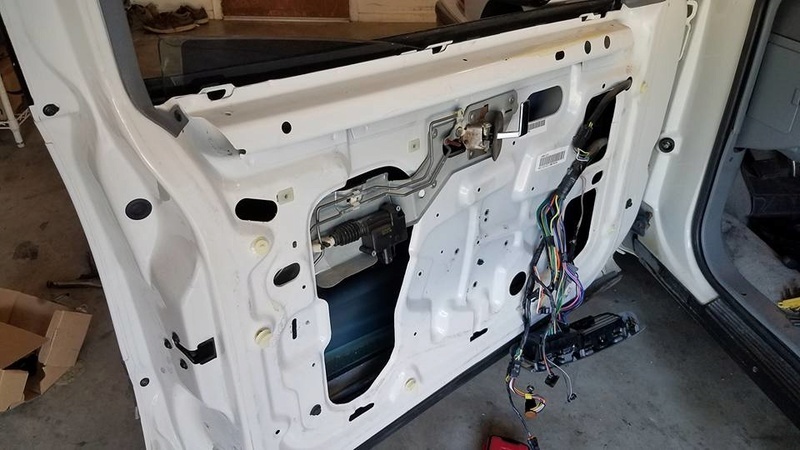 9/4/2017 - Door panel coming off again. Already did one roller/slider in it, but the motor is acting up. 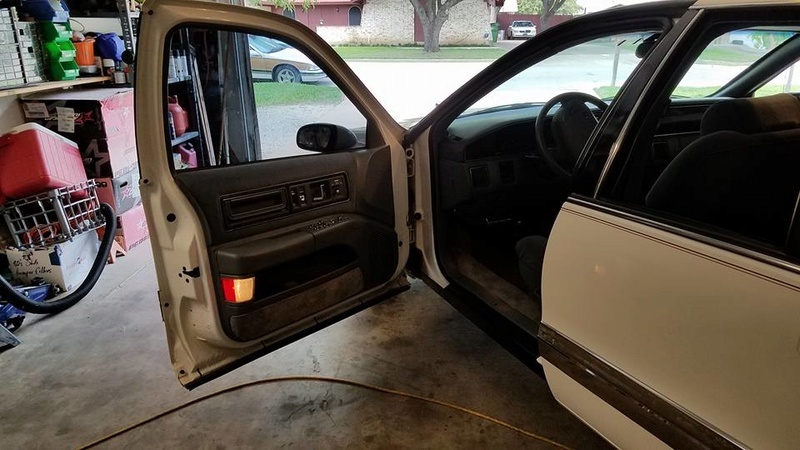 It only works when it wants too, and slapping the door brings it back to life, so it's a bad motor. ZERO FUN PROJECT, but doing a step-by-step for folks that need to do this. Hope it helps. 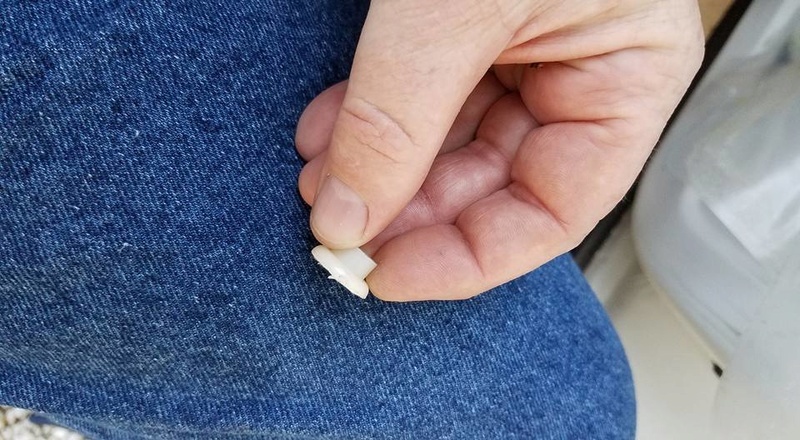 Remove two Phillips screws in the arm rest pad. 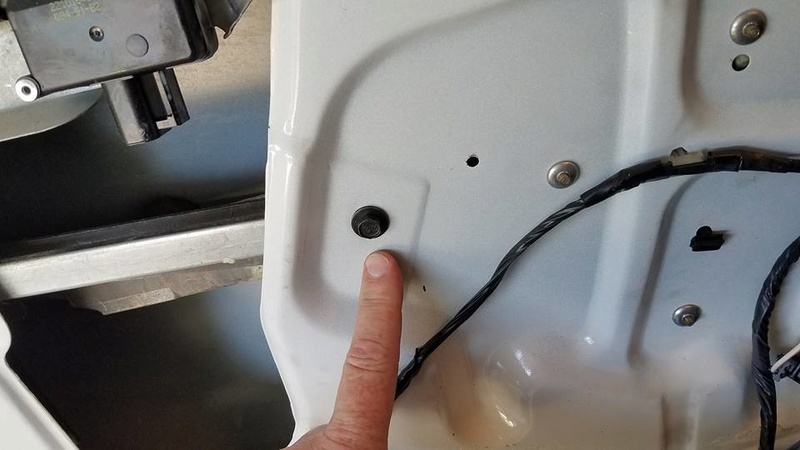 The pad will stay connected to the door panel. 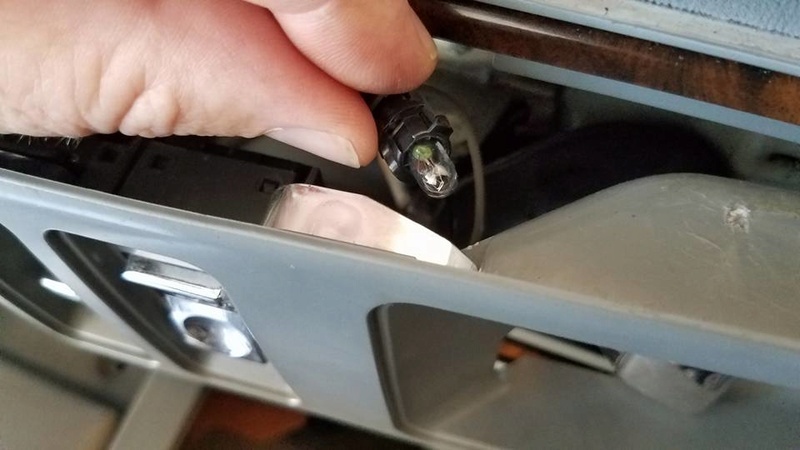 There is another Phillips head screw near the courtesy light. above the storage compartment in the panel. 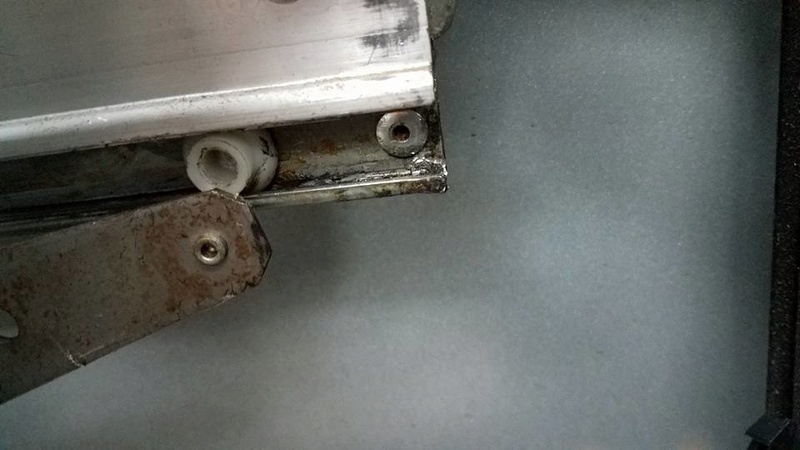 Remove the Phillips head screw in front of the door handle. And there are two large Phillips head screws hiding under the door-pull handles. 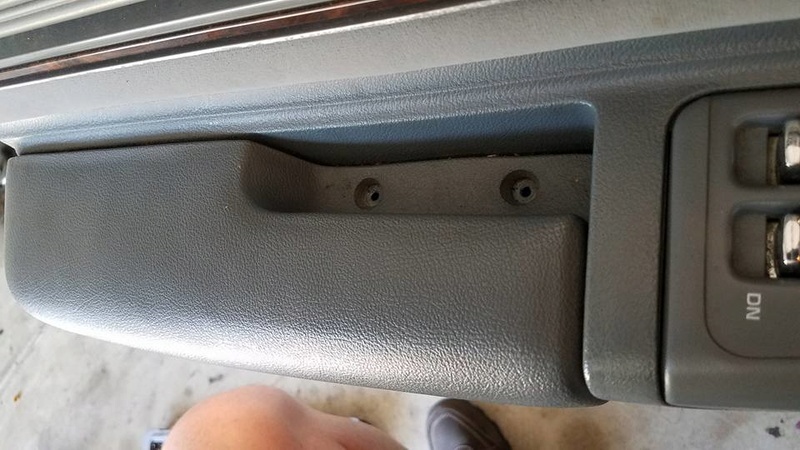 If you have a Caprice/Impala/Custom Cruiser, there are little caps that pop open on the ends of the door pulls on those cars to access these same screws. 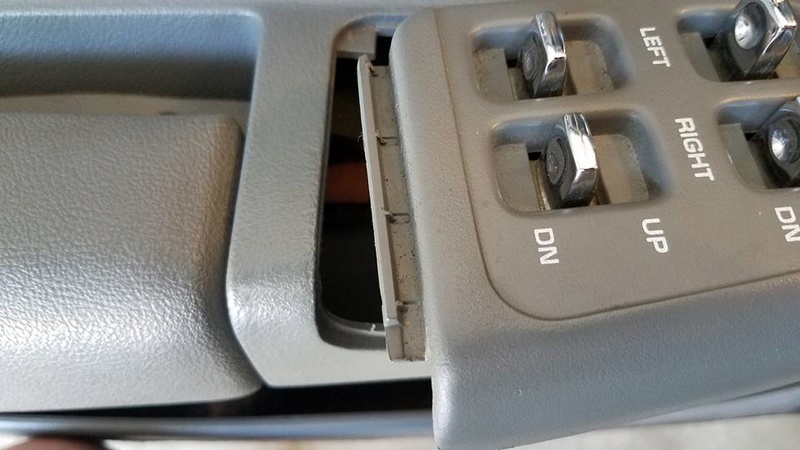 There is a spring clip under the front edge of the power window switch panel. 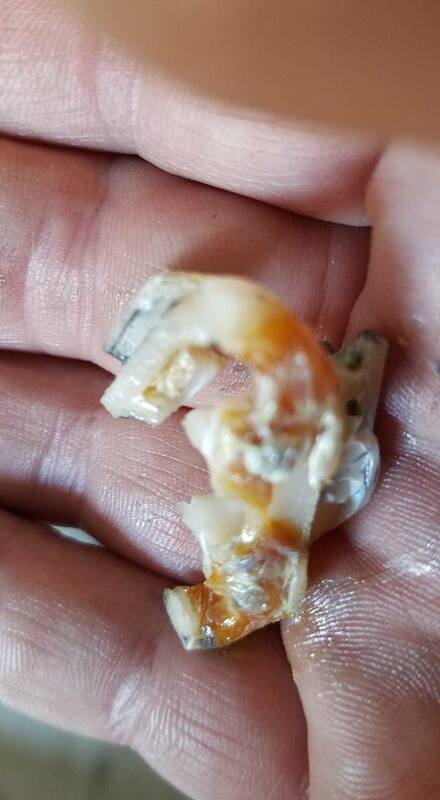 Carefully pry this up...remembering this is brittle plastic...don't force it. 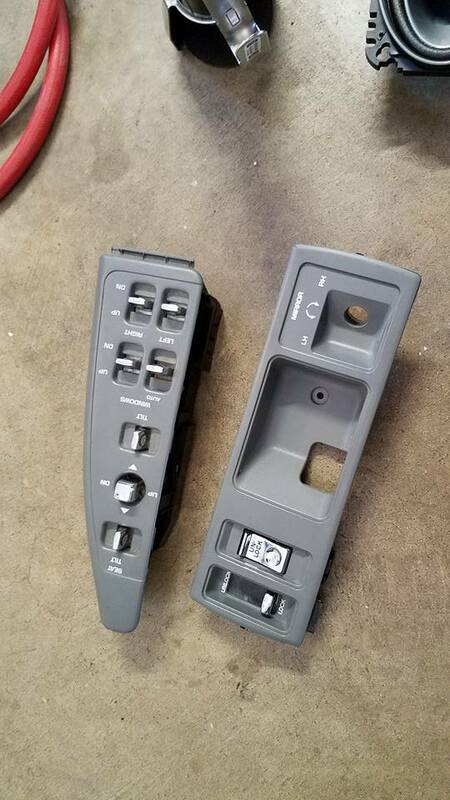 The rear of the window switch panel just unclips once the front is lifted up. Now carefully unplug the seat and window plugs. These all have little lock tabs you have to push or pull back to release, then wiggle until they unclip. 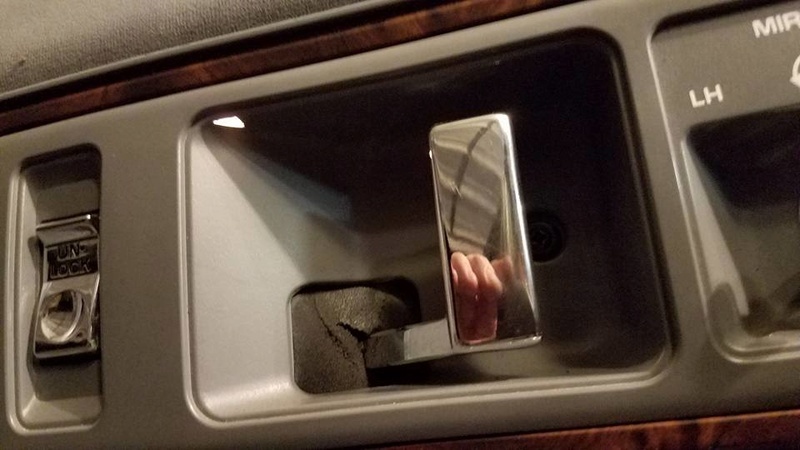 Next you need to remove the door handle bezel. 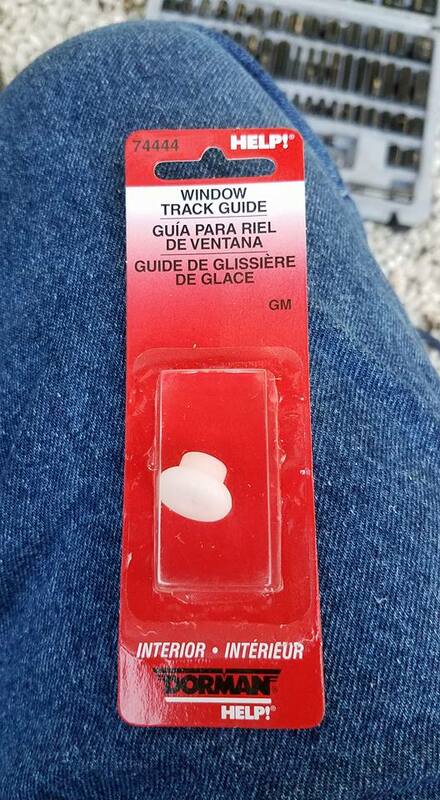 This is held to the door with clips as well. I use a small pick to carefully release these. 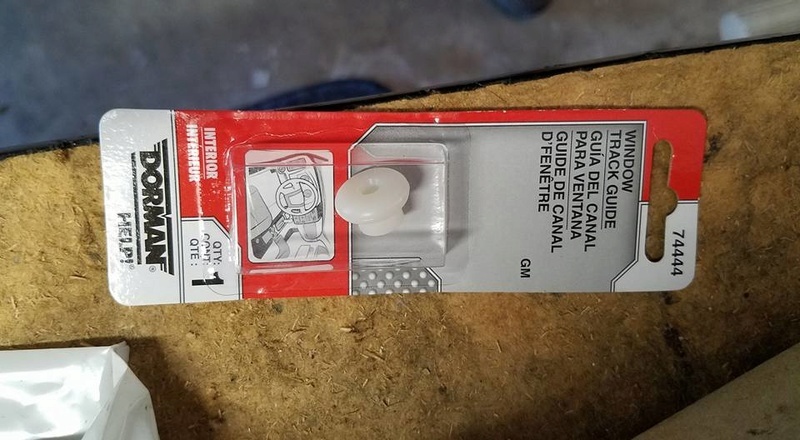 A small flathead screwdriver will work too. Again be careful with 90's-era plastic. There is a small light above the door handle. Twist this to remove the bulb from the bezel. 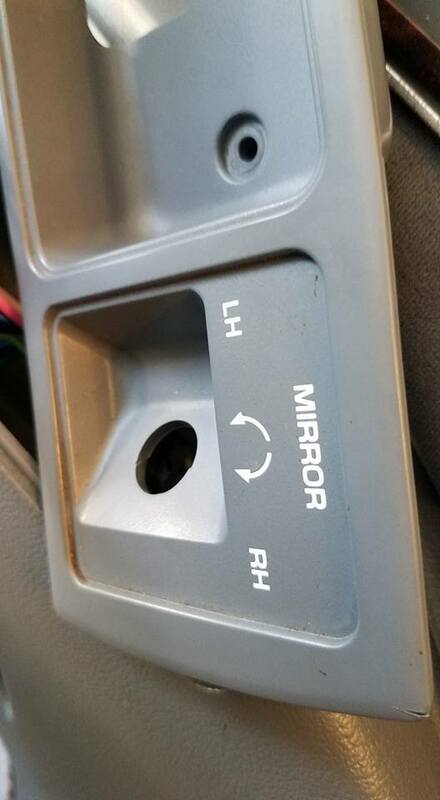 Next you have to unscrew the small Allen-head screw to release the mirror control switch. 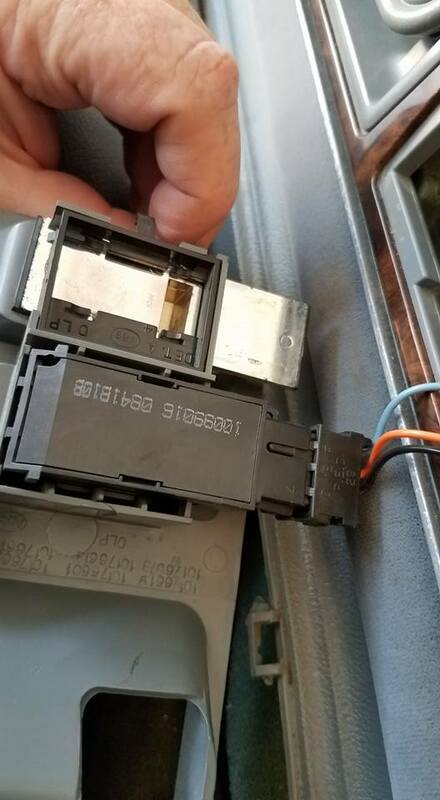 You just loosen this until you can push the switch out of the bezel...don't remove the screw totally. It's tiny. Here is the backside of the bezel showing the power lock switch that needs to be unplugged. Power window bezel and lock bezel removed. 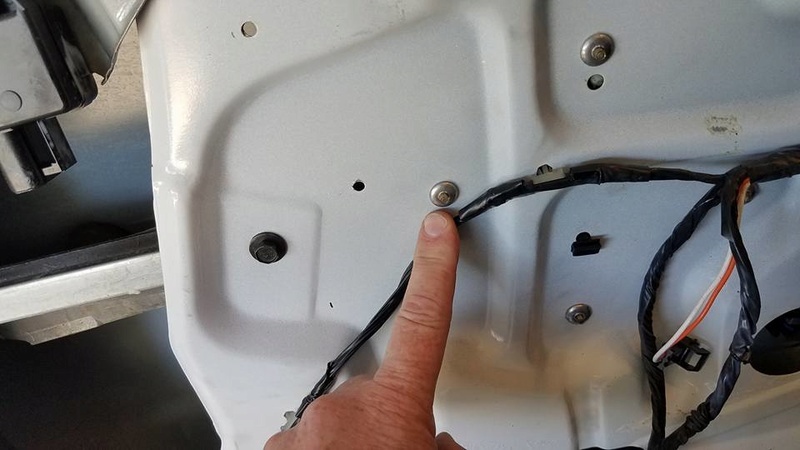 Panel unbolted. 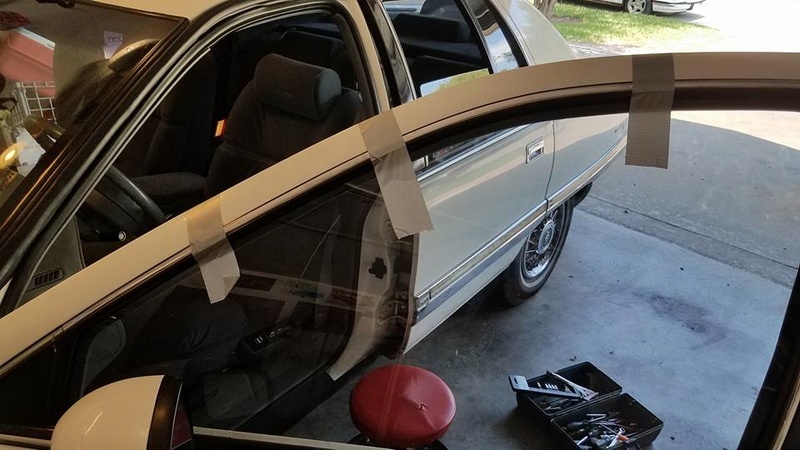 Now carefully pull the door panel off. 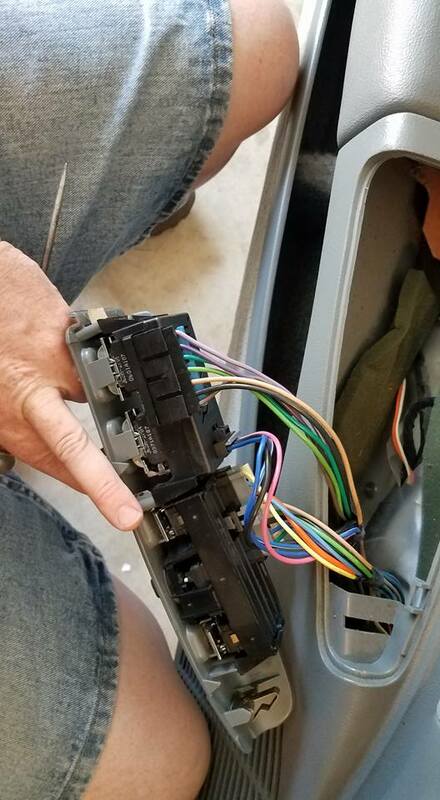 It is held on with "Christmas Tree" clips, and I tend to pull back on the panel and get my hands under it, and then carefully pull and unclip each clip but hand. 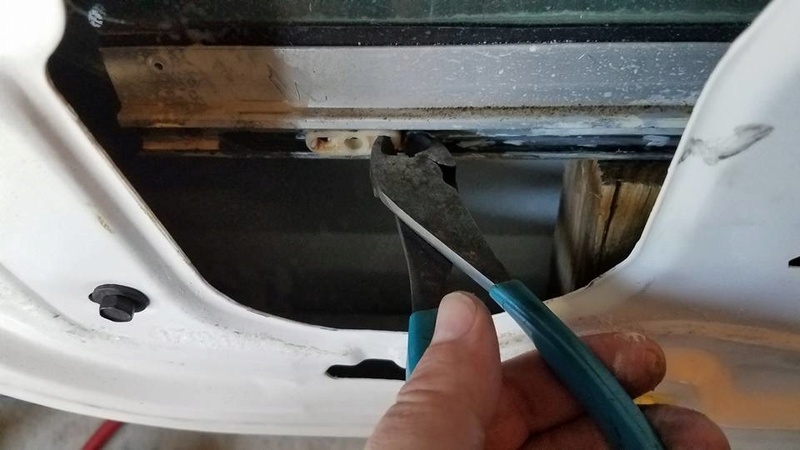 You can use a prying tool, but the door panels are plastic and brittle, and I prefer to pull off by hand. 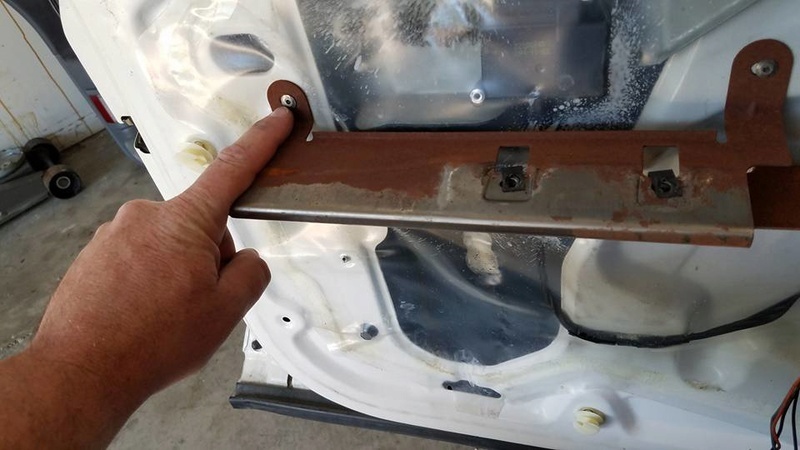 Once loose, you have to lift the upper panel off the window channel. Wiggling works. 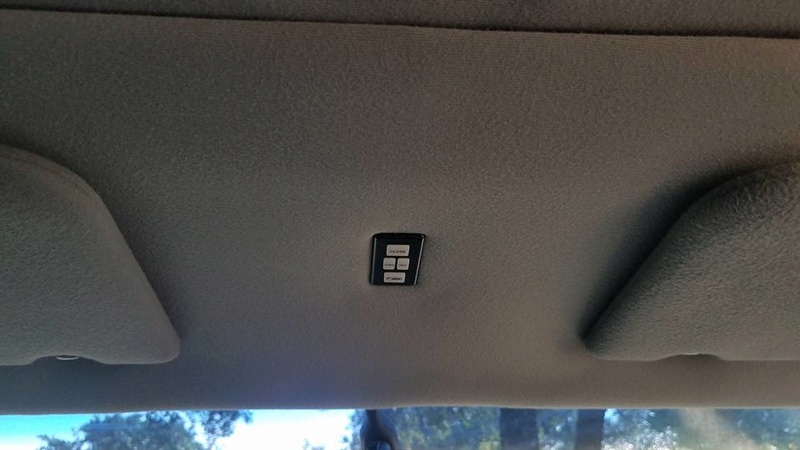 You lastly have to unplug the door panel courtesy light, and then put the panel safely out of the way. 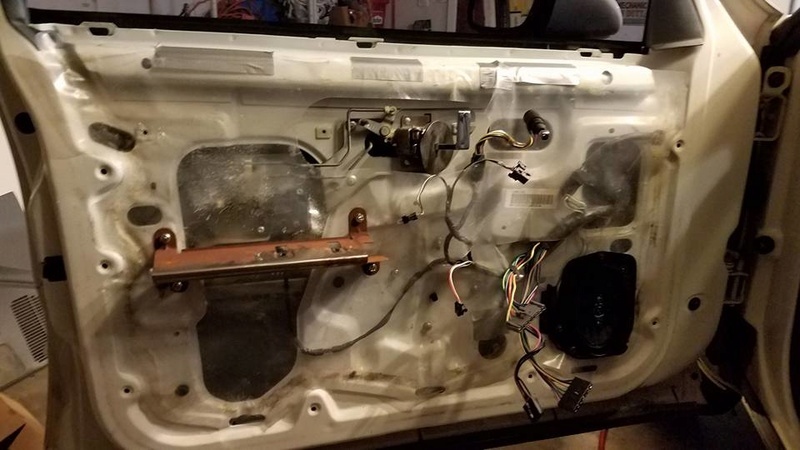 To get the window motor out, the entire regulator has to be removed from the doors. 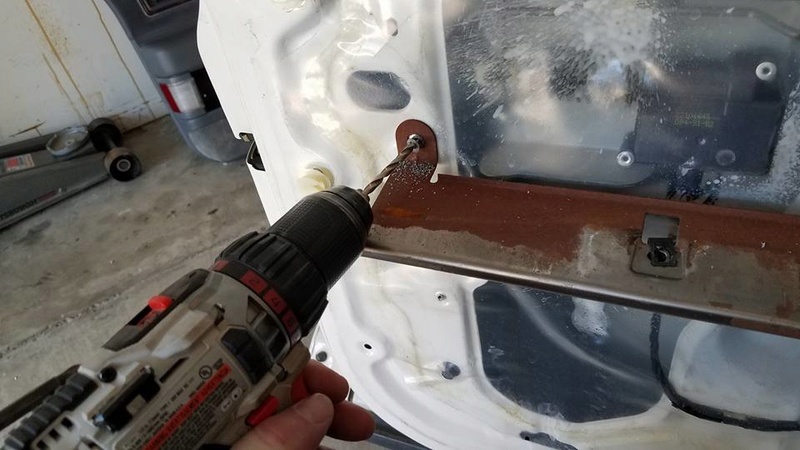 I start by drilling out the four rivets holding the armrest support to the door. Some folks say they can get the regulator out without removing this piece...but they are more talented than me I guess...or have much smaller hands. 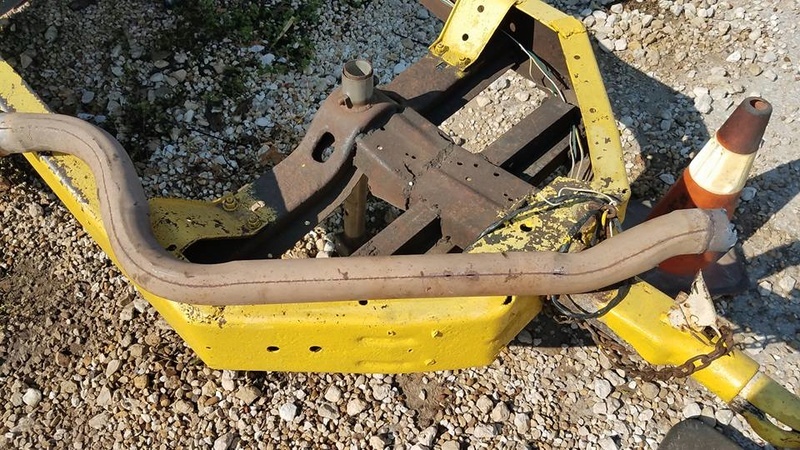 There are two slider rails that make up the window regulator. 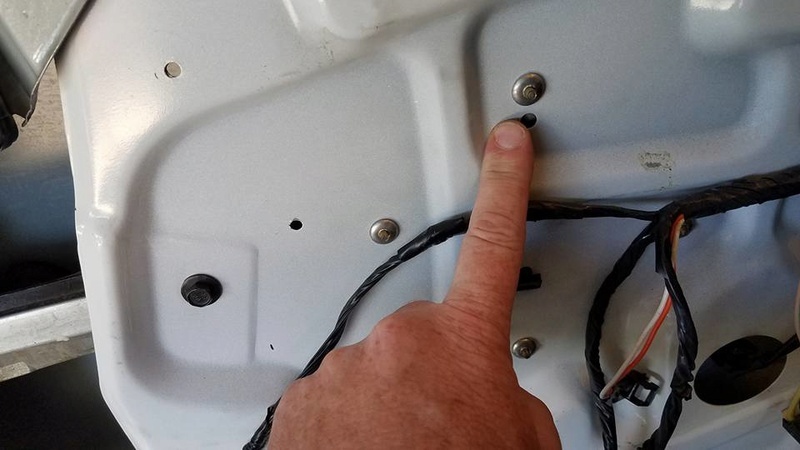 The outer one is mounted to the door with two bolts just below the power lock actuator. 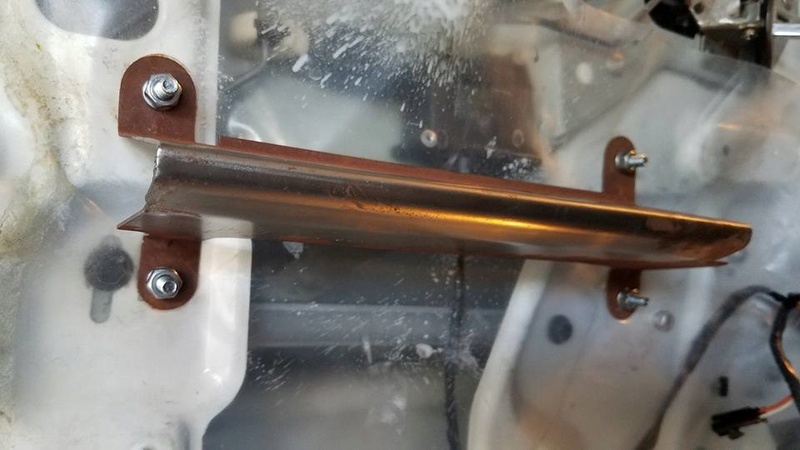 Unbolt both and let the rail fall down into the door. 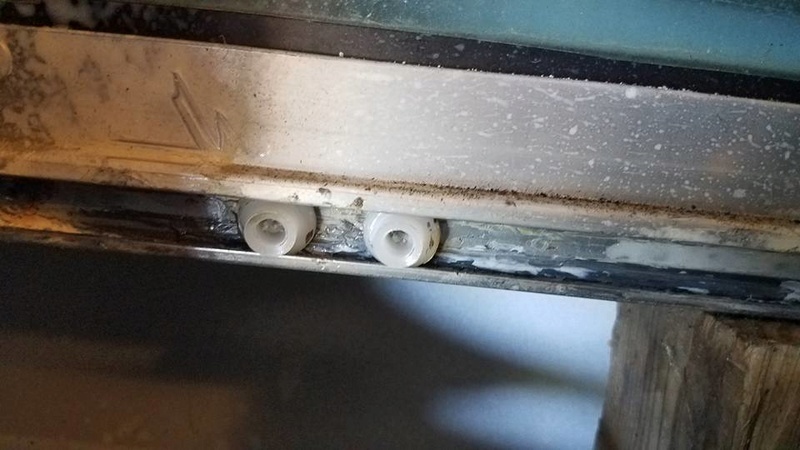 Before drilling out the rivets holding the window motor and actuator, you need to unclip the mounting studs from the window sliders in the rails, and then tape the window up so you can work. Sorry, no pics of me prying the roller balls out of the sliders, but take your time...they will pop out. Here are the two sliders in the inside regulator rail. 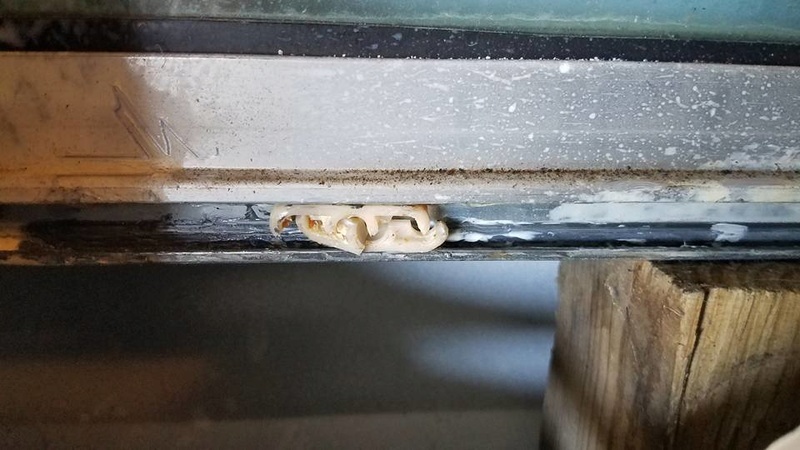 I have a chunk of wood supporting the window in the door so I can work. Amazingly, when I popped the actuator pivot balls out of these oval sliders...the ORIGINAL oval slider, they didn't break. 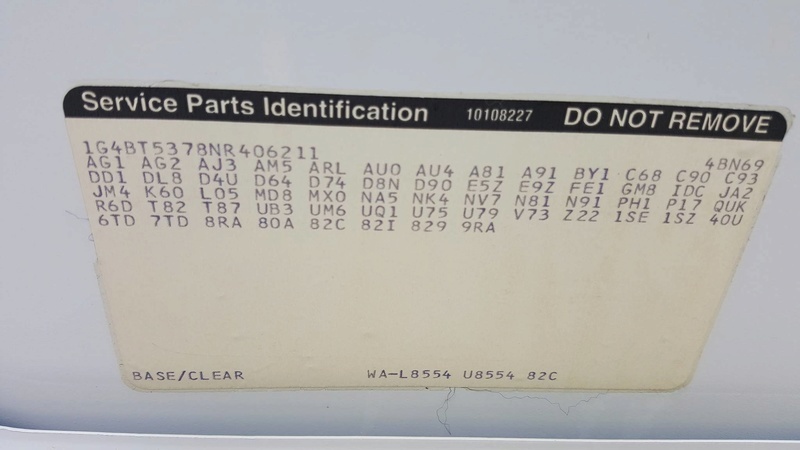 I'm still cutting these out...because they would most-likely break on re-installation...and are a problem waiting to happen. To easily remove the stock sliders, I use cutting pliers and snip them into two pieces, and then needle-nose pliers to pull them out. The next part is a lot of fun. 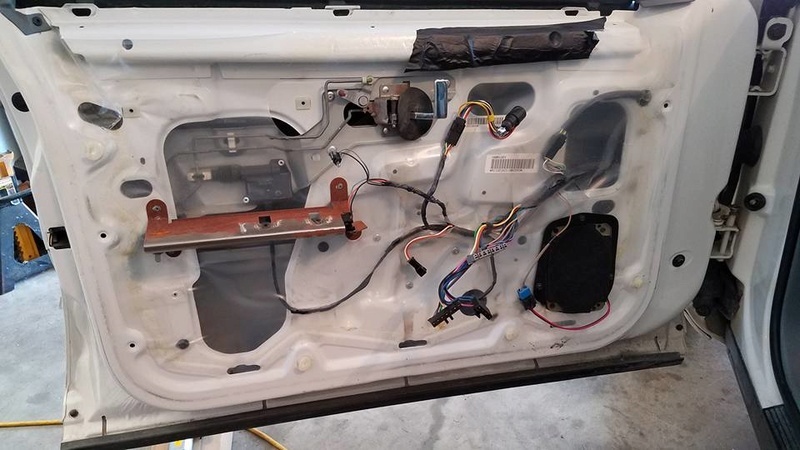 The actual power window motor and window regulator are riveted to the door with four rivets, here in the middle of the door. 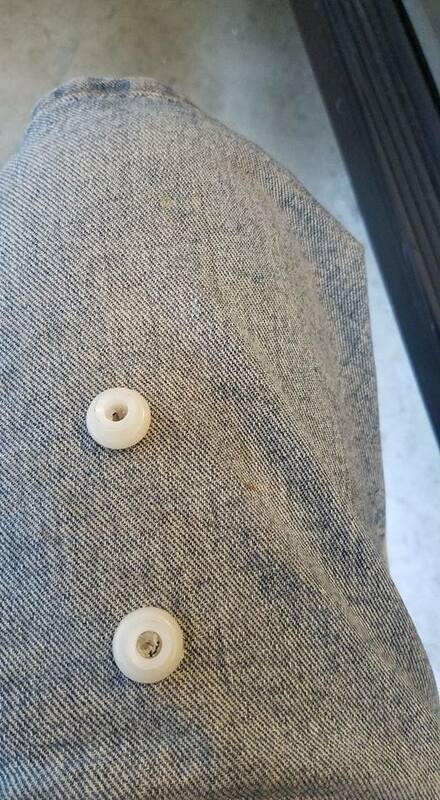 I use a cit-off "whizz-wheel" to cut off the center studs, and then drill the rivets out. Regulator assembly and motor carefully removed from the door. Window regulator assembly removed here. 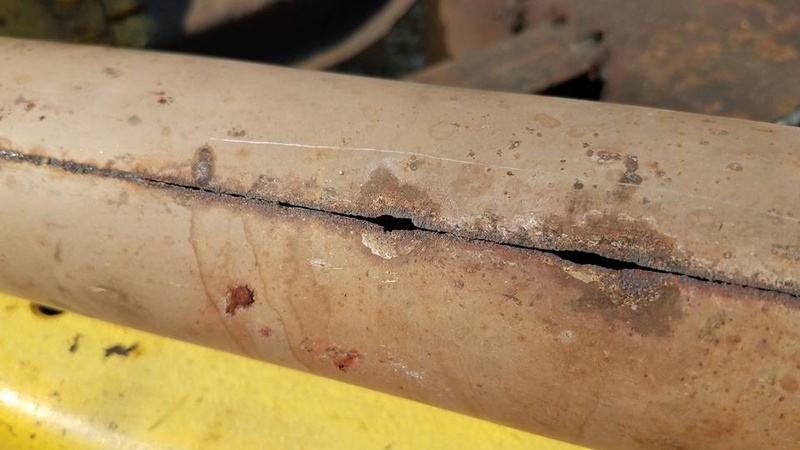 You take it out through that larger hole under the power lock actuator. 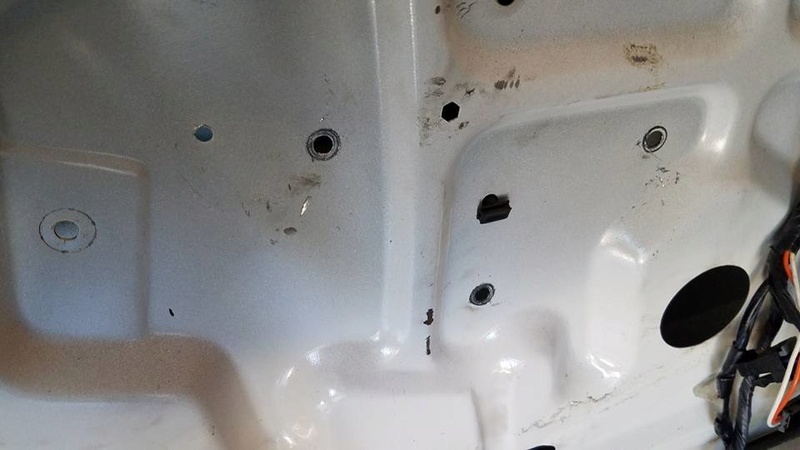 Rivets drilled out where regulator was mounted. 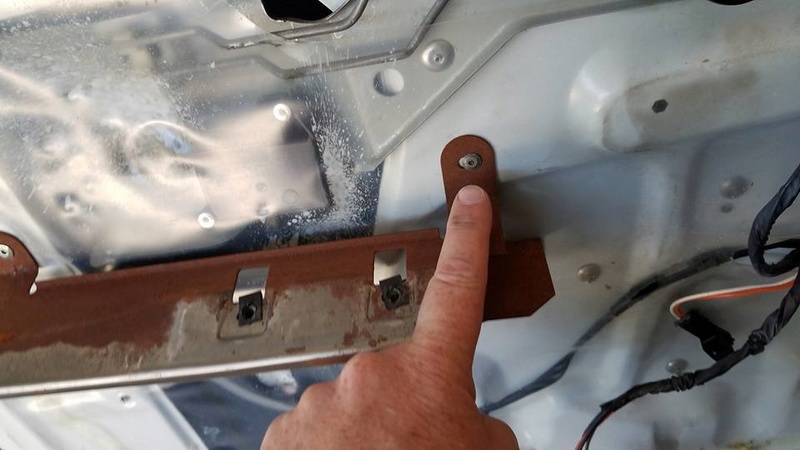 Make sure to reach into the door and pull out any broken pieces of rivets and such to prevent rattles. About to remove the window motor from the regulator. IMPORTANT, the regulator is under tension from that center spring. 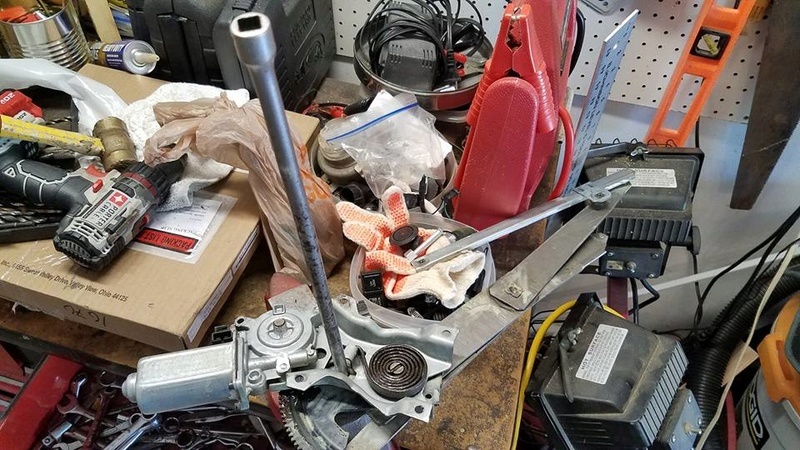 DO NOT remove the motor until you have the regulator in a vice or clamped! DANGER. It WILL snap back and can hurt you. 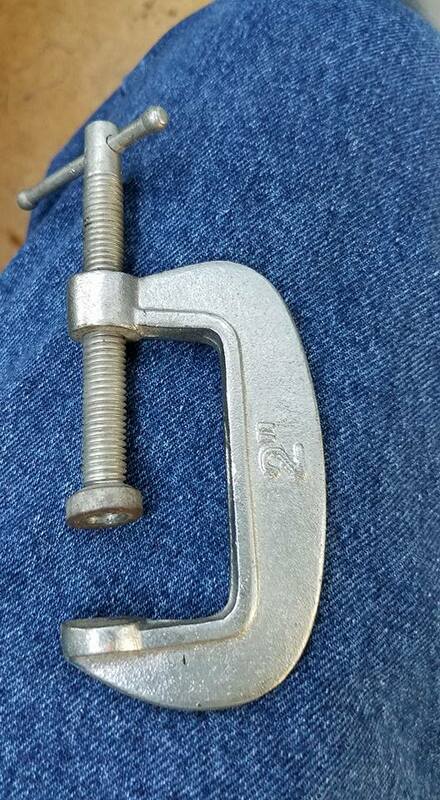 Here I have it in a vice, and have a long extension going through it as well, as an added safety precaution. The old window motor is riveted to the regulator. I use my cut-off whizz-wheel to slice the backs off the rivets and then tap the rivets out with a punch and a hammer. 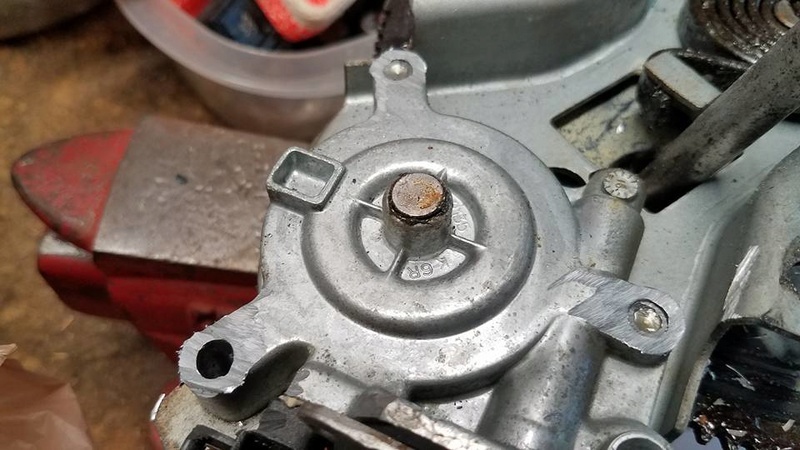 A friend is helpful here, to hold the regulator and move it around on the spring to get all the rivets out and replace them with the new bolts. 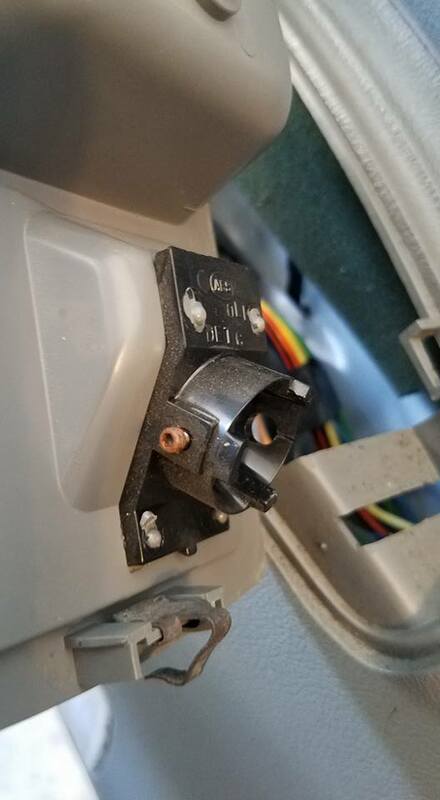 Some replacement window motors come with attachment bolts. 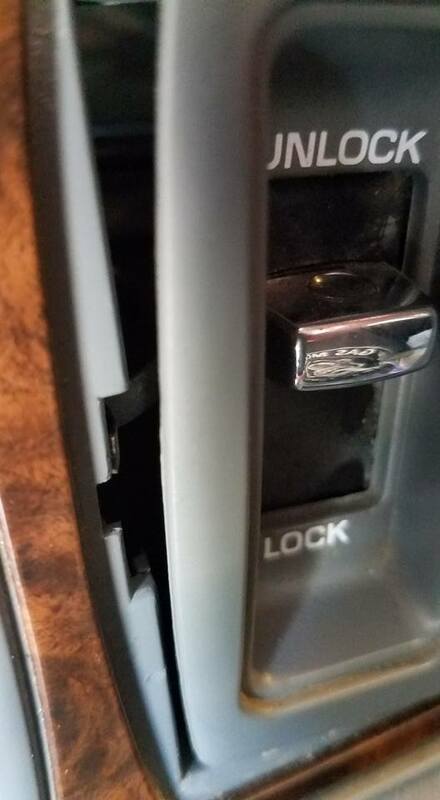 The one I got...didn't...thanks Rock Auto. 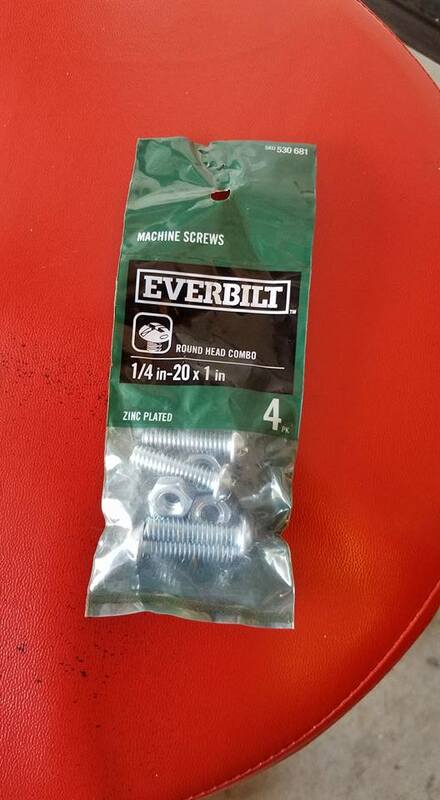 No big deal, ran to Home Depot for these screws. 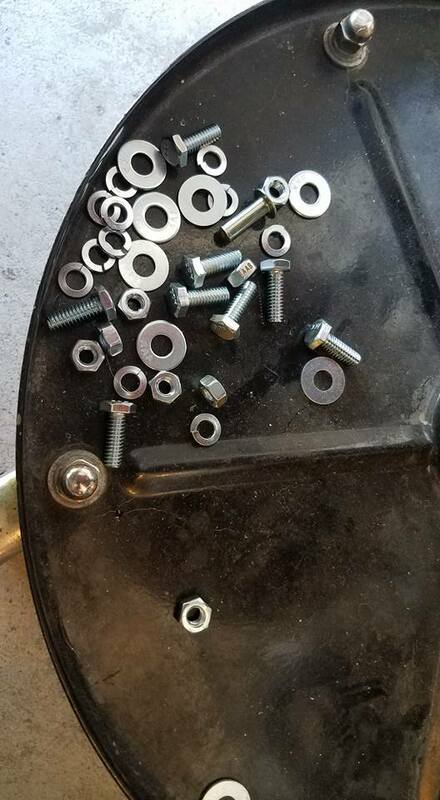 I also used lock-washers, not shown. 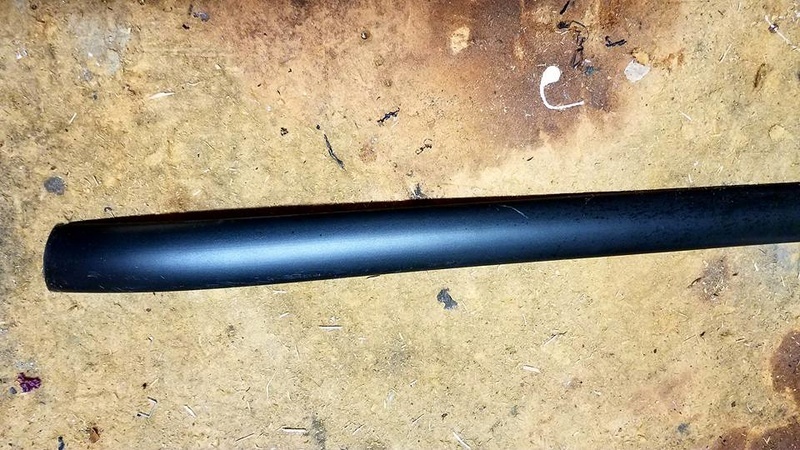 NOTE, once I installed the motor to the regulator, I again used my cutting-wheel/whizz-wheel, to grind the curved ends of the screw heads down some to clear the pivot gear on the regulator. Next I got new round window-track sliders, Dorman 74444, and I used my grinder to sand the thickness of the circles about in half, for an easier installation into the slider rails and to make sure they don't bind once installed. 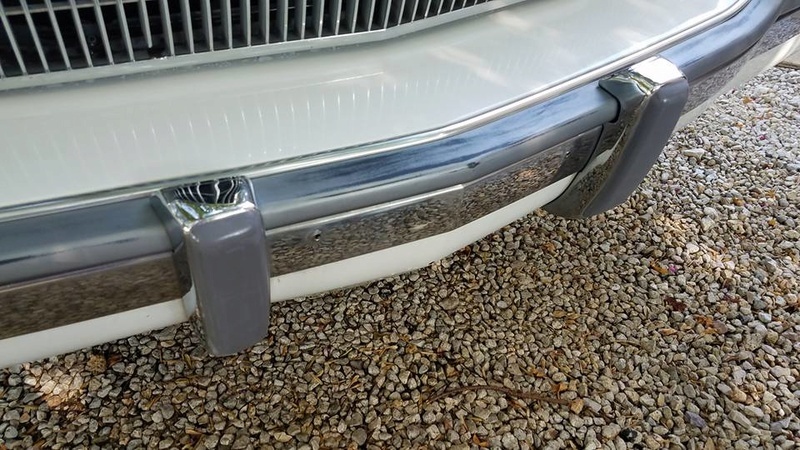 New round sliders installed in channel rails. 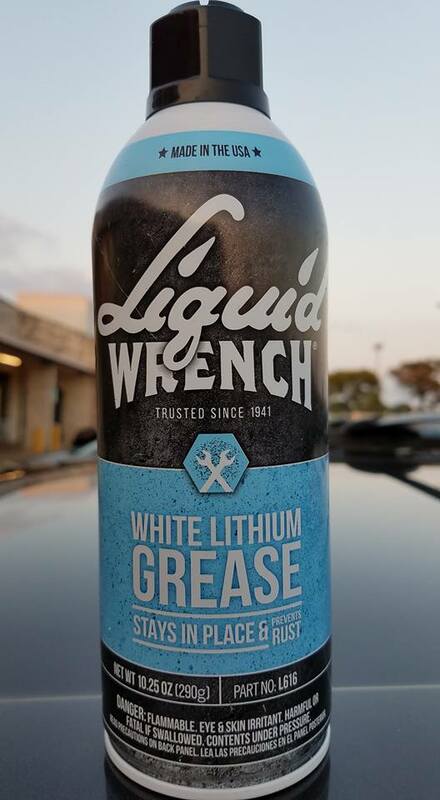 You will want to soak the rails in white lithium grease. Use the small clamp shown earlier in this album to press the pivot balls on the regulator arms into the new round sliders. 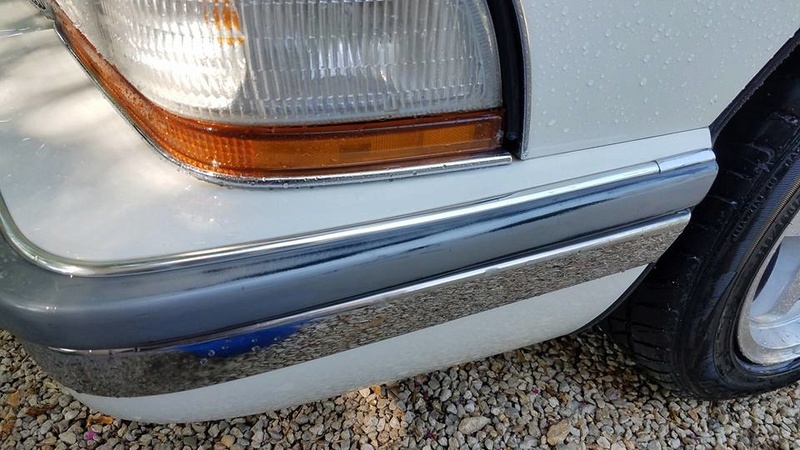 These round sliders are a permanent fix for 91-96 GM B-body cars. 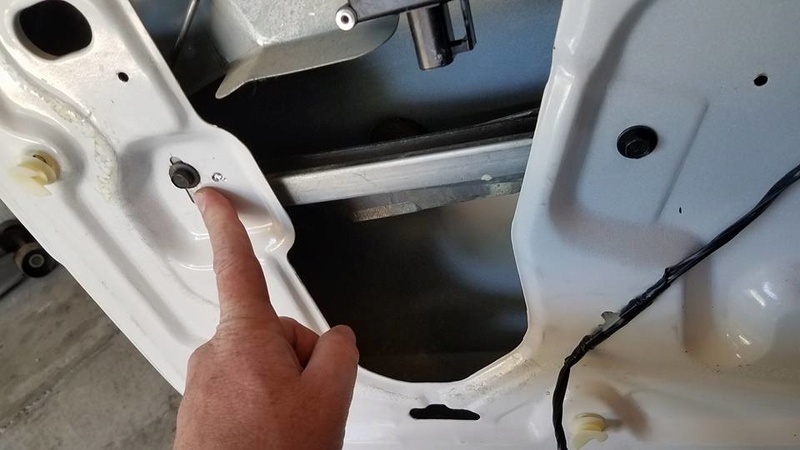 I don't like dealing with rivets, so to re-install the regulator assembly and arm rest mount, I use 1/4 inch bolts, with round washers and lock washers, You will need a total of 11 bolts to do this job. 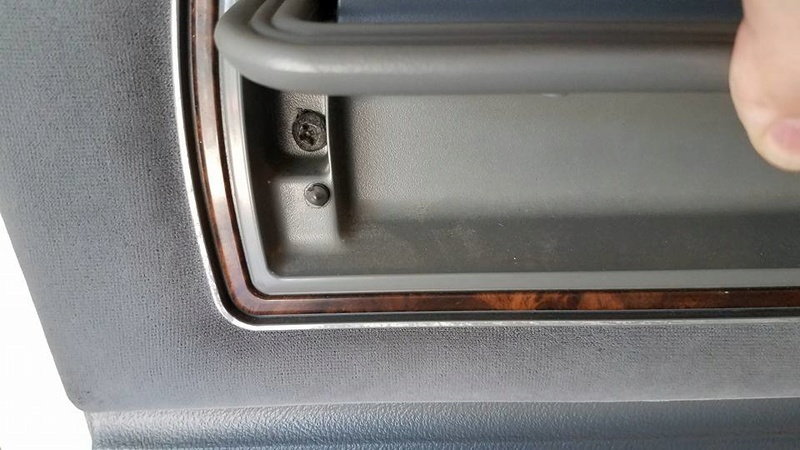 You will want to re-stick/tape the plastic dust cover on the door panel before installing the arm rest support. Reach up from under the plastic to install the bolts. 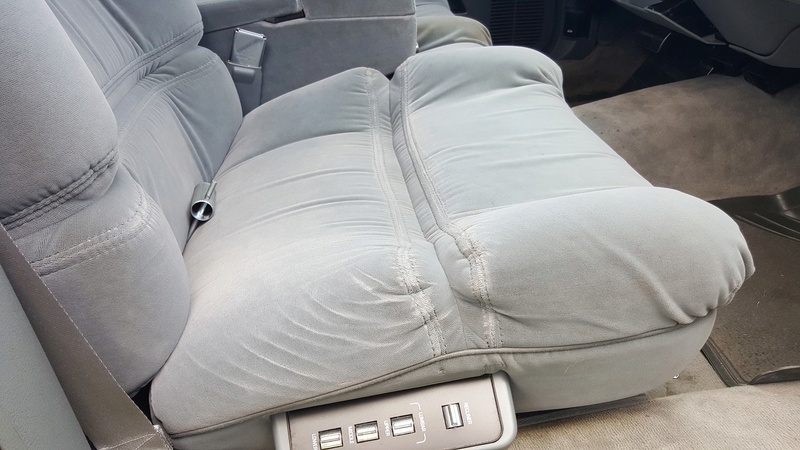 The arm rest support mounts over the plastic dust cover. I then cut off the excess bolts using my whizz-wheel. 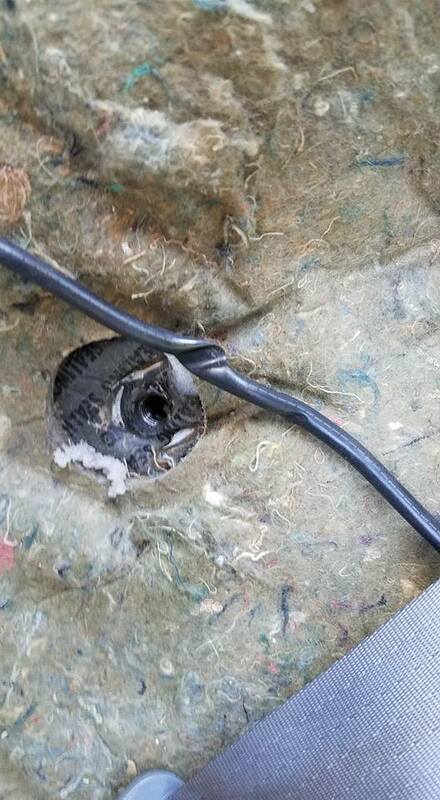 Carefully re-route the wiring through the plastic dust cover, and then re-install the speaker. 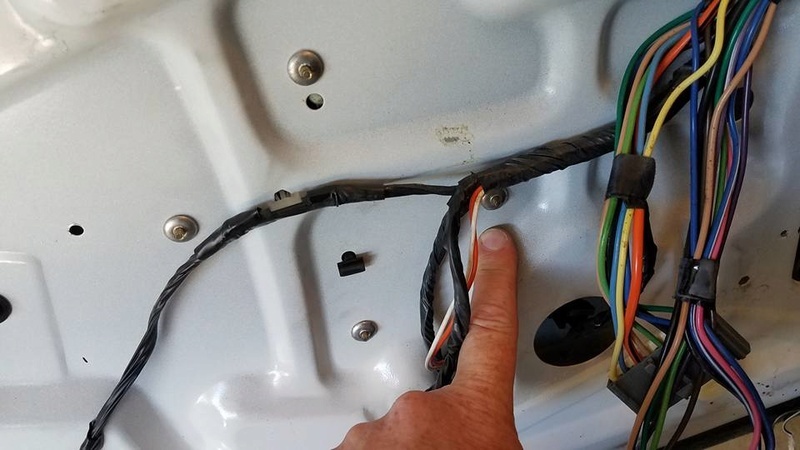 Don't forget to plug in the new power window motor and the power lock actuator. 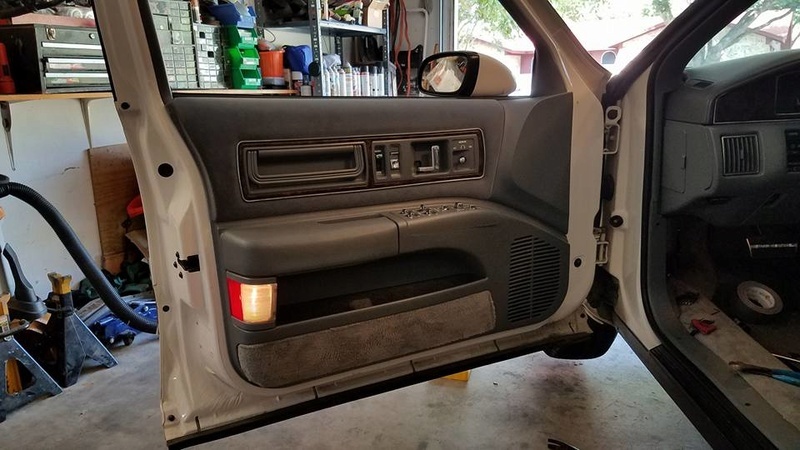 About to re-install the door panel. Wires run, speaker installed, all new bolts trimmed as needed, and tested operation of all electrics. 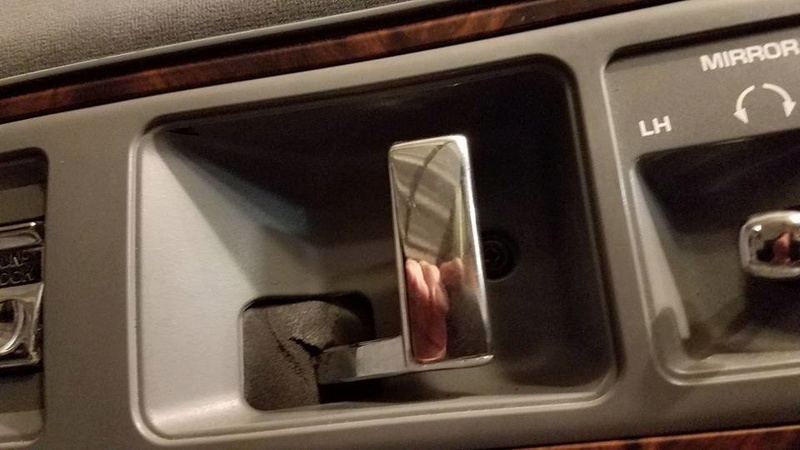 Once again, I install new Christmas Tree clips from Napa on the door panel before snapping it on. Want no loose panels, and these really only hold tight the first use. 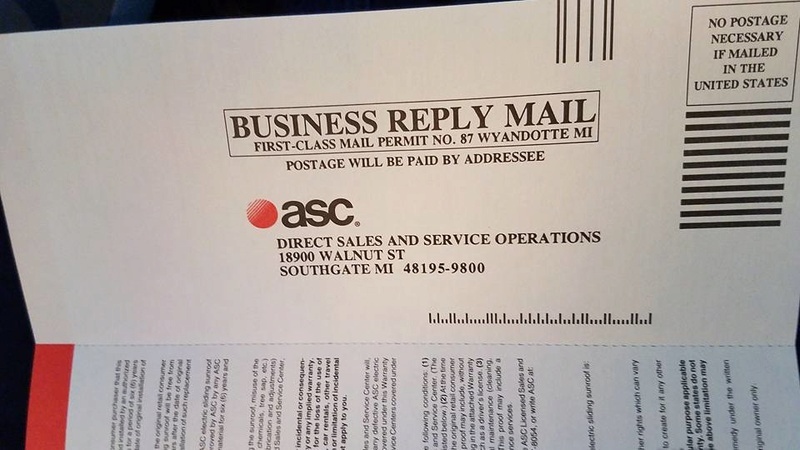 Wrth $5 to get a new package. 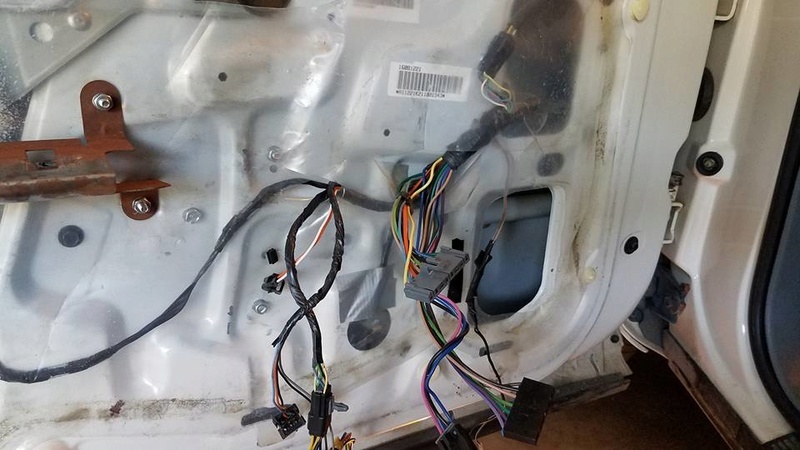 Door panel re-installed and wires run to correct locations. 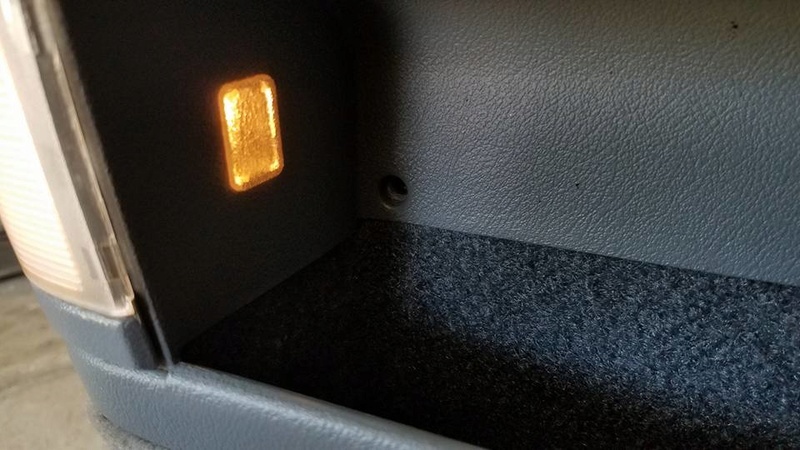 Note, now is a good time (before installing this bezel) to check/replace the tiny bulb above the door handle that illuminates with the headlights to shine on the power window switches below. Dark here, see next pic with new bulb lit and working. DONE. 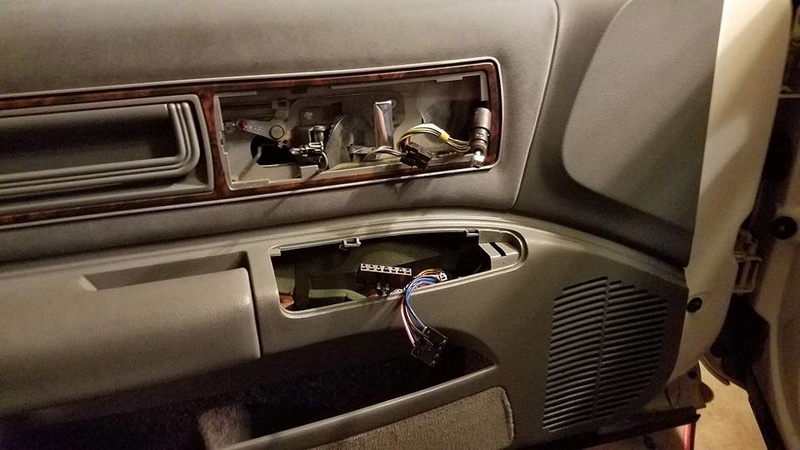 Panel is tight, window works like new. NOT a fun job, but can be done in an afternoon if you take your time and think it through. Hope the step-by-step helps someone else! 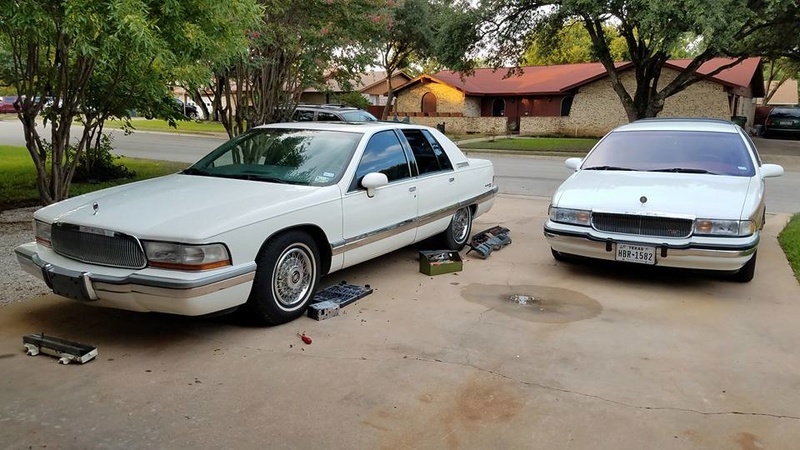 While I worked on replacing the driver's front power window motor, my son Eddie jacked the car up, painted the brake drums and inner fenders black, and installed the gorgeous refurbished Impala SS wheels with Buick center caps and brand new 235/55/17 tires. 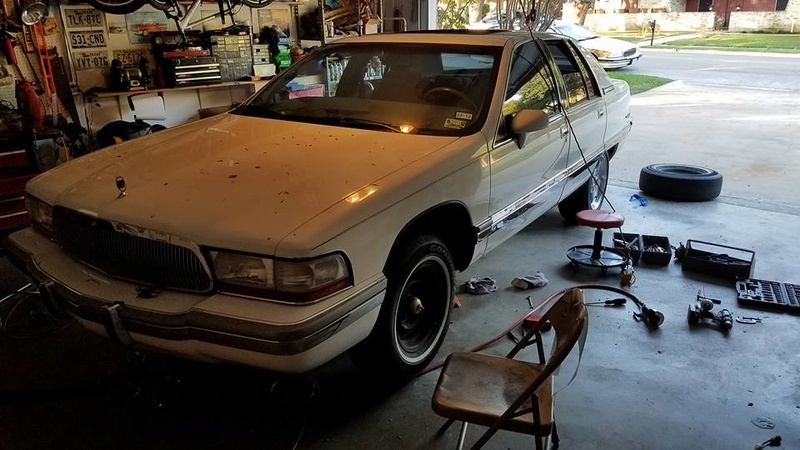 9/4/17 - Made some good headway on the 92 Roadmaster Sedan project this holiday weekend. Headliner done, exhaust done, window motor replaced, and new wheels and tires installed. 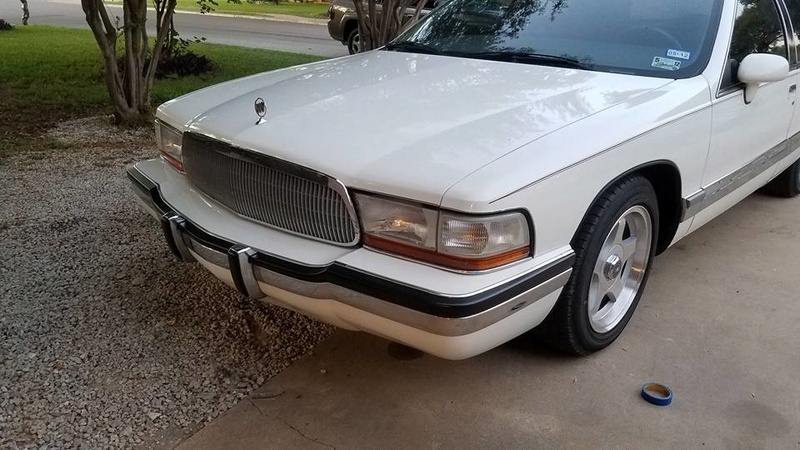 Still have to do the radiator flush, thermostat and idler pulley, and need to paint the bumper trim and install the new side moldings, and car still needs a top-to-bottom detailing, but it's looking a lot better now and it drives TONS better with new tires, shocks, and great air conditioning. COMING ALONG! 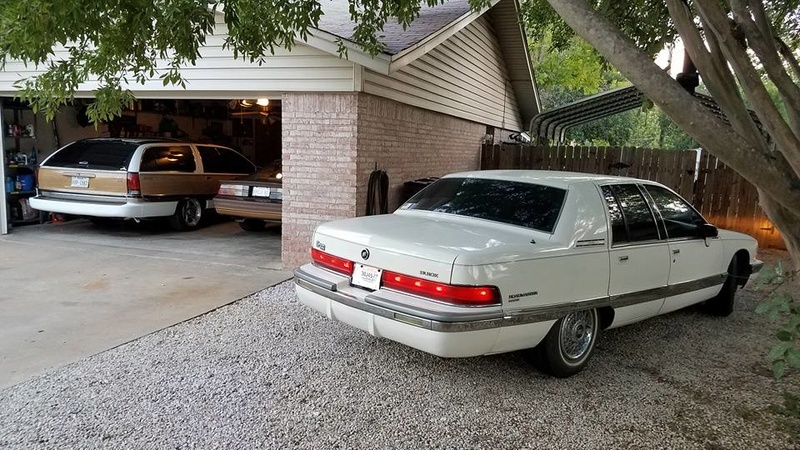 The rear-end gearing on the 92 Roadmaster Sedan is hilarious. Look at the tachometer at 80mph. Hahahahaa! This car is just geared way too high with the 2.56 axle. 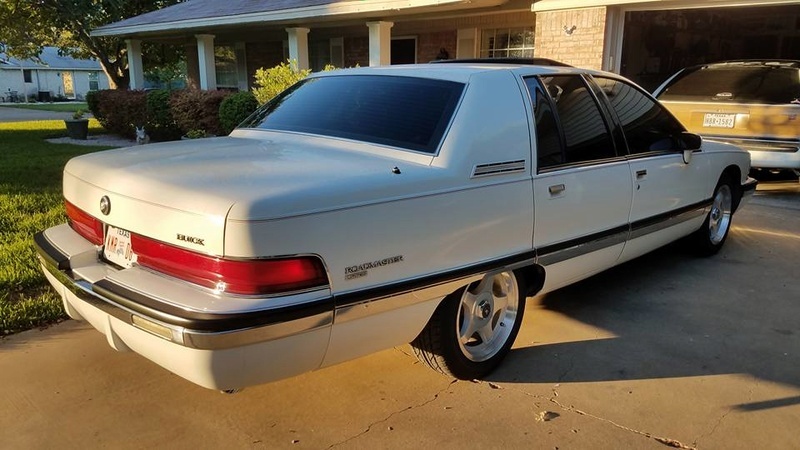 I had the same motor in my 92 Custom Cruiser, but with the 3.23 tow pack rear, and it felt like a rocket in comparison...and the transmission didn't have to downshift for every incline either. 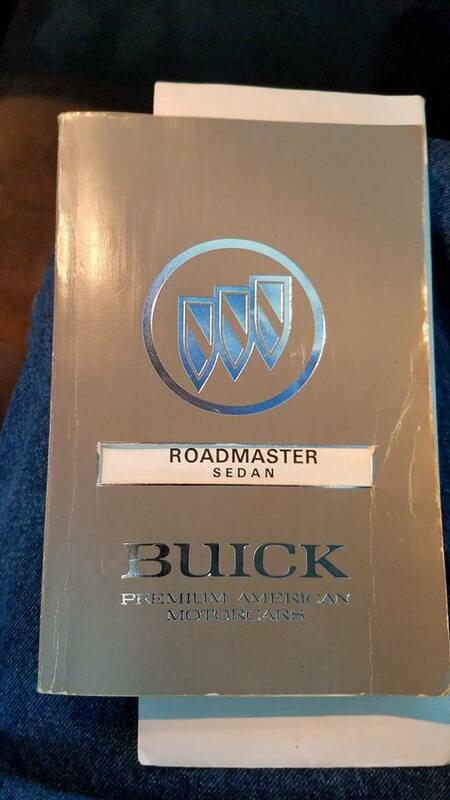 I've got 2.93s in my 96 Roadmaster Wagon...but it actually IS a rocket in comparison, ha! The wagons both turn in the low to mid 2000-rpm range at 80mph. This sedan is just hilarious...and additional forward motion on the highway requires a downshift before anything happens. 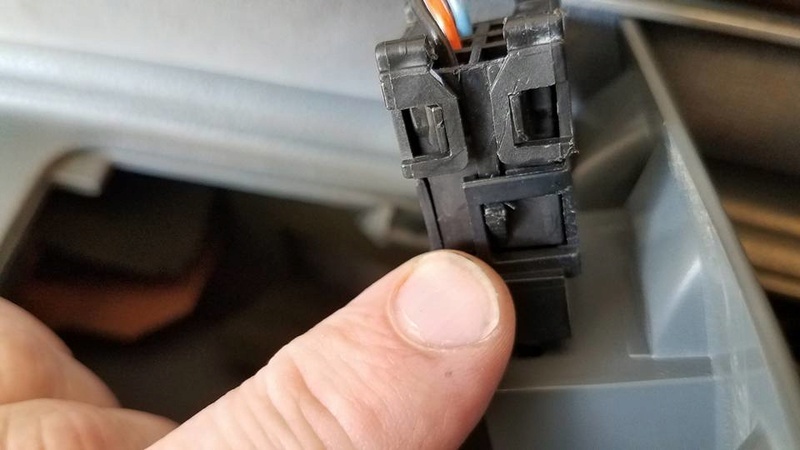 It's no wonder the 2.56 cars lose transmissions much sooner than tow-pack cars. 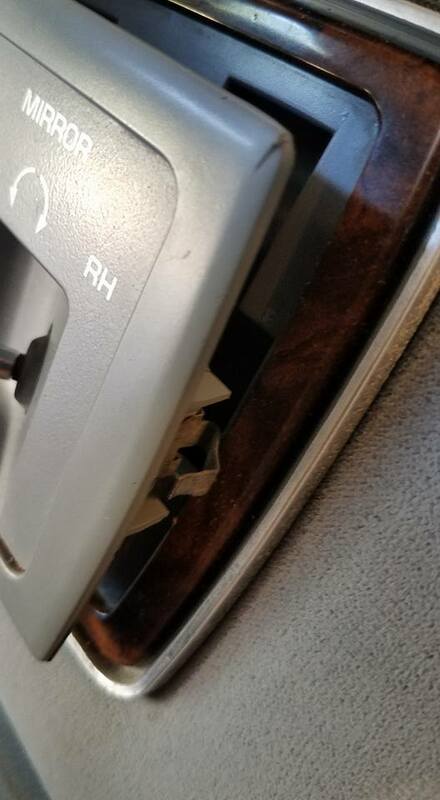 That transmission is constantly working against those gears. 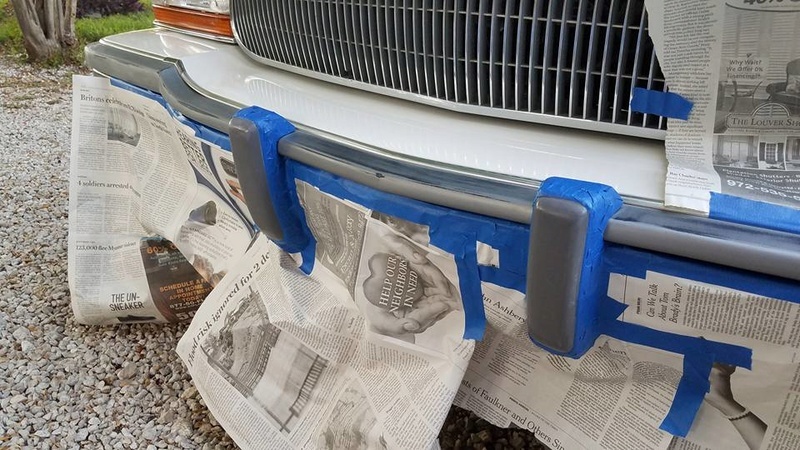 9/6/17- Evening project, wet-sanding faded silver bumper trim for new paint. Changing color to black. 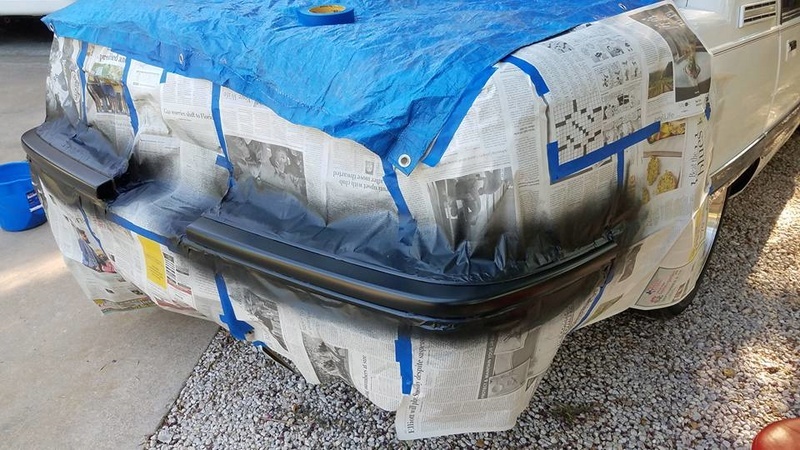 9/6/17 - Masking the Roadmaster Sedan for black bumper trim paint. 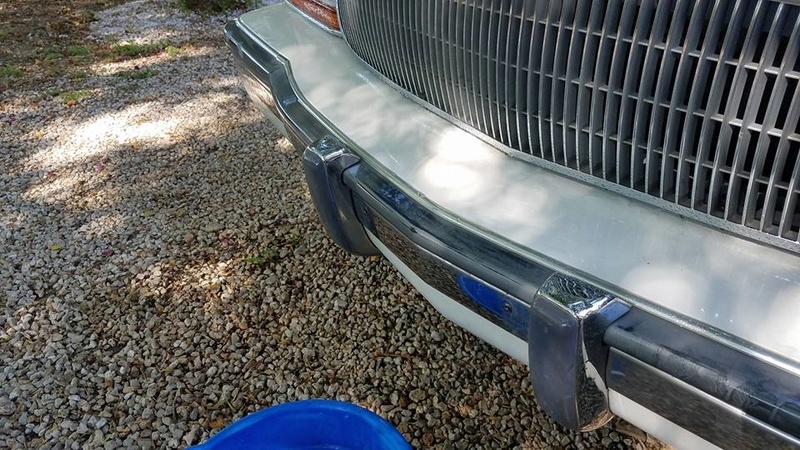 9/6/17 - Painting the Roadmaster Sedan bumper trim black. 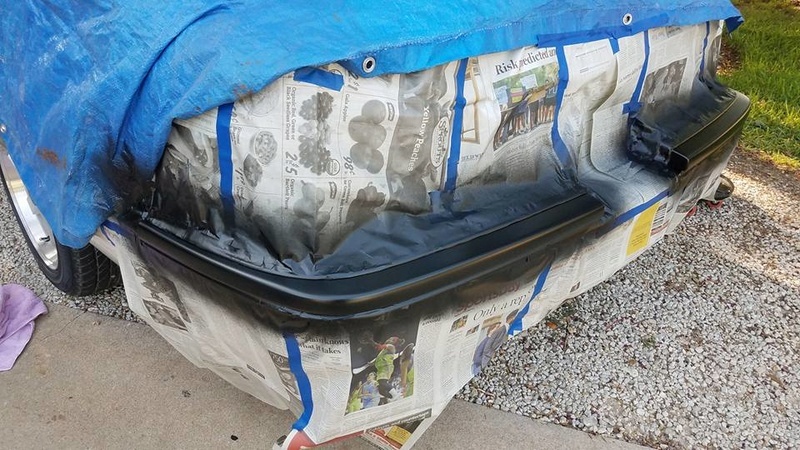 9/6/17 - Freshly-painted black bumper trim. 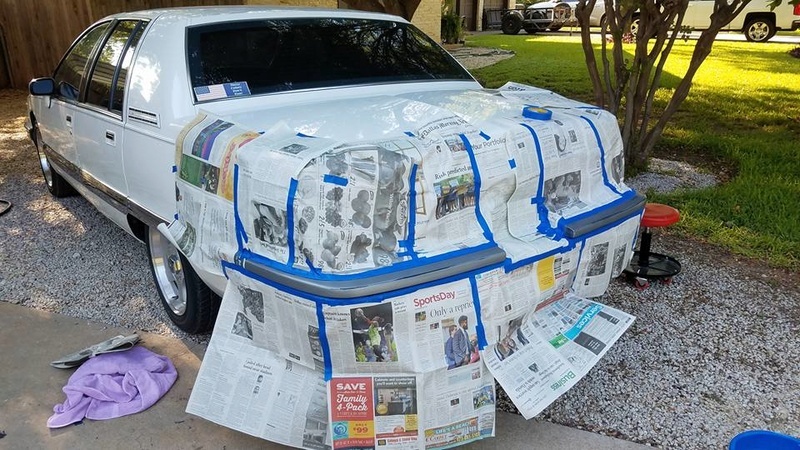 Just unmasked the car. LOVE the black so much better than the silver! 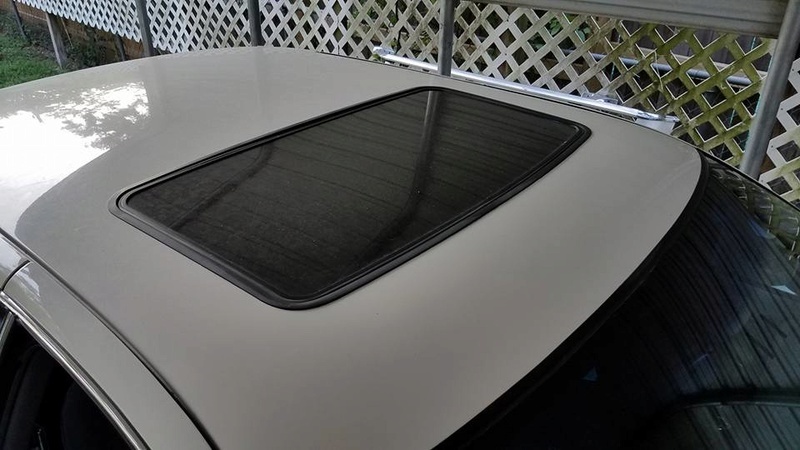 Next project is to install the new black bodyside trim. 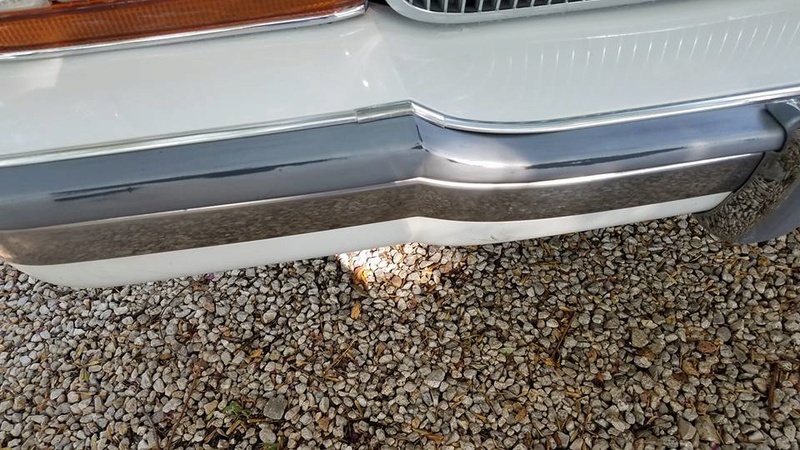 9/6/17 - New bodyside trim for the Roadmaster Sedan. 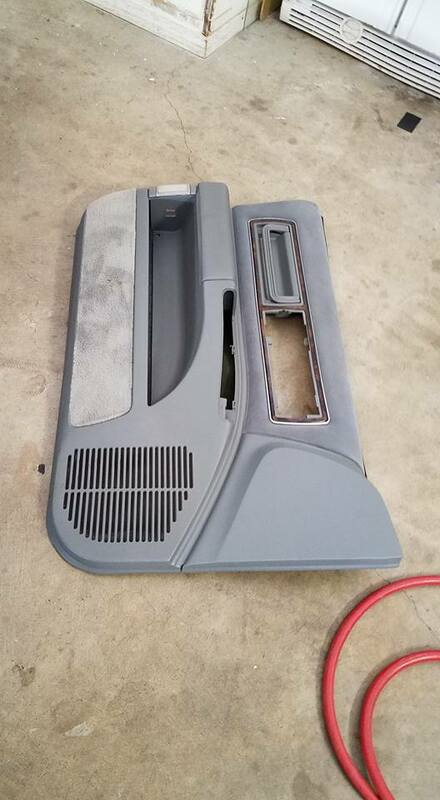 ES1382402-S Body Trim Molding. This stuff is great! Perfect size, cuts easy and not heavy like the stock trim was. 9/7/17 - First daytime views with black-painted bumper and bodyside trim done. Car looks 1000-percent better! 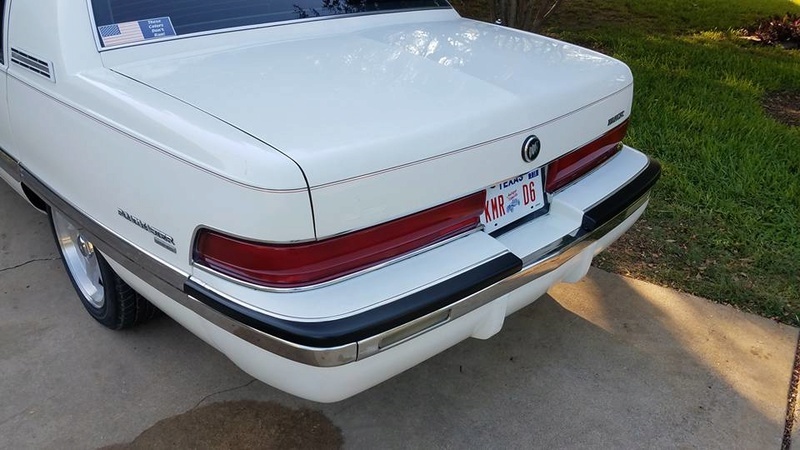 Also removed the dealer emblem from the trunk lid, and the stickers from the front and rear windows. Still need to compound and wax the car, but MAN it's looking so much better!! Can't wait to see it waxed. Nice old car,....LS swap ftw! NO JOKE! 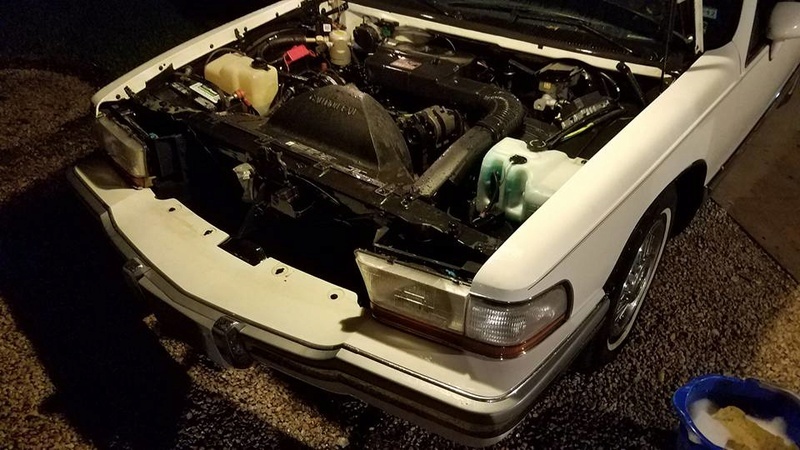 This car is BEGGING for an LS swap. 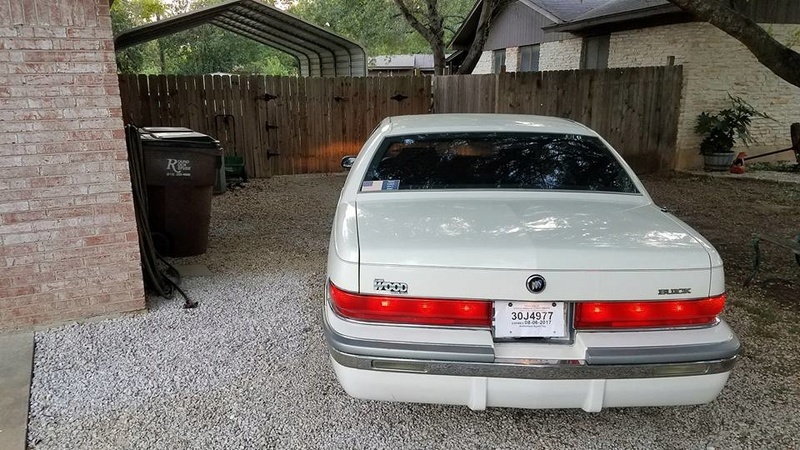 The 350 in it actually runs great...as it should with just 80K miles, but it has the hilarious 2.55 rear gears, so it is a DOG around town. 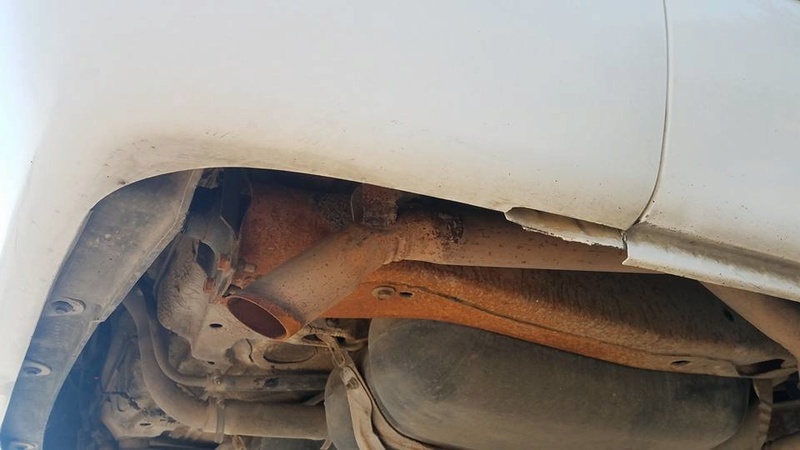 It WILL bury the speedo on the highway now however since I replaced the clogged muffler. 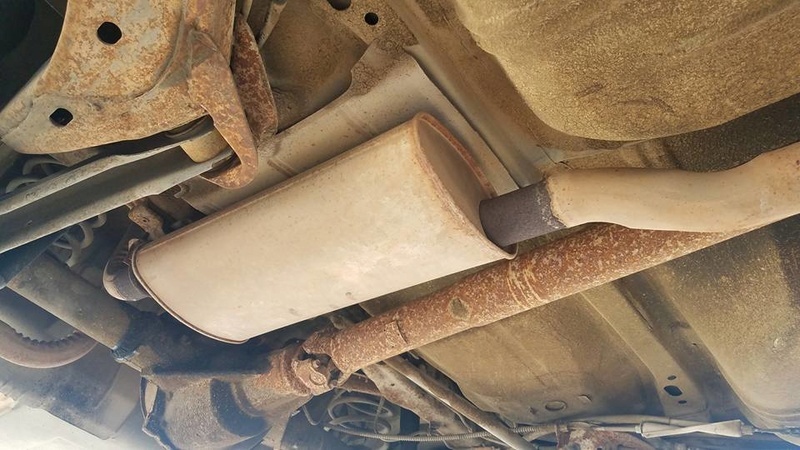 That really is amazing what a change the muffler made. It doesn't feel much different around town, but before, just getting up the the 75-80mph speed limits on the highways here was a struggle for the car. Now, at about 50mph the car just keeps pulling. Below 50 it feels like the parking brake is on compared to my '96 Roady Wagon. Ha! But yes, this would be a fantastic car to put an LS in. No vinyl top, power sunroof, super-solid body and interior. It's a great starting point for a MONSTER. Ha!